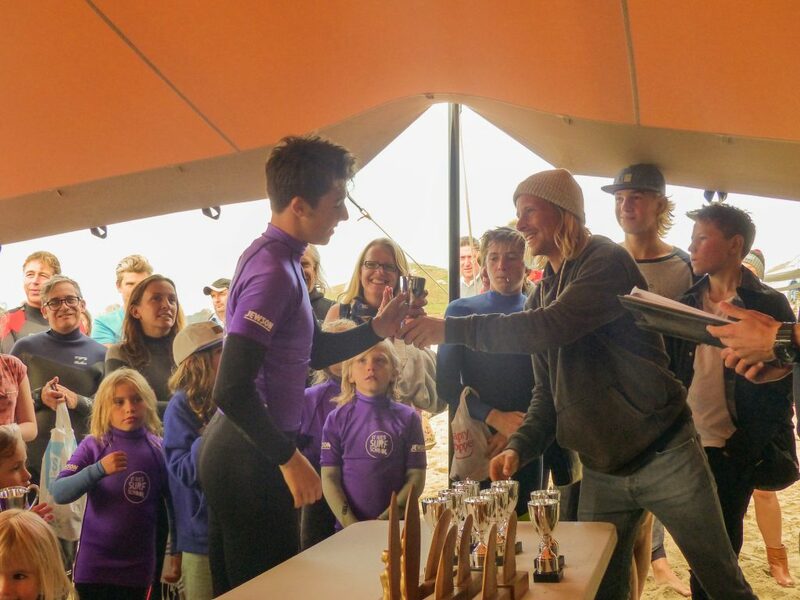 In this second part of the report we’ll see the roll call of those juniors who earned their trophy by their season’s effort. 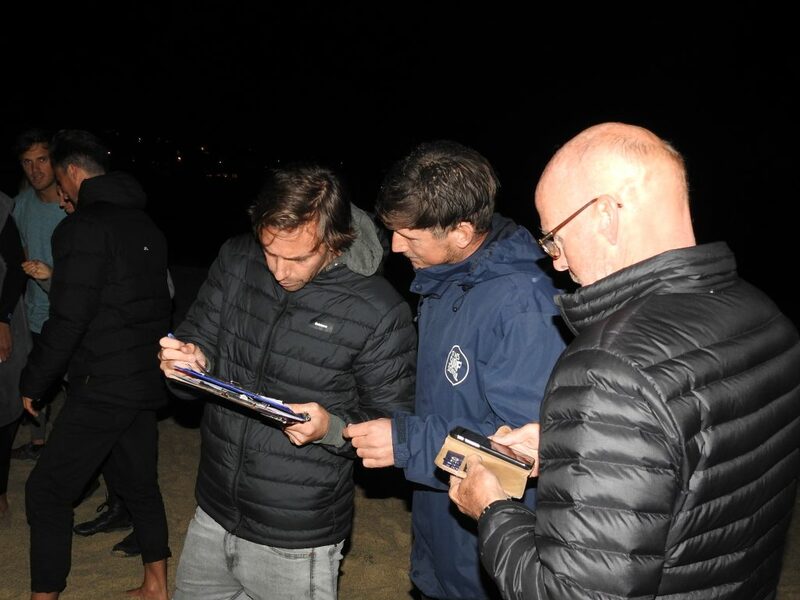 It is difficult to persuade the coaches to make these choices as many of their charges have brought dedication and determination to the sessions, but we hope that those who didn’t collect a prize this time will come back next season with renewed enthusiasm and feel that a prize is within reach this time! 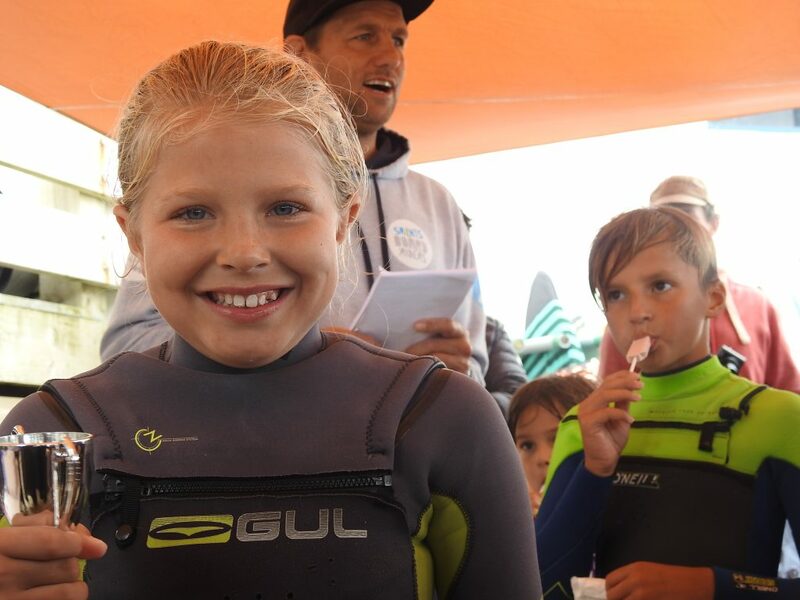 Of course, there’s a real sense that every child who has enjoyed her surfing and is keenly anticipating the next session is a winner. 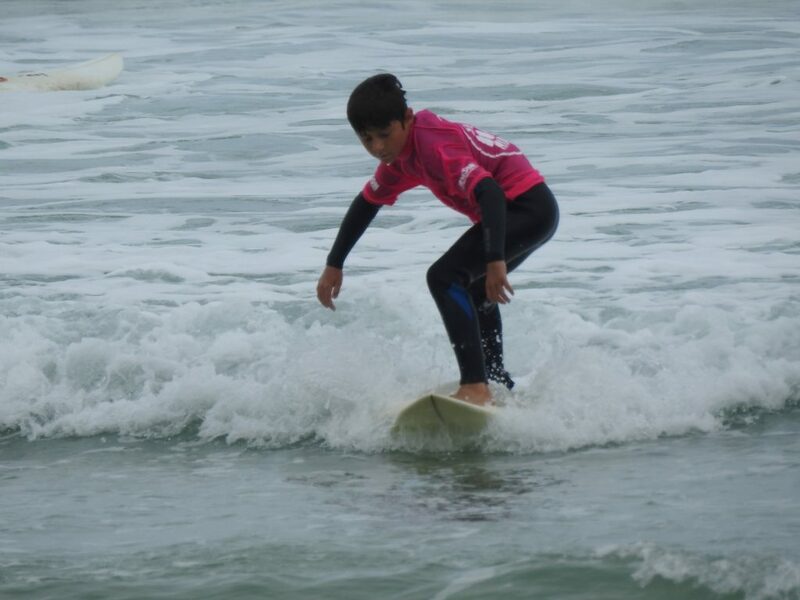 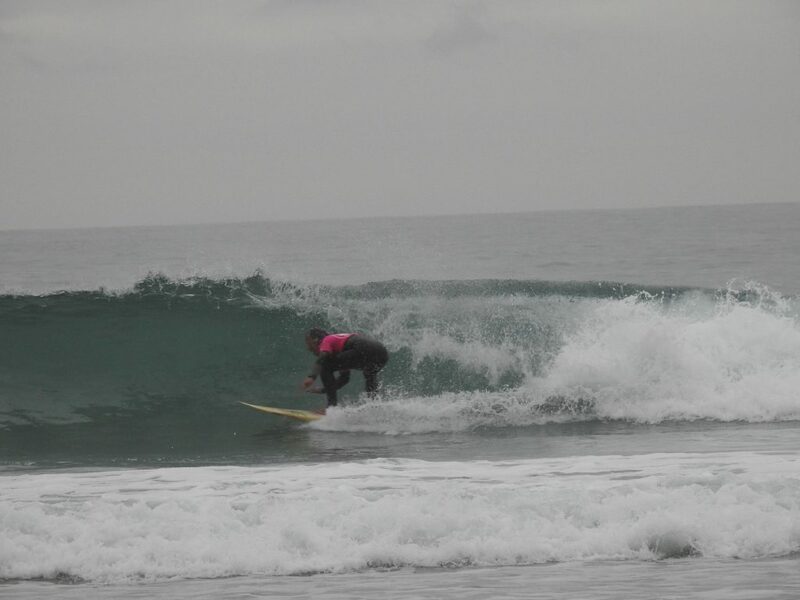 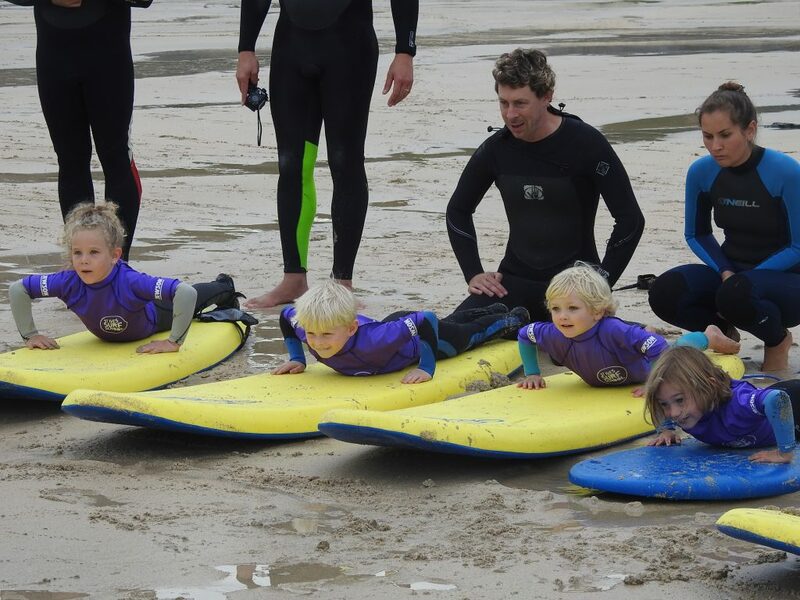 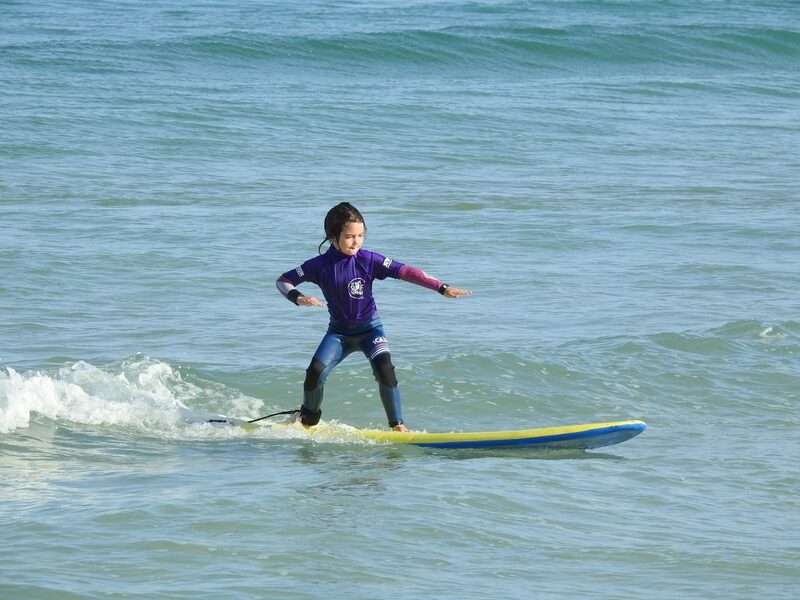 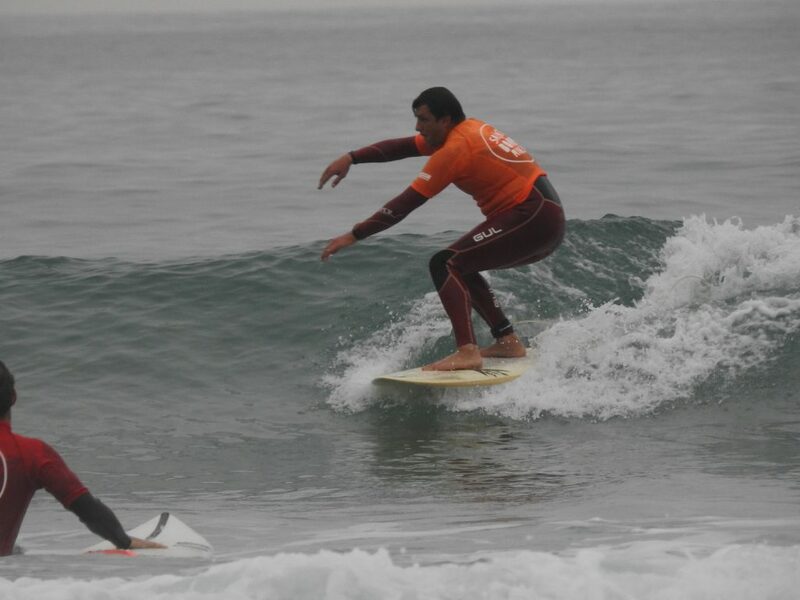 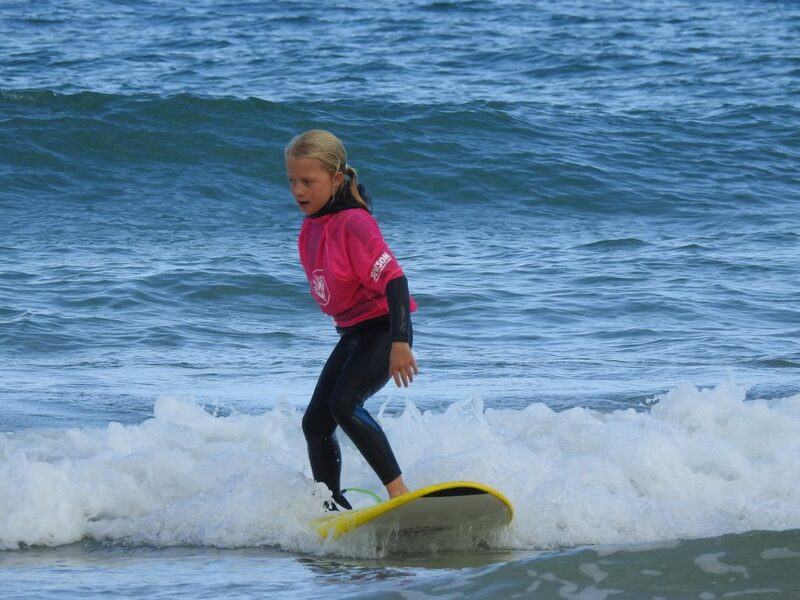 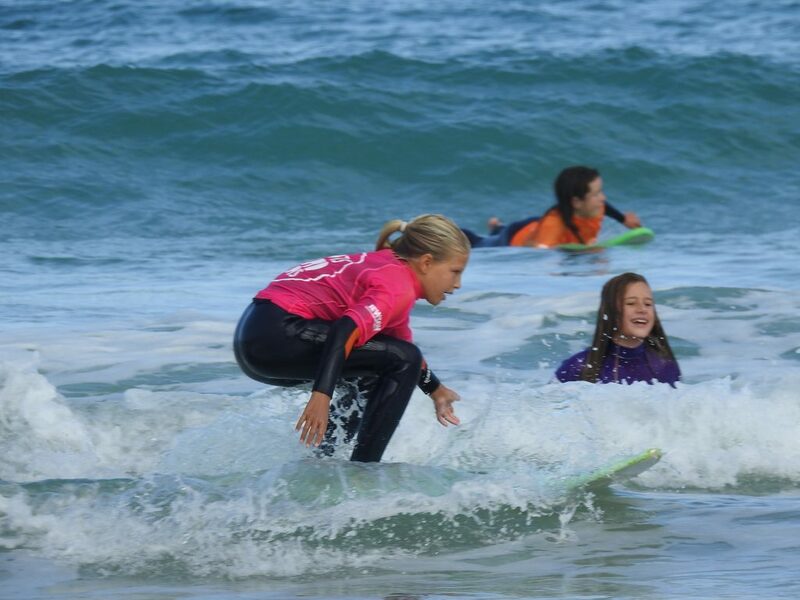 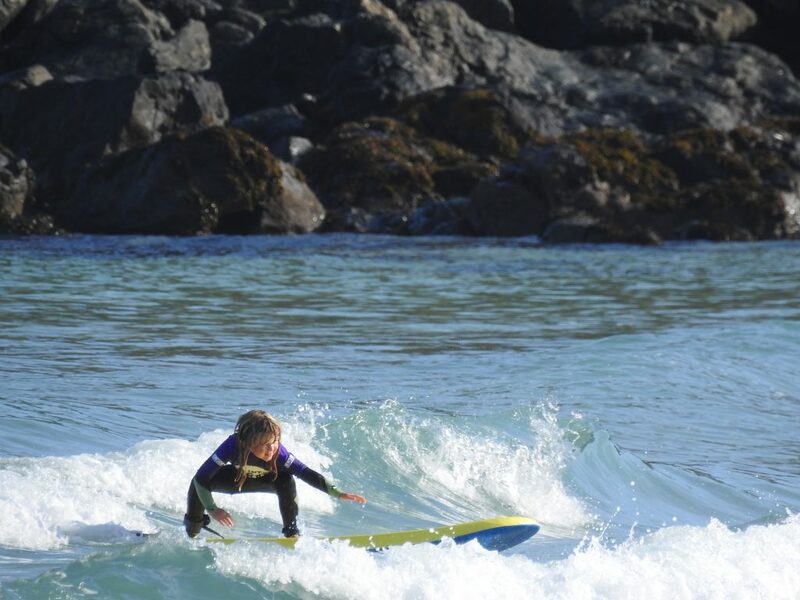 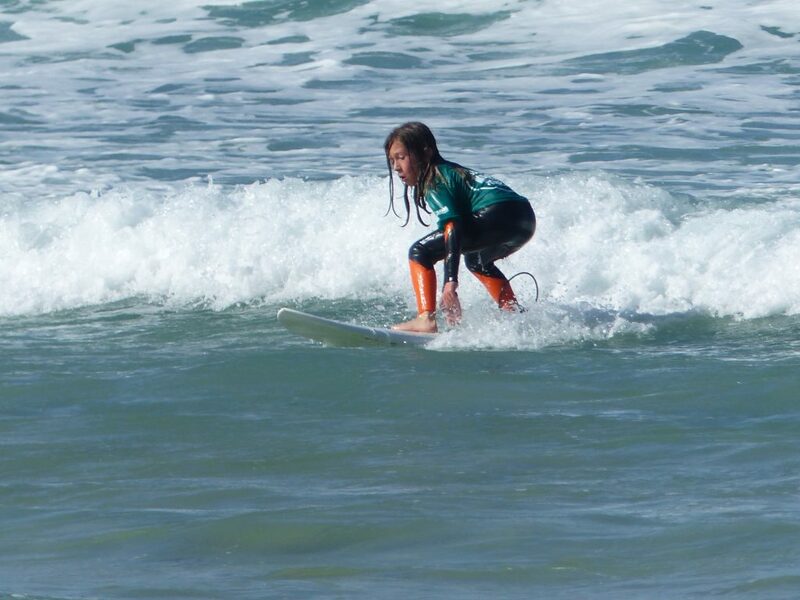 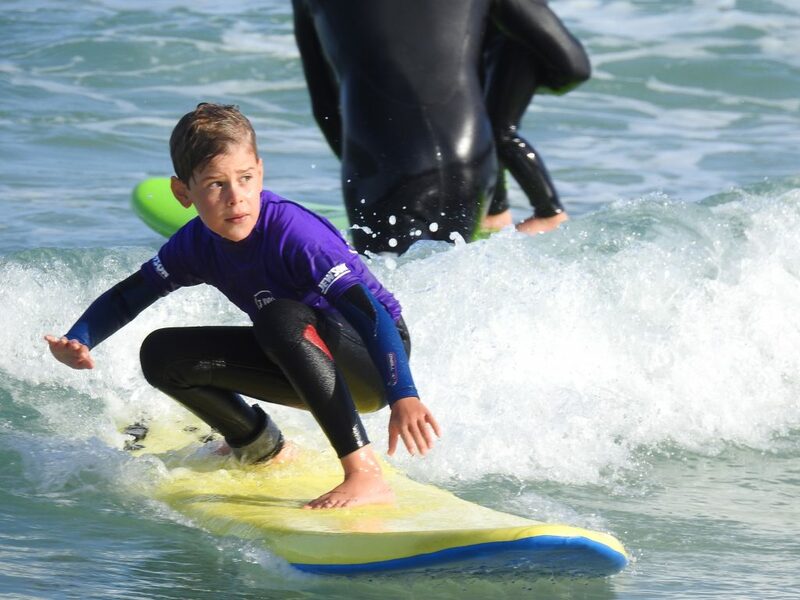 Finding a passion for a sport is a great feeling, and I hope we are introducing more than a few of our juniors to a lifelong association with surfing. 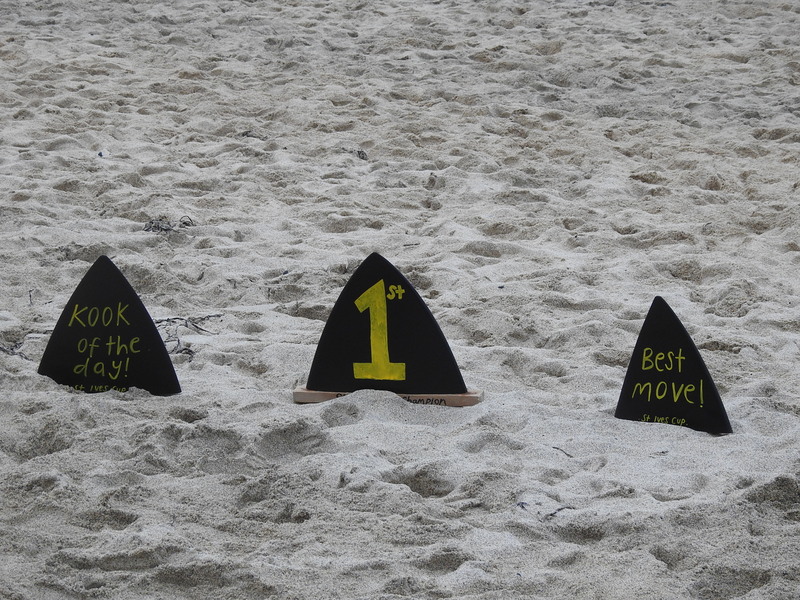 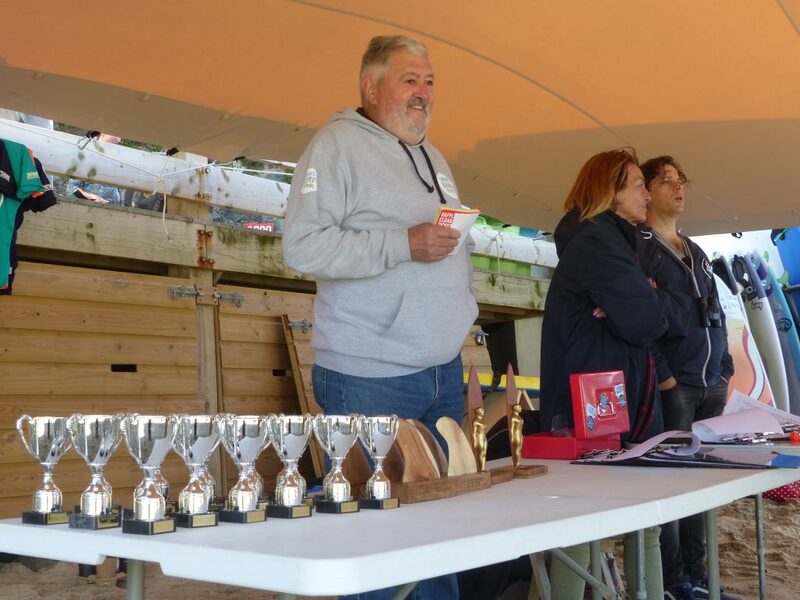 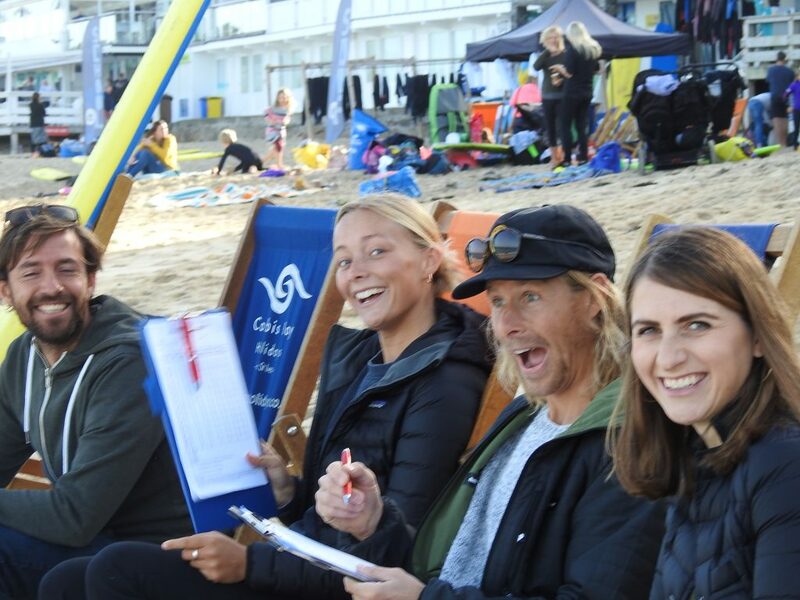 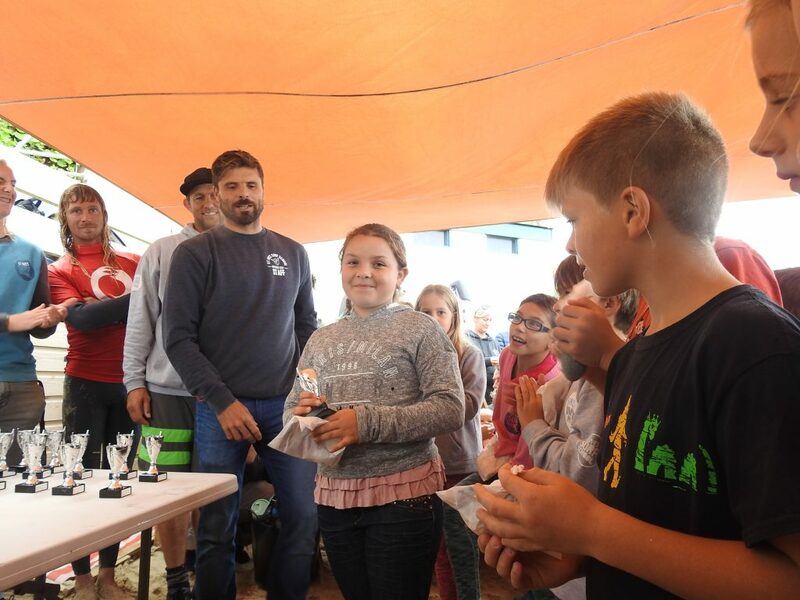 I’ll conclude by thanking those whose help and support made the day go so smoothly: St. Ives Surf School, RNLI Lifeguards, Jabula Tents, Porthmeor Beach Services, Carl and the Take-away crew and our own members who judged, coached and marshalled the event. 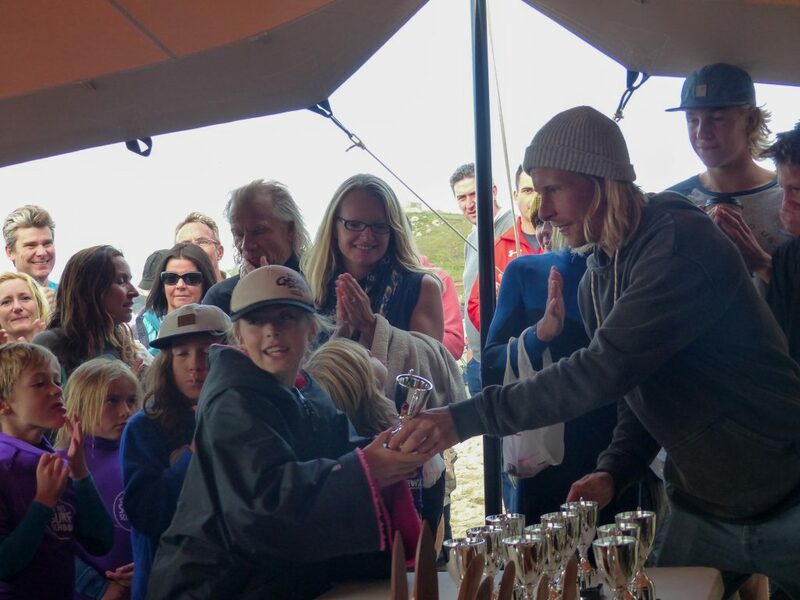 Jayce Robinson came down to present the trophies – and it’s always a great inspiration to the kids to spend time with our local pros! 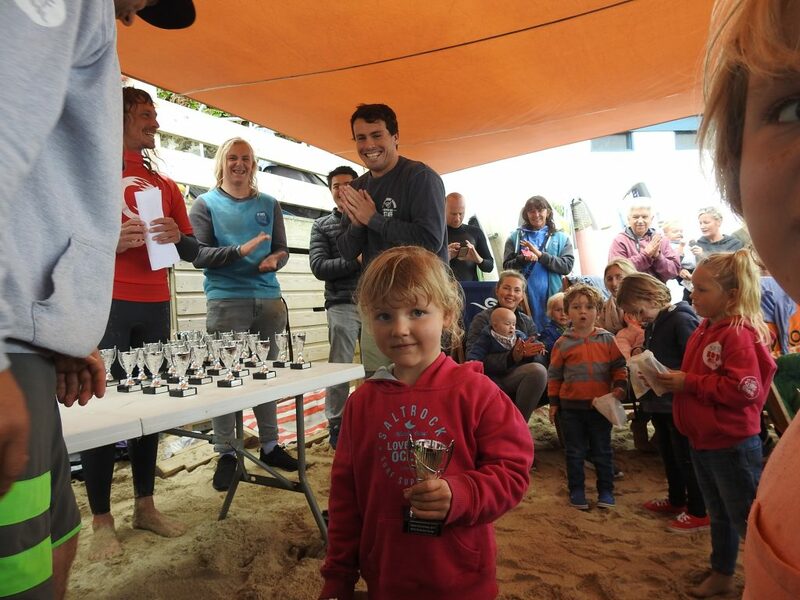 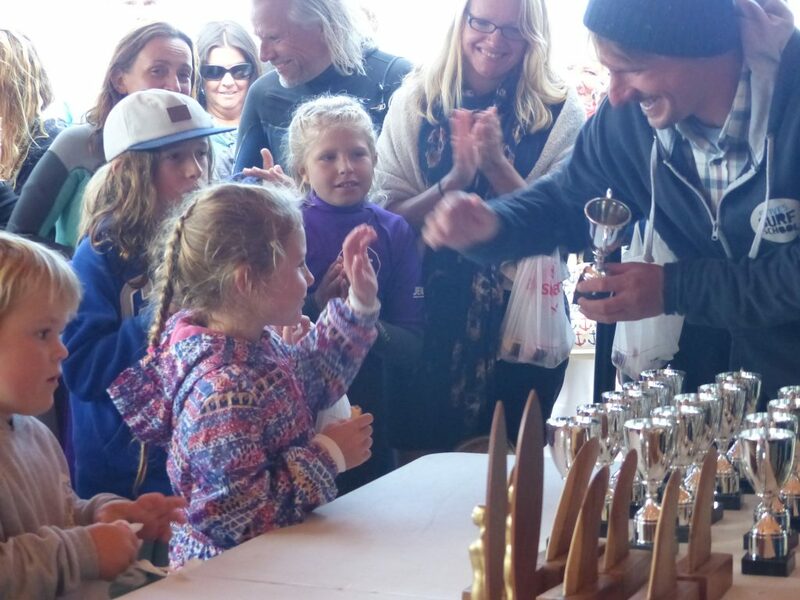 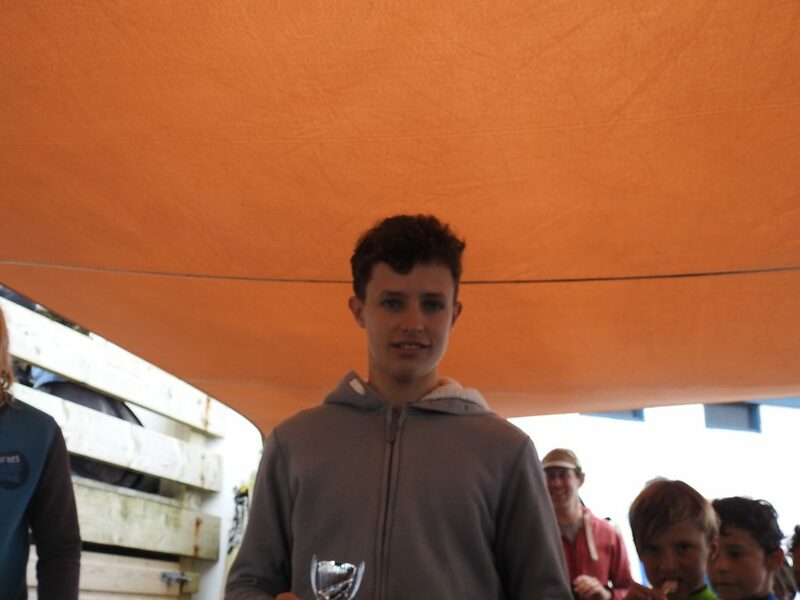 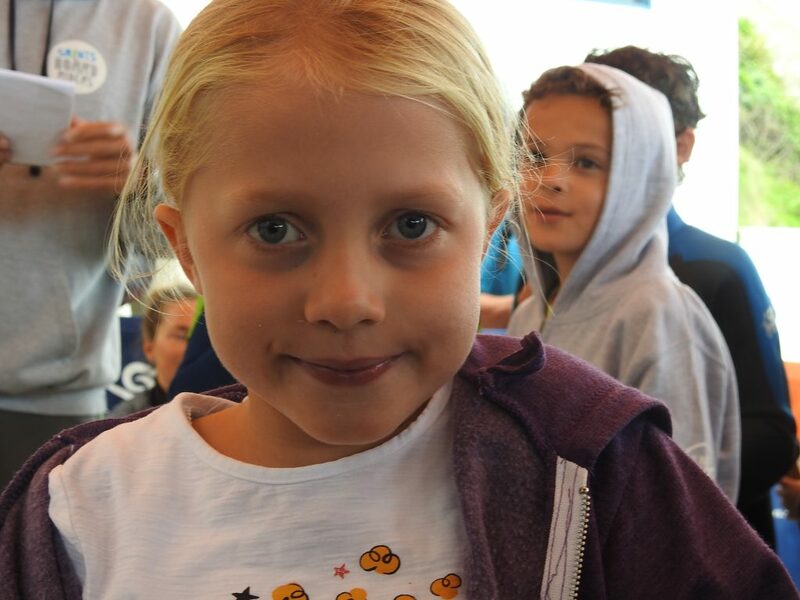 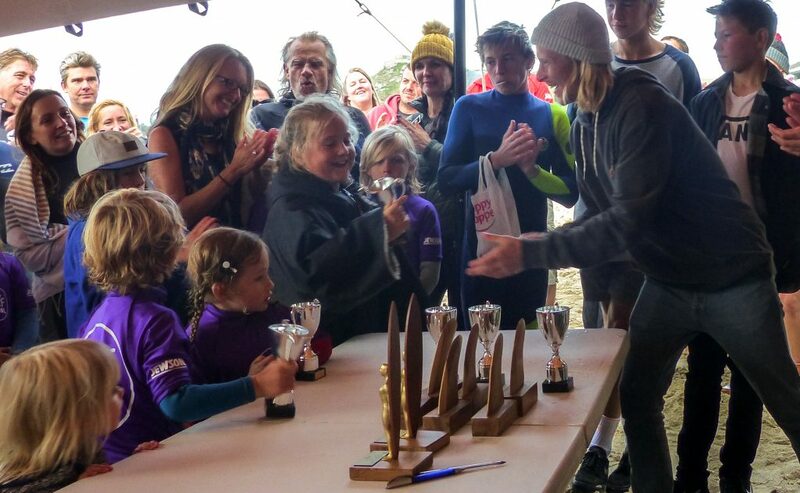 Jabula came and pitched a fine big tent, St. Ives Surf School unpacked a box of shining trophies, and the new contest vests got their first airing as the final day of our 2016 season arrived. 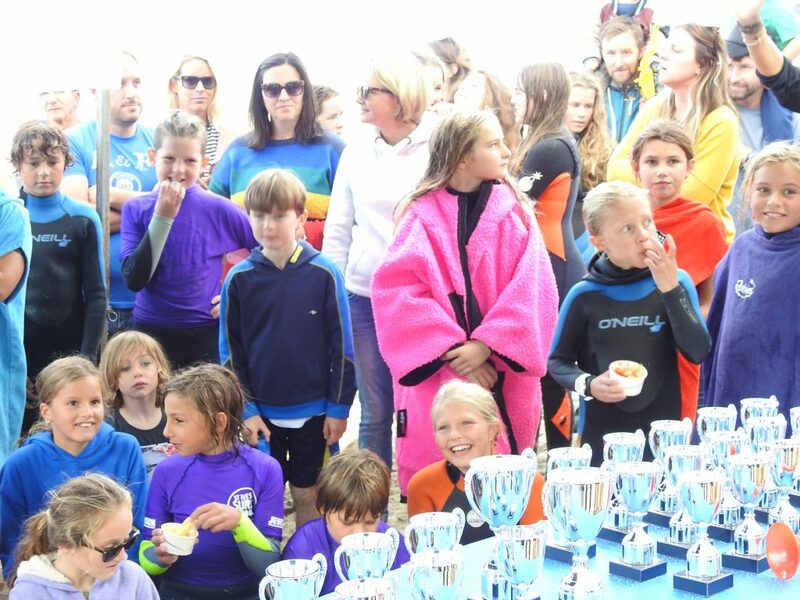 The running order was boys heats to the completion of their semis, then junior groups in the water with coaches and helpers for their last session and assessments, followed by girls final and then the boys final. 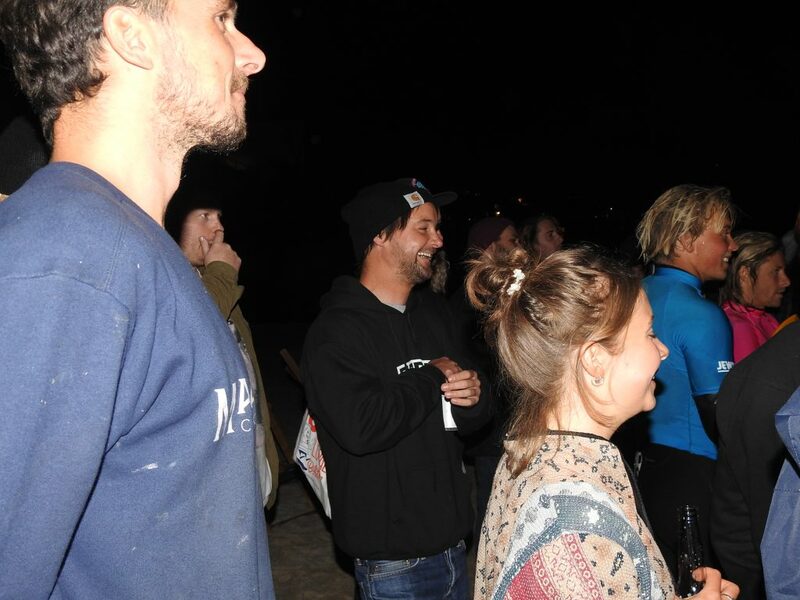 The early rounds were keenly contested in chunky surf at the West end of the beach, watched by an enthusiastic crowd! 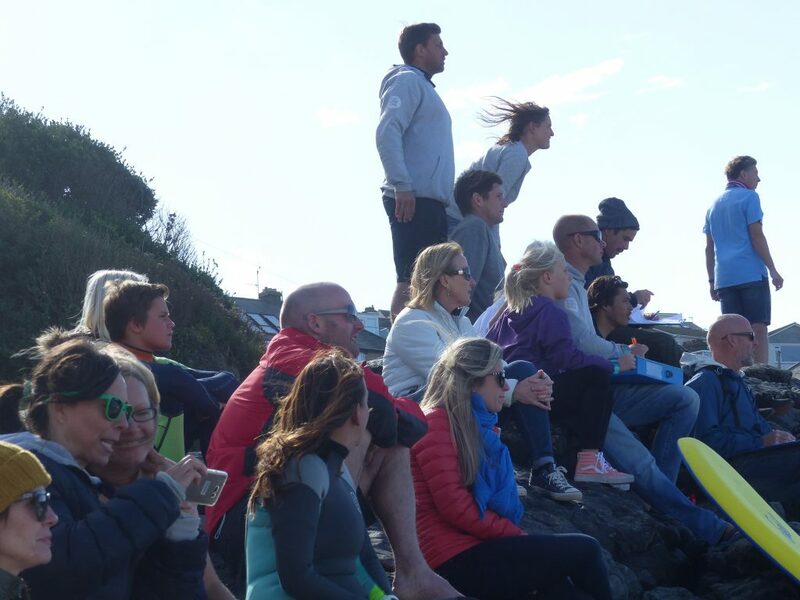 Judges and spectators find a good viewing spot. 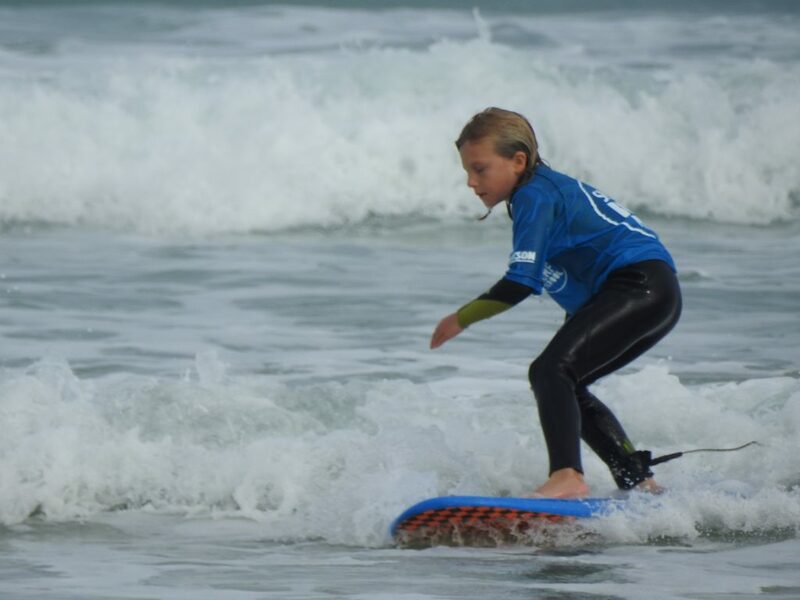 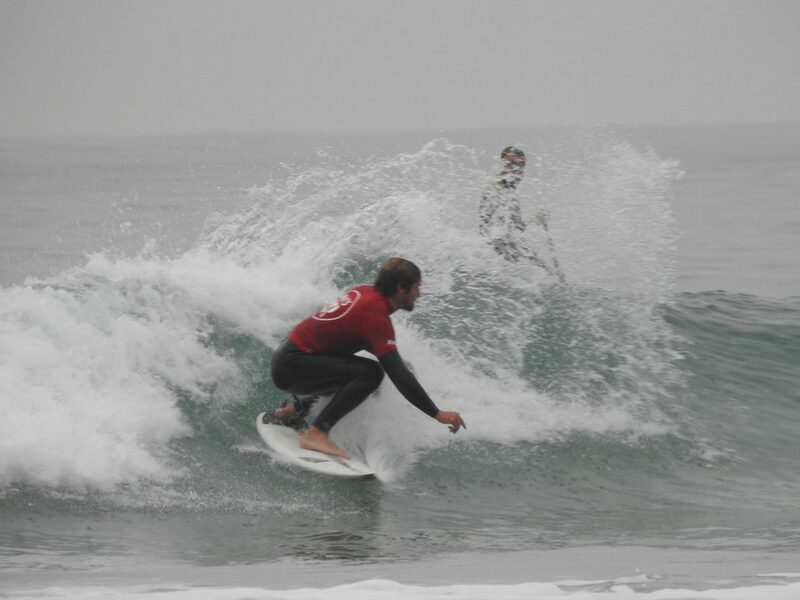 Once the semis were completed the group sessions got underway and we saw some confident surfing from some very junior surfers. 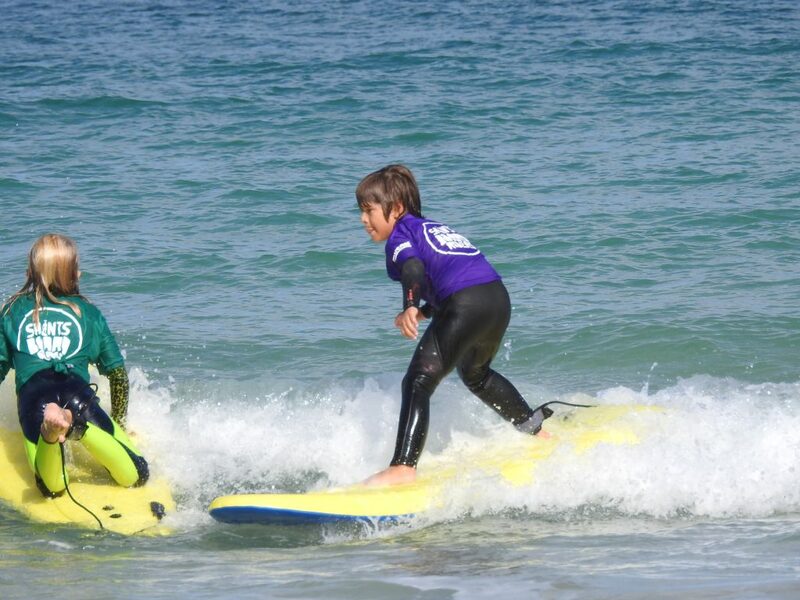 Their delight in showing their skills was great to see! 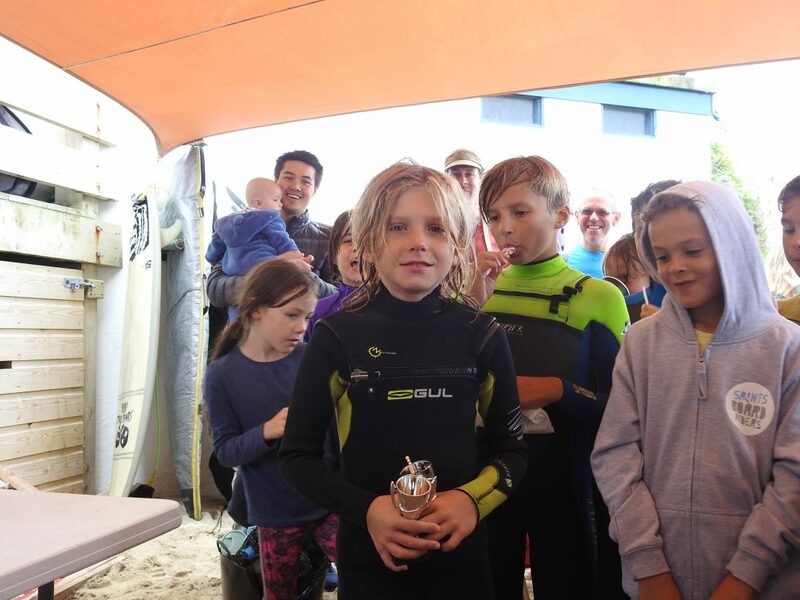 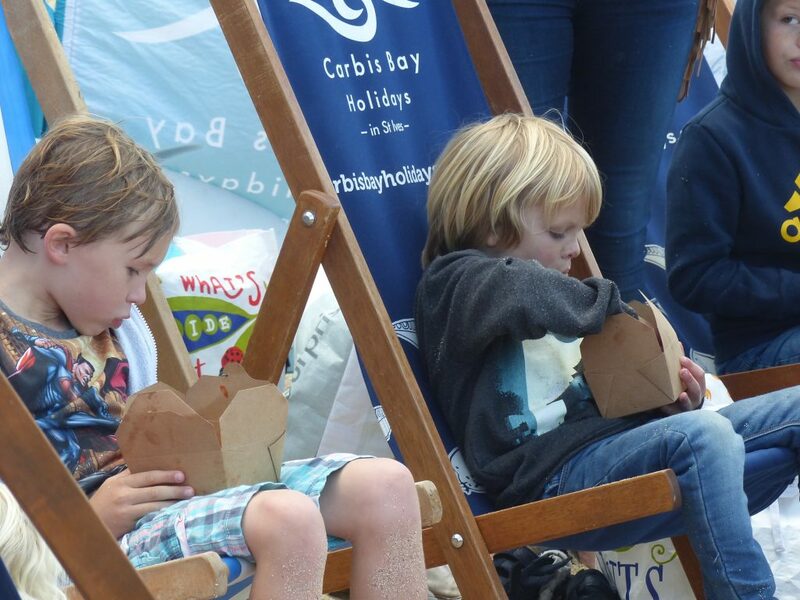 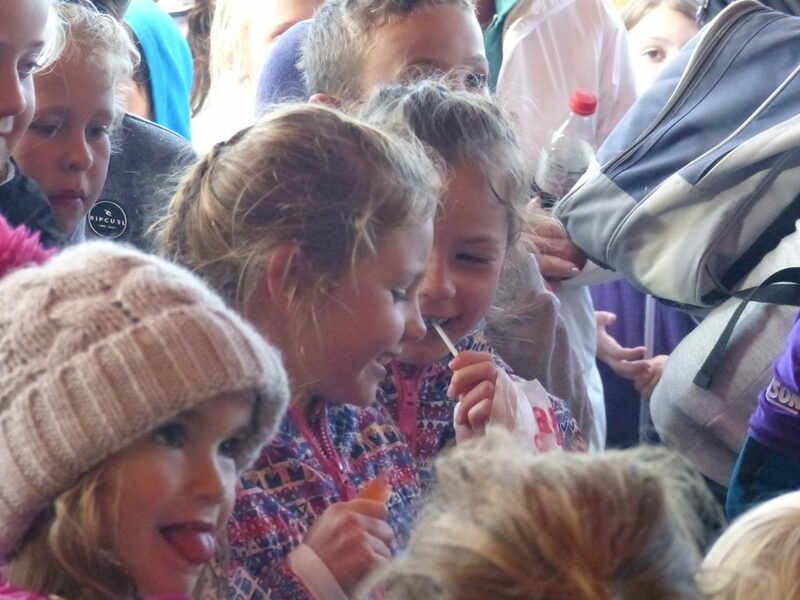 As they got out of their wetsuits and dried off, we had a great display of fast food catering from Carl at Porthmeor Central takeaway as boxes of hot food and ice lollies arrived to tame any hunger pangs the surfing had prompted. 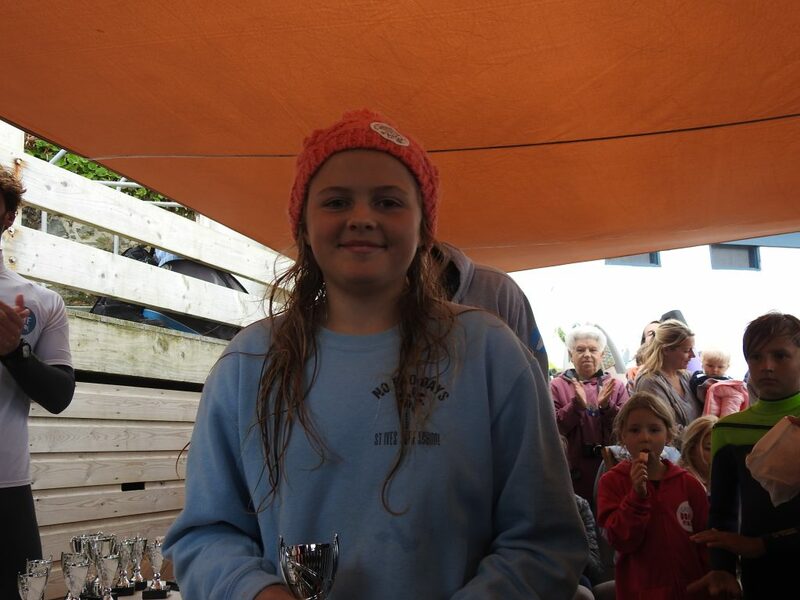 And the winner was Bridgit Wells. 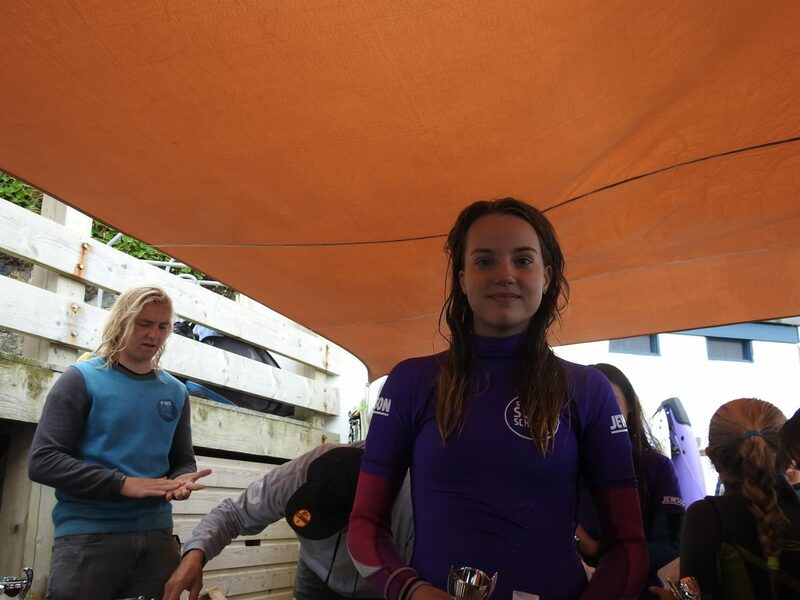 Well done to all our finalists and congratulations Bridgit! 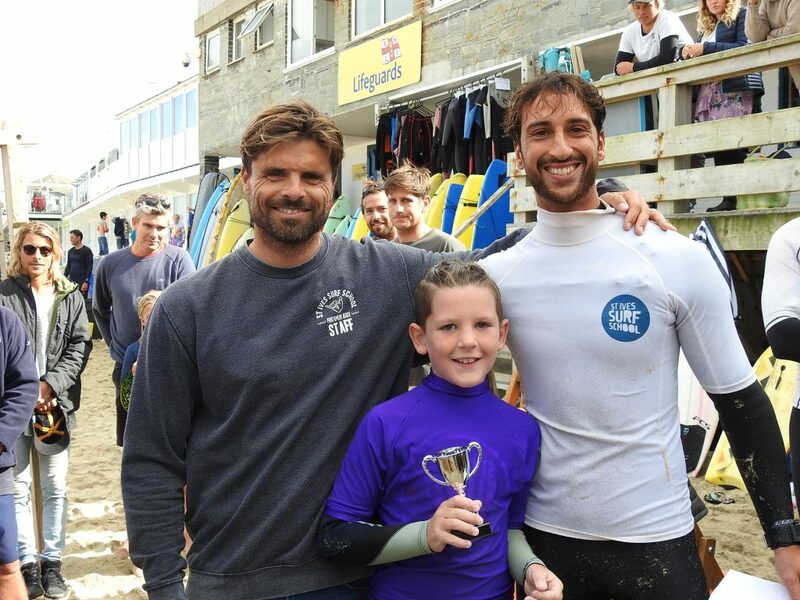 A cracking final with Taylor finding the win this year after several second places in recent years! 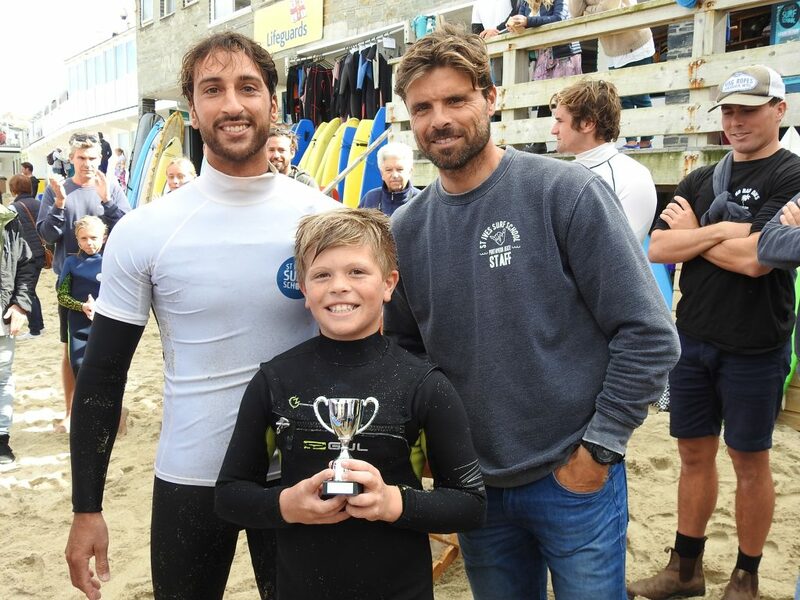 Part Two of the contest day report to follow with a full round-up of prize winners and more pics as available. 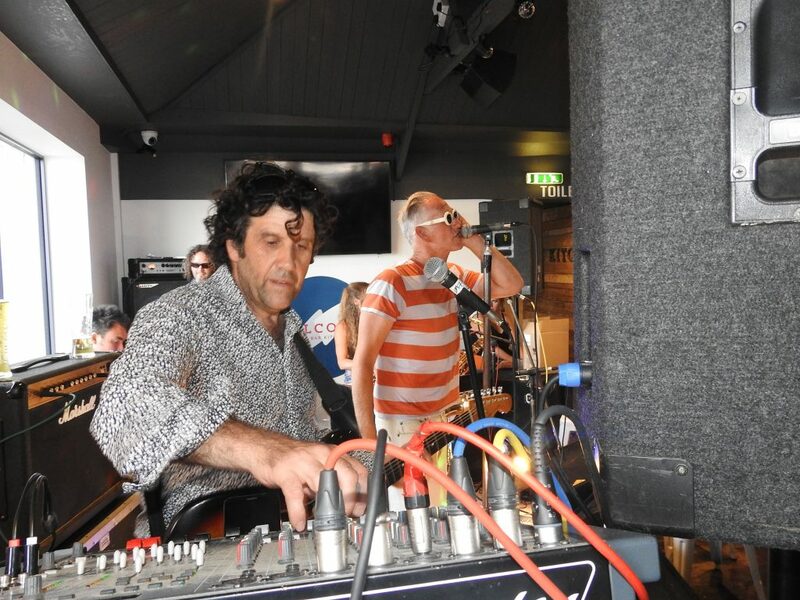 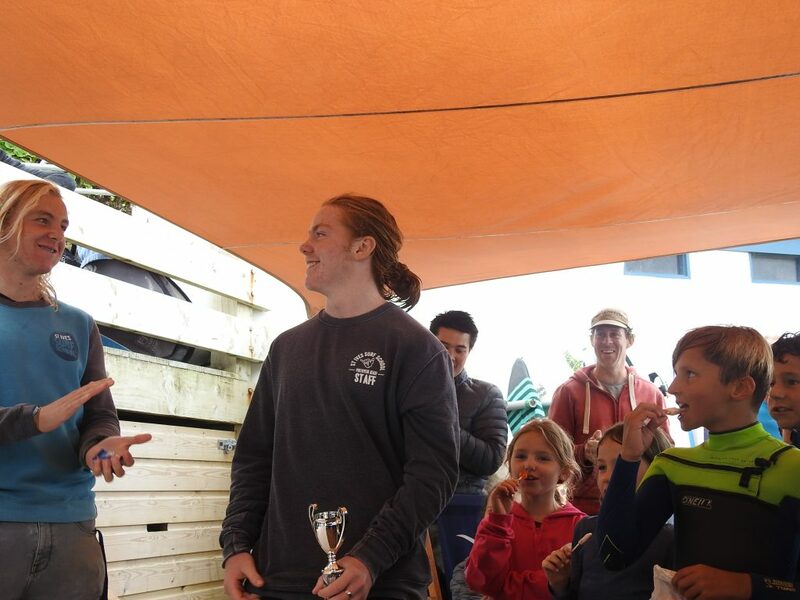 Meanwhile here’s a taster of the awards ceremony. 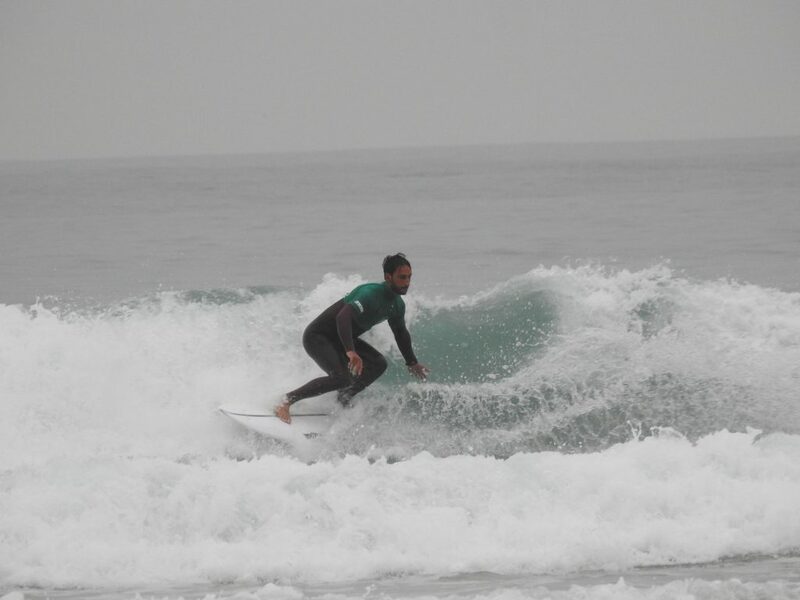 Back soon! 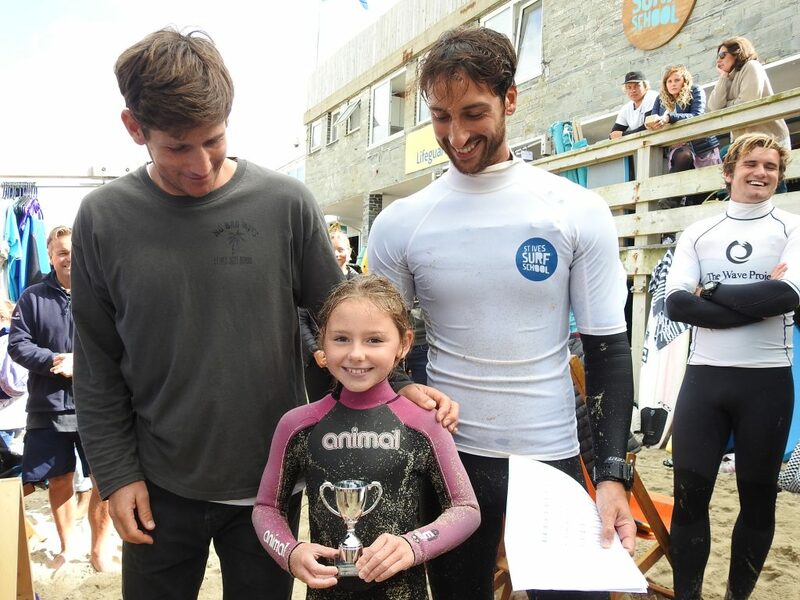 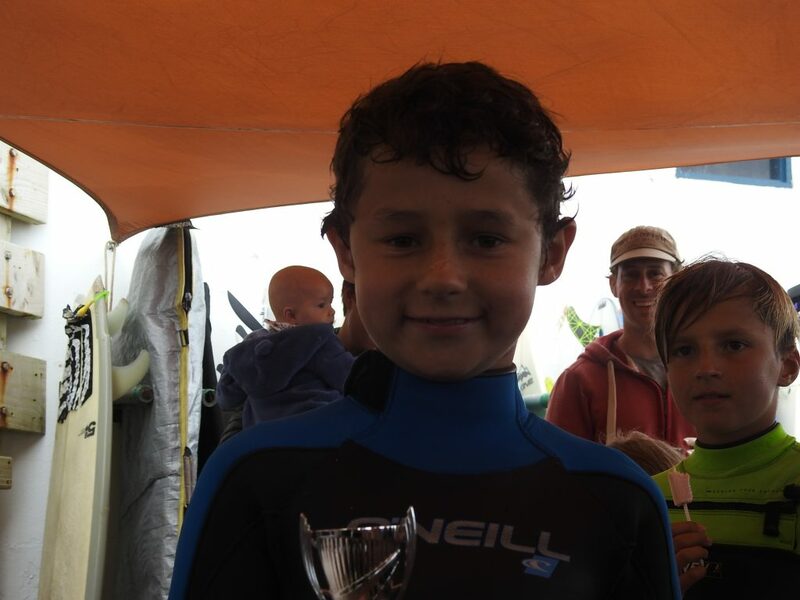 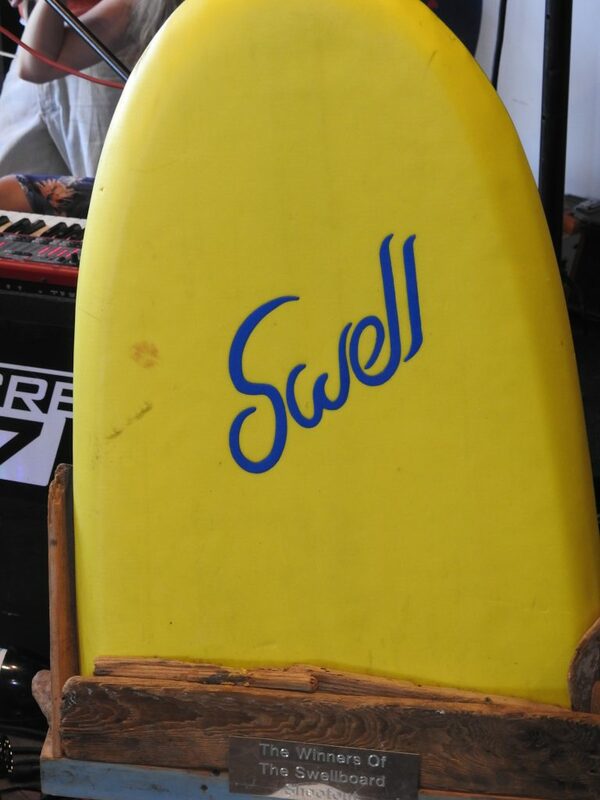 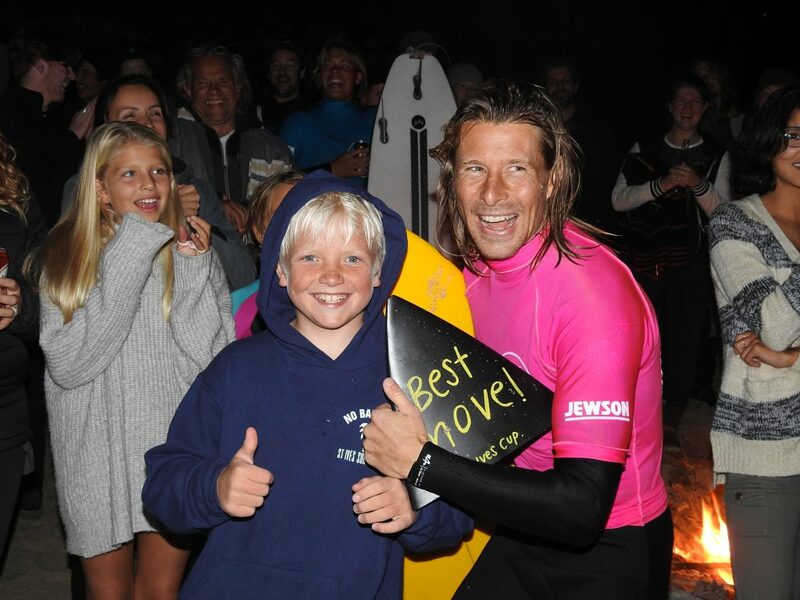 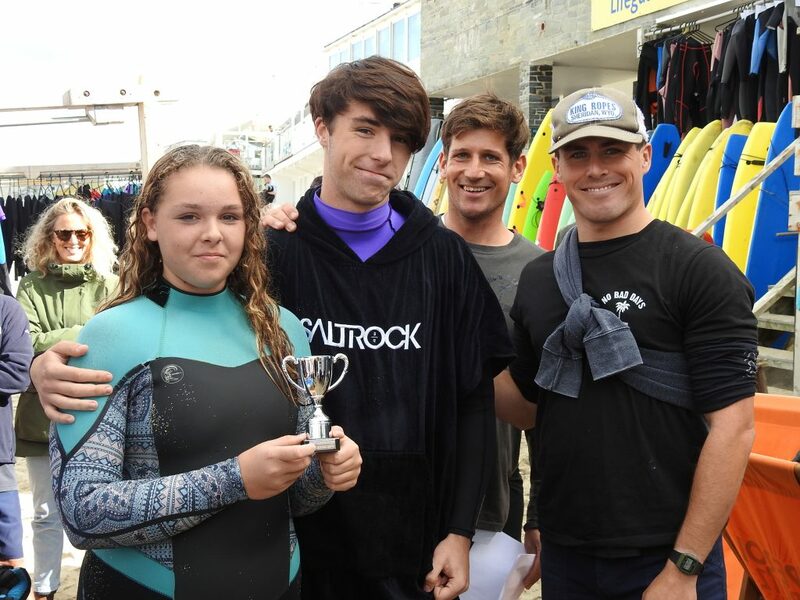 Award for St. Ives Surf School! 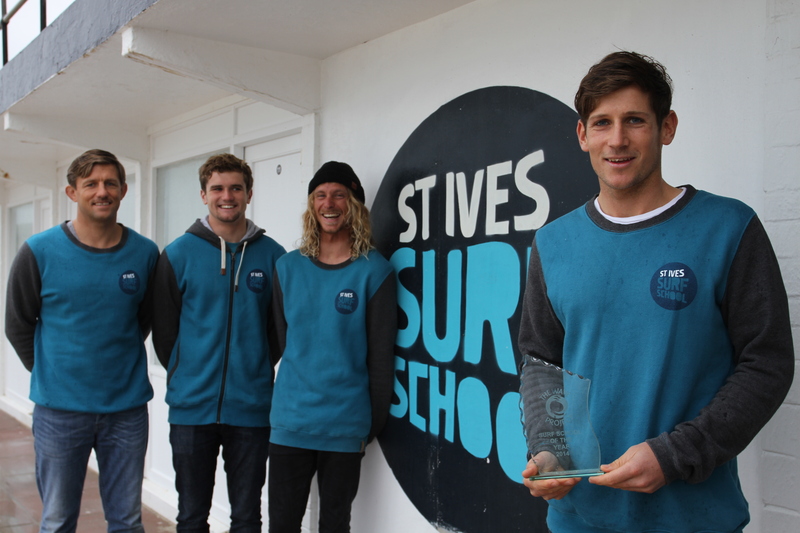 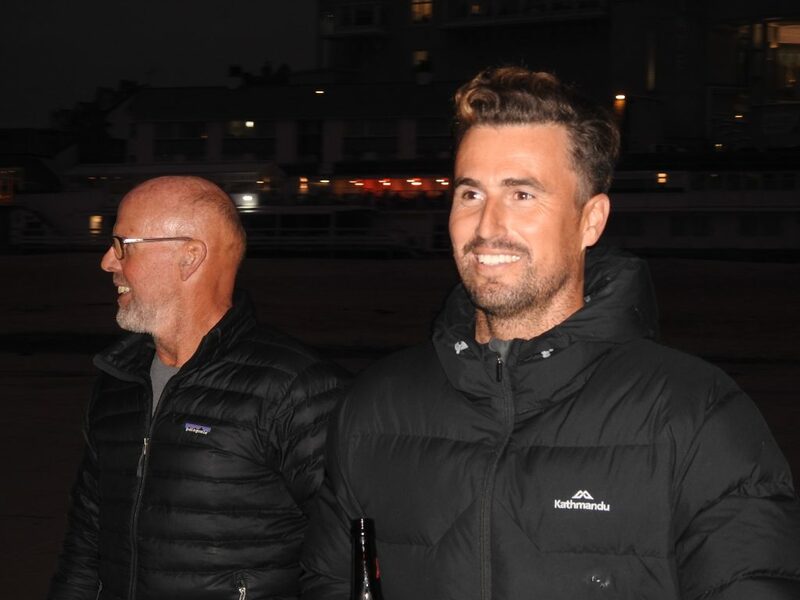 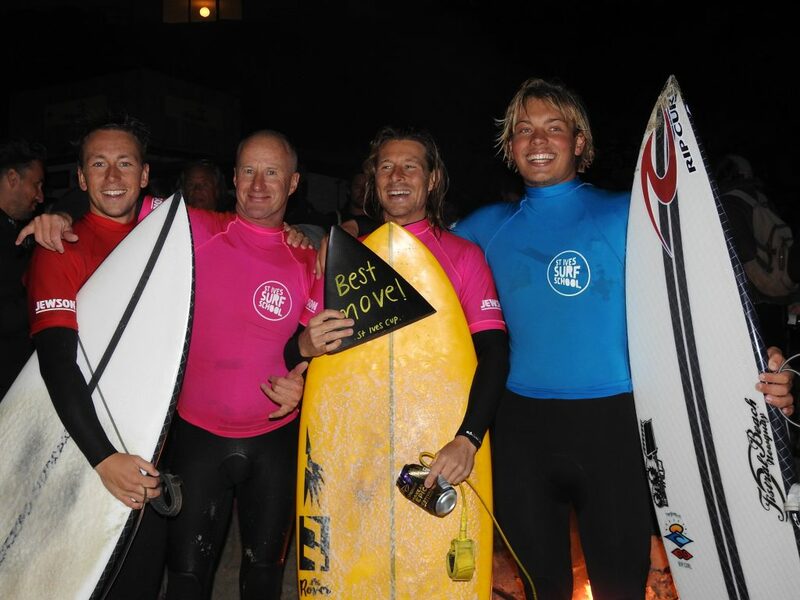 We’ve all enjoyed the benefit of the coaching delivered by St. Ives Surf School, and at the annual surf industry dinner in Newquay last weekend, Harris and his team were honoured to receive the national award of Inclusive Surf School of the Year for 2014. 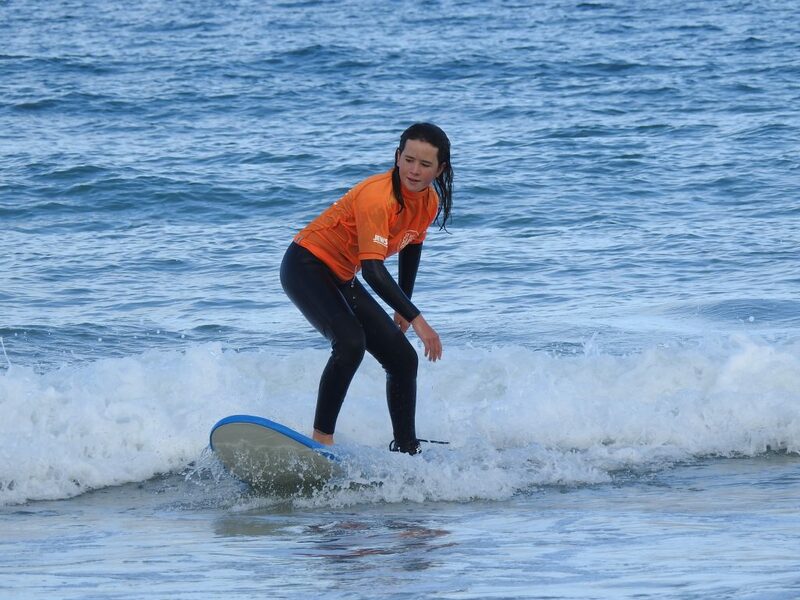 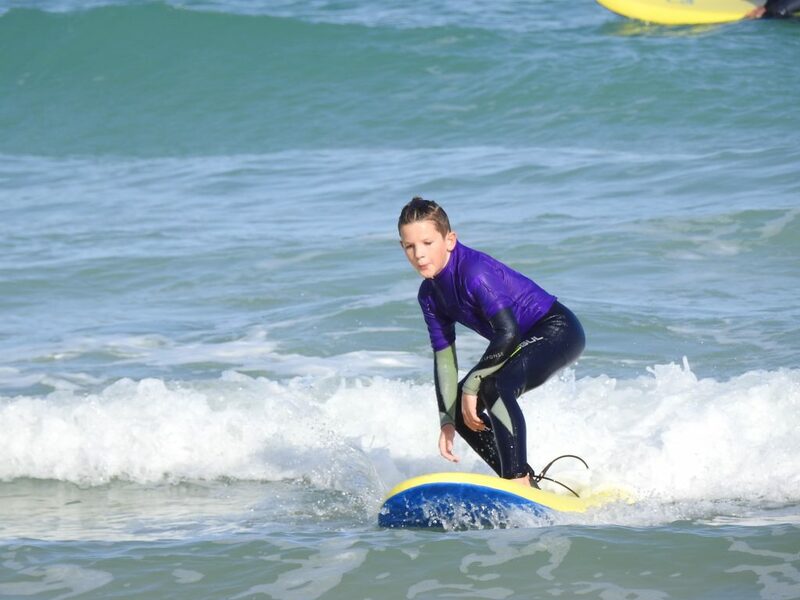 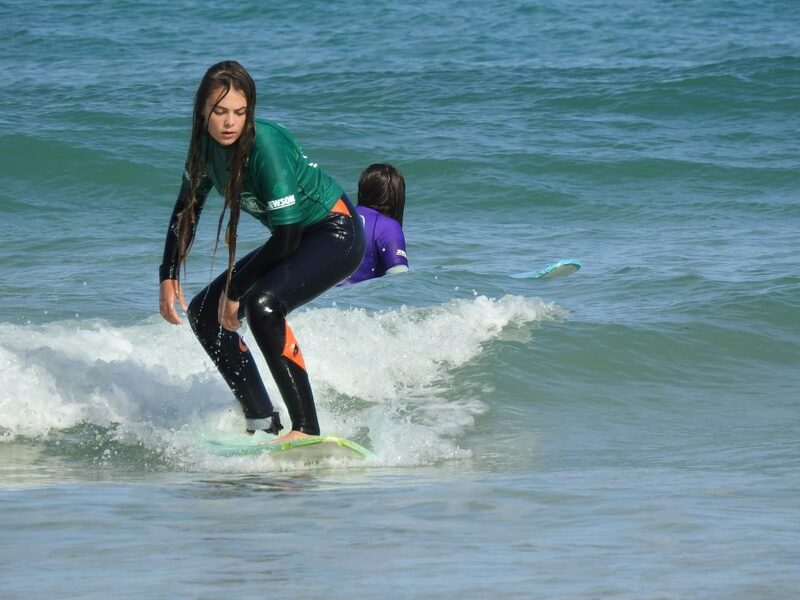 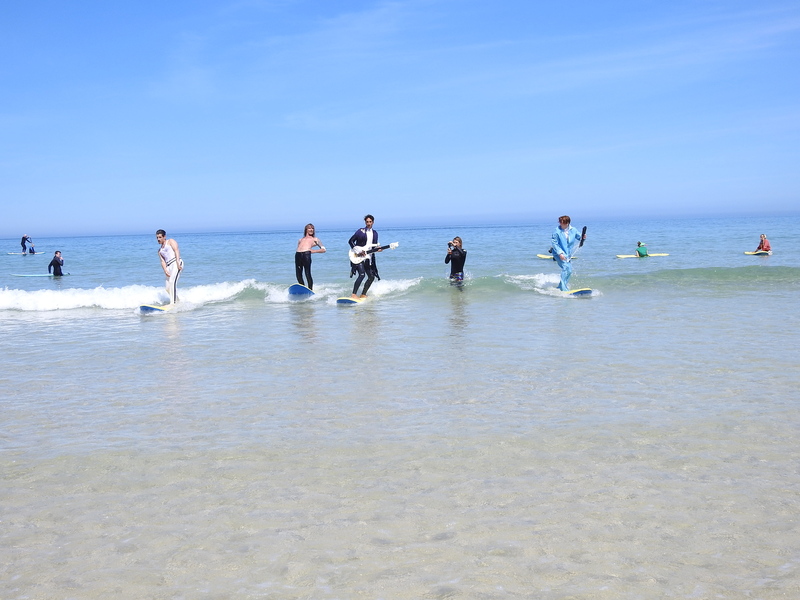 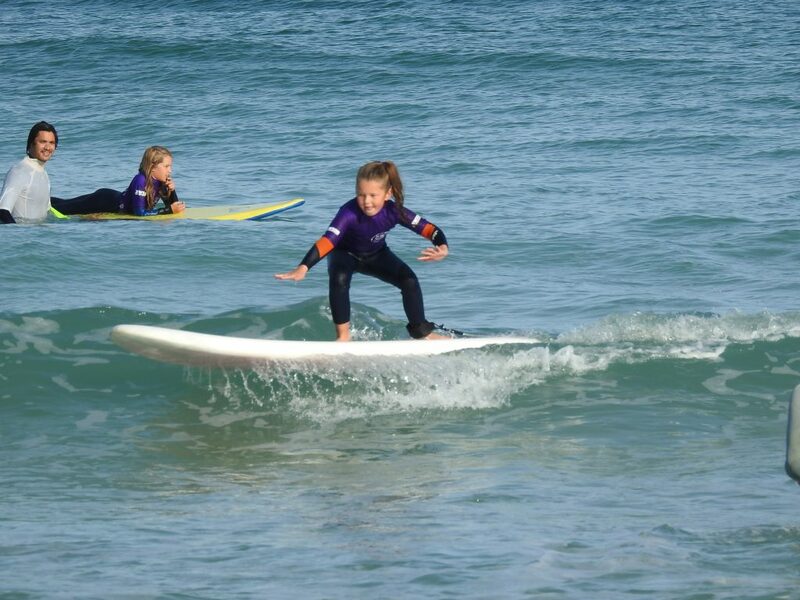 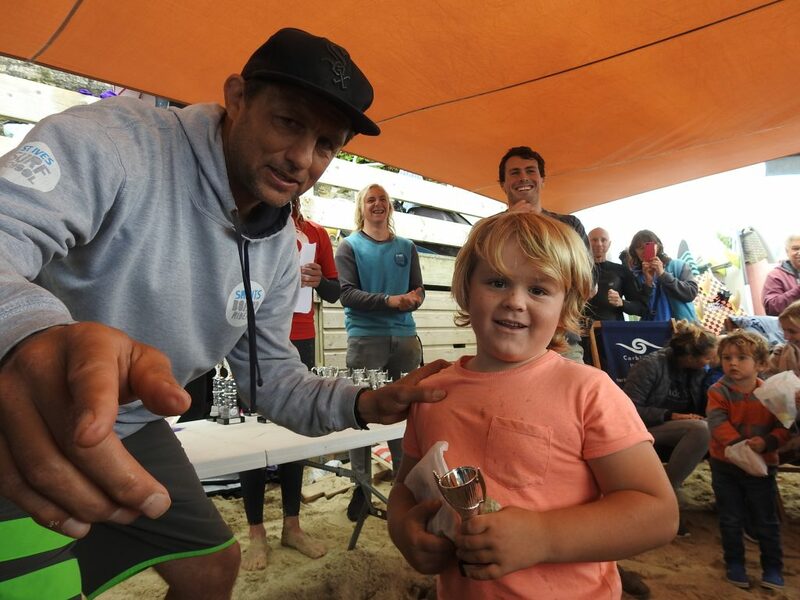 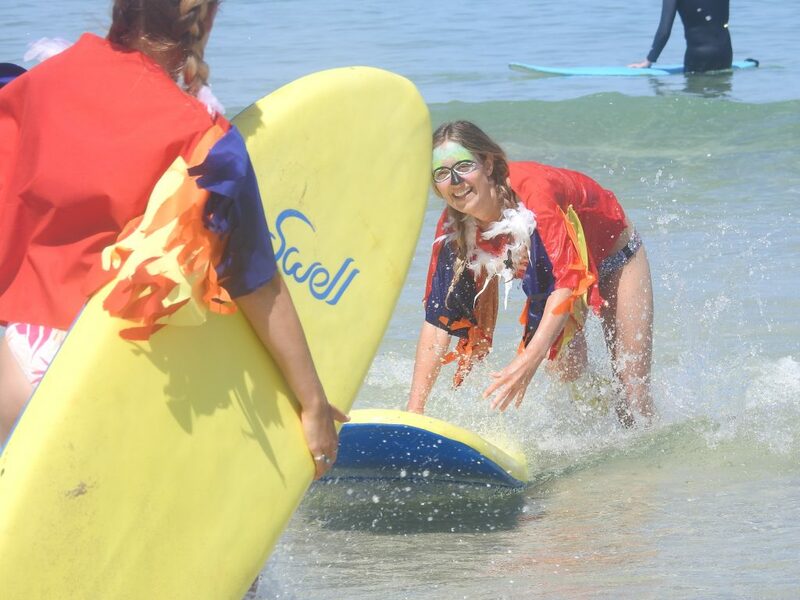 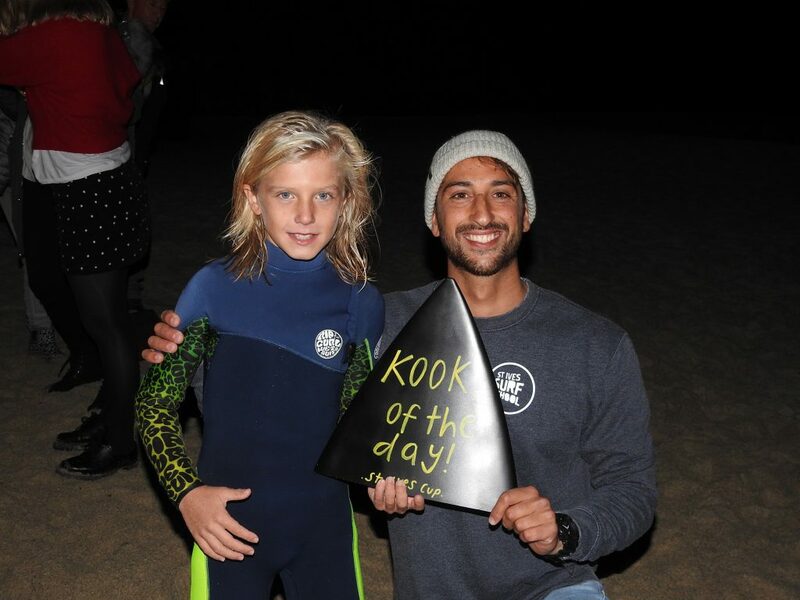 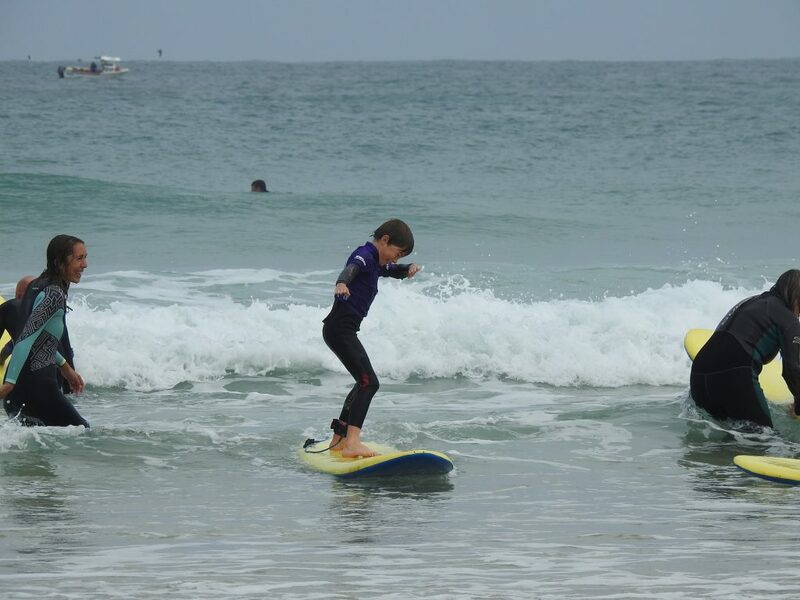 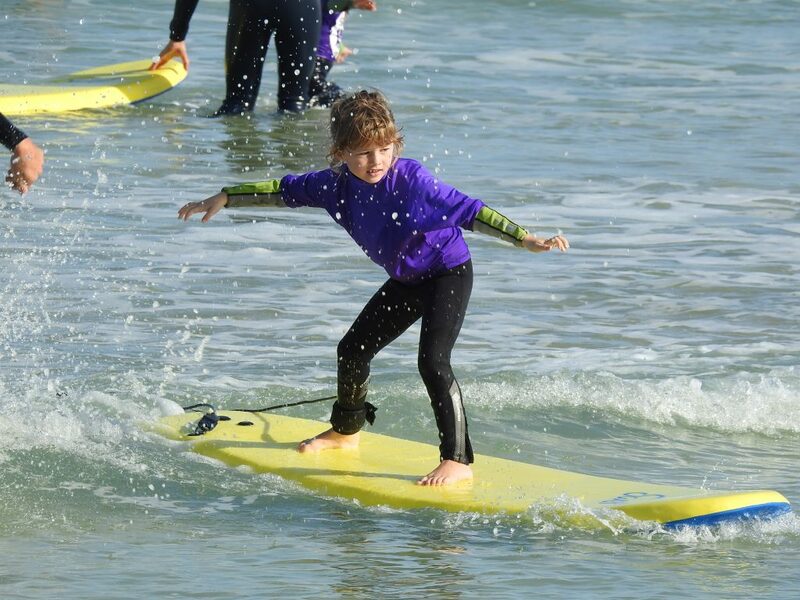 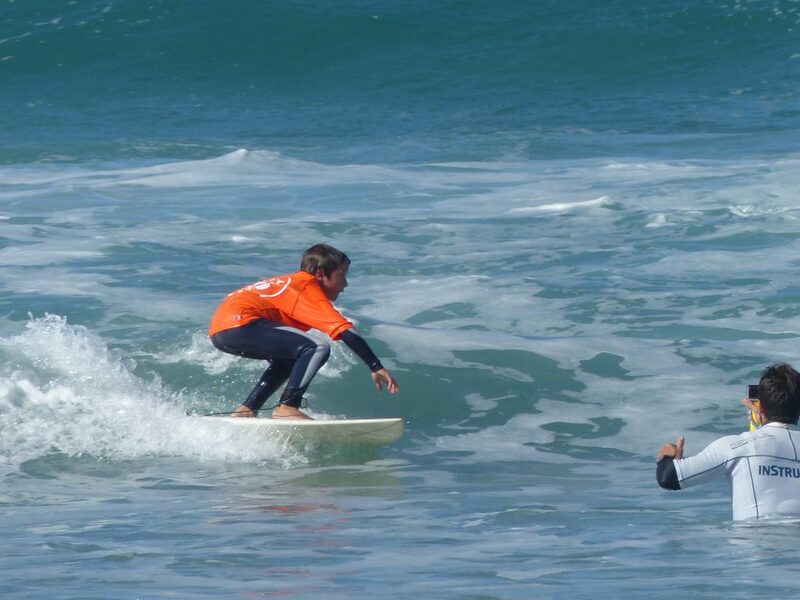 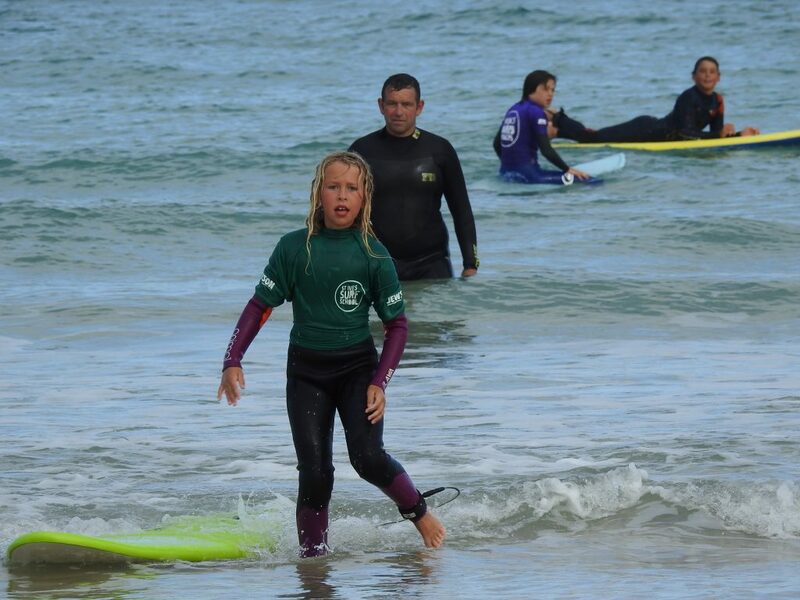 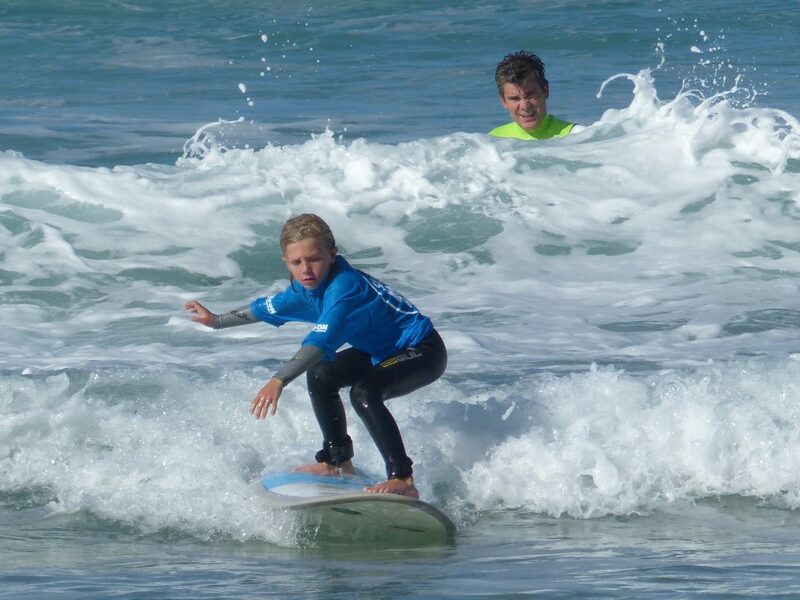 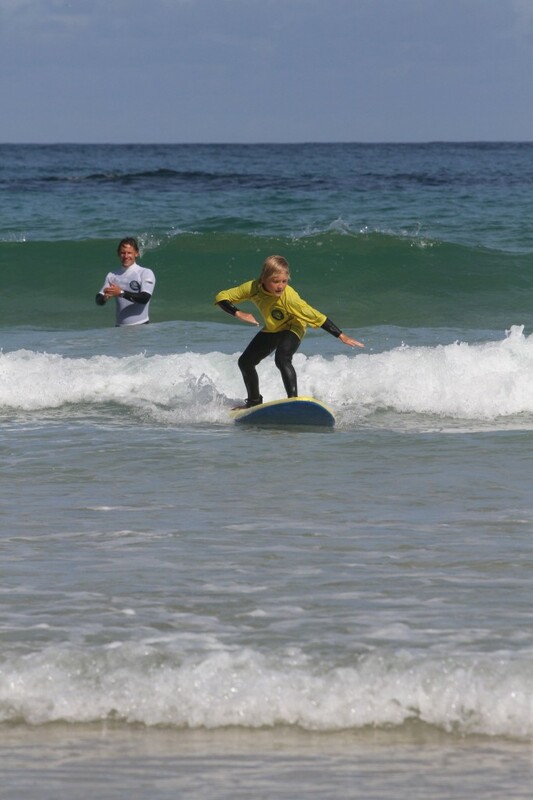 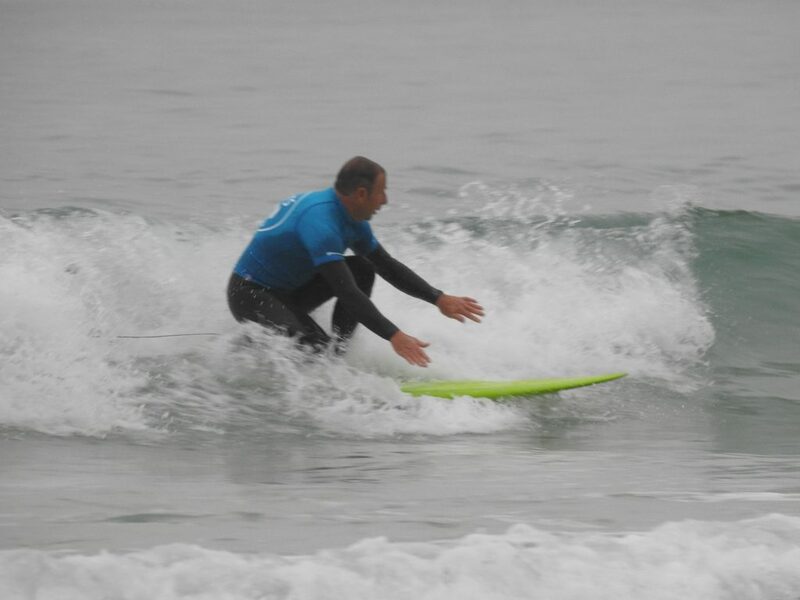 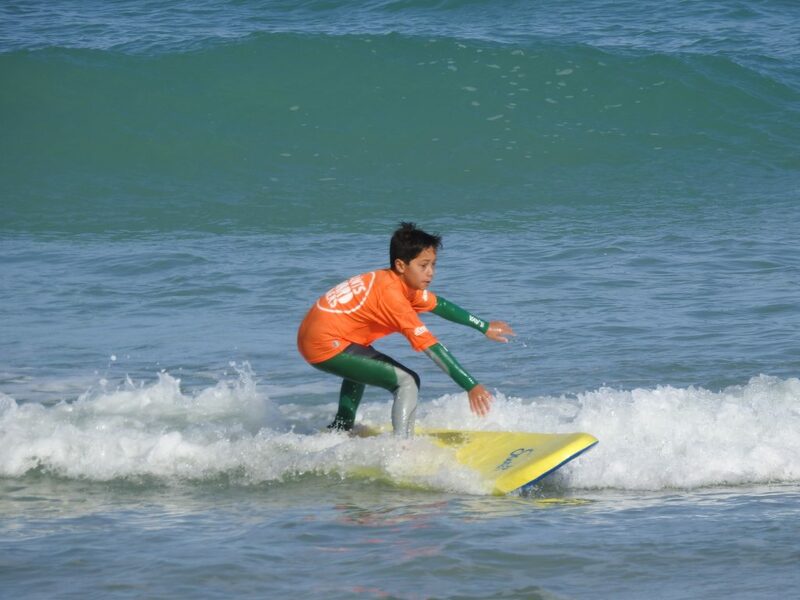 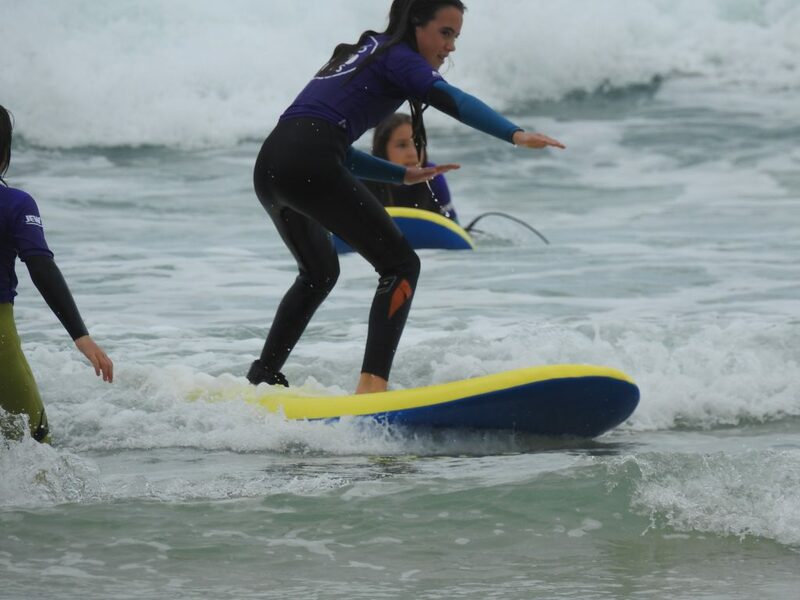 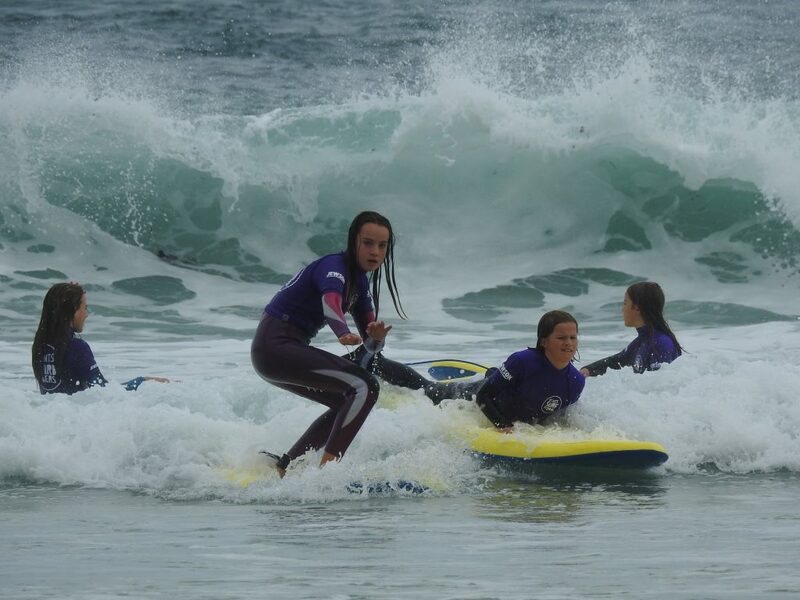 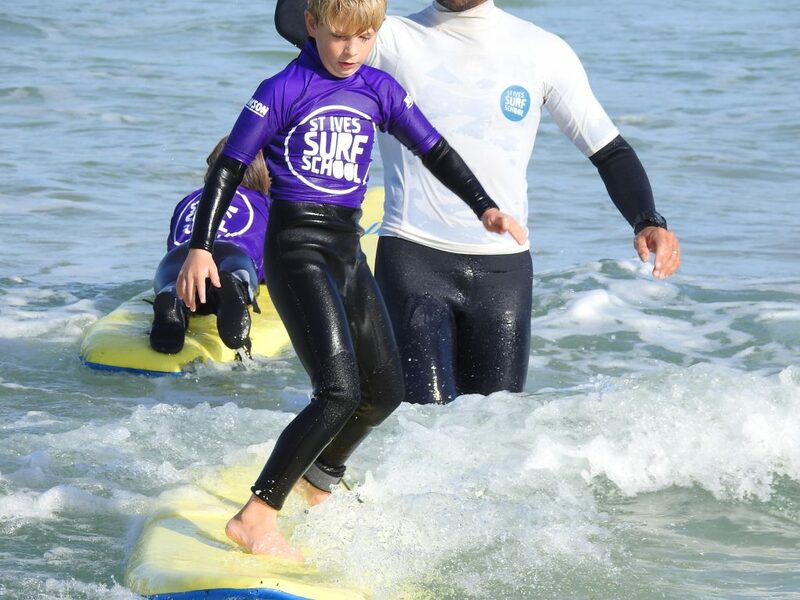 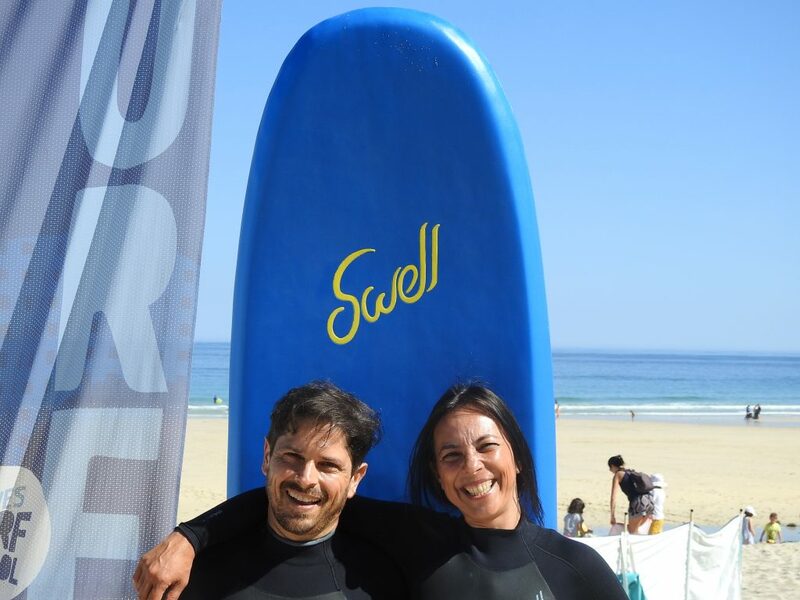 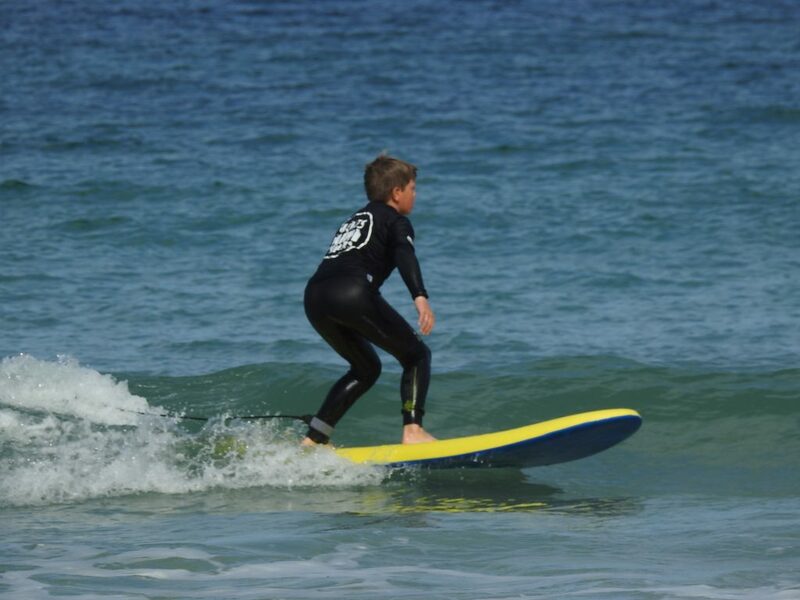 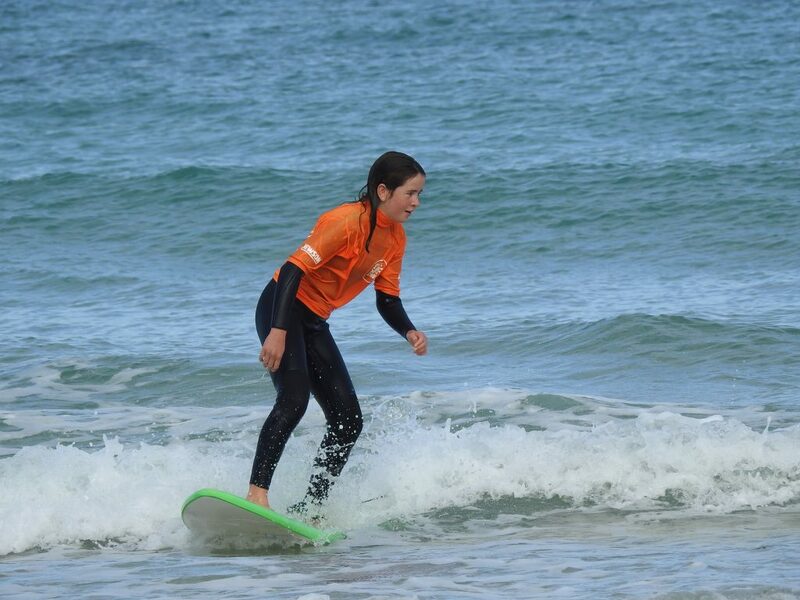 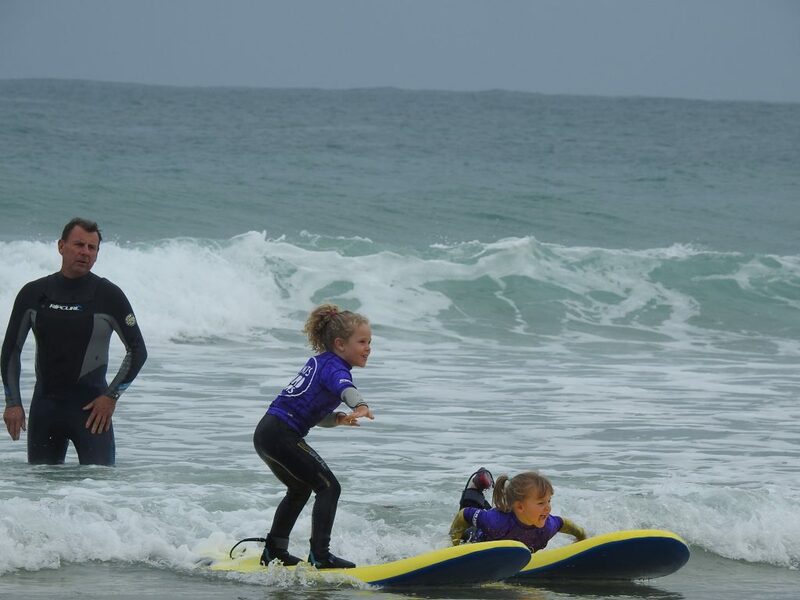 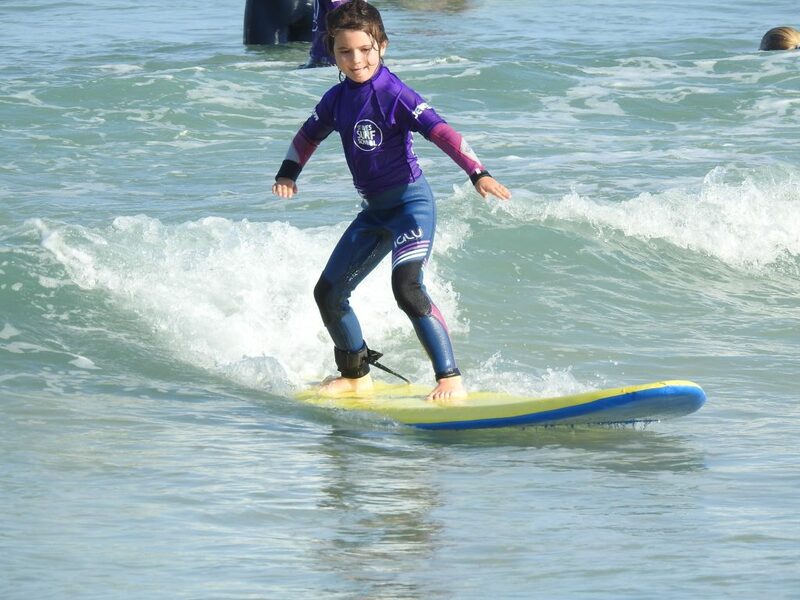 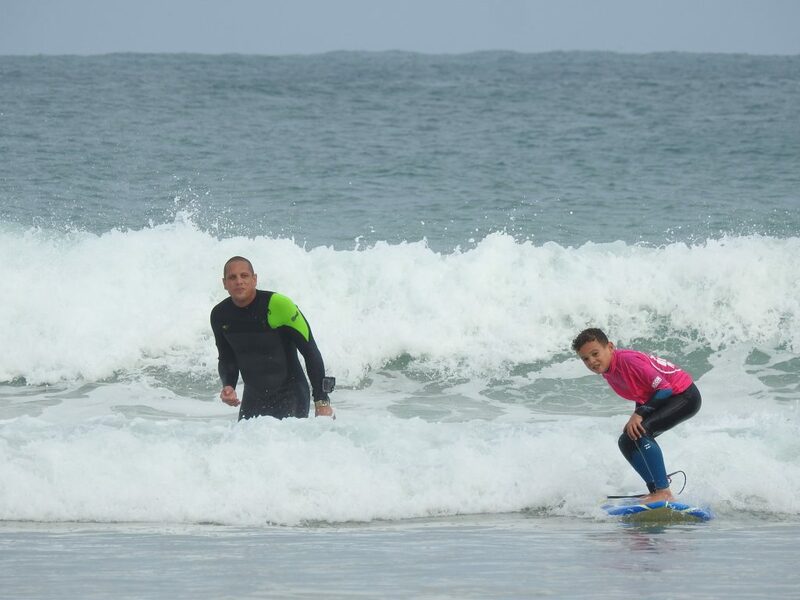 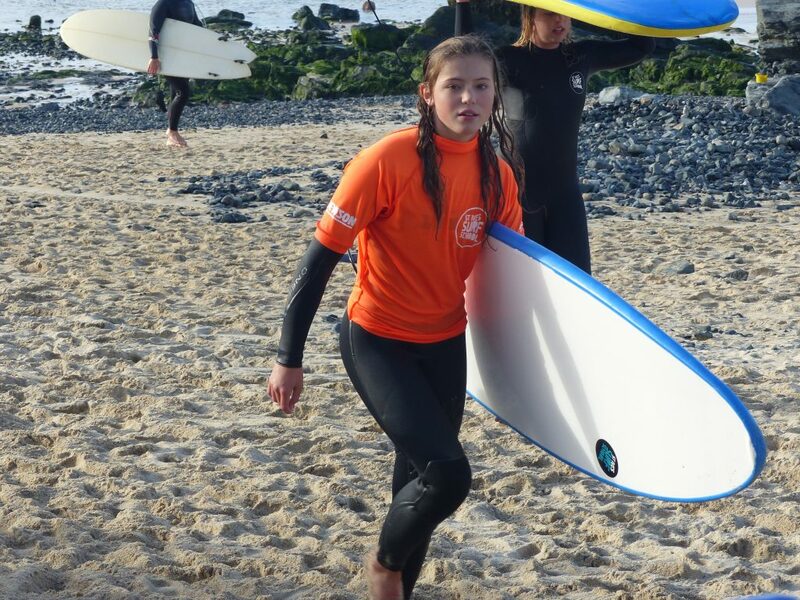 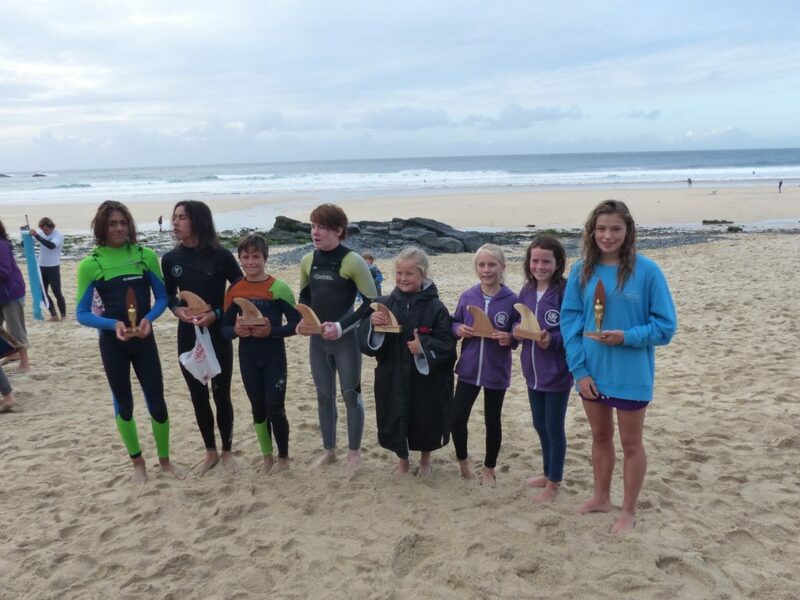 They were nominated by The Wave Project – the charity group who follow our juniors into the water on Saturday mornings with their own junior surfers and work with the surf school coaches to develop the skills and confidence of those children through their surfing. 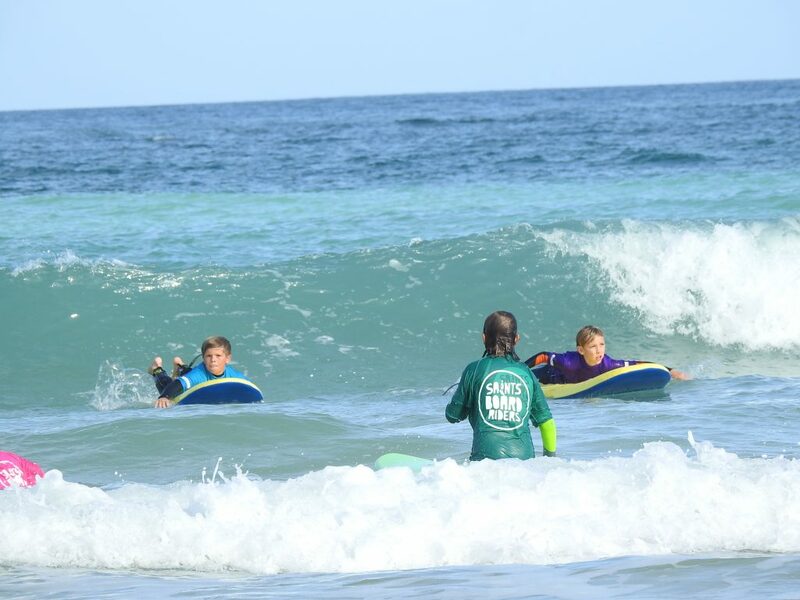 The school and the Wave Project have been working together for three successful years now, and have brought many youngsters through the scheme already. 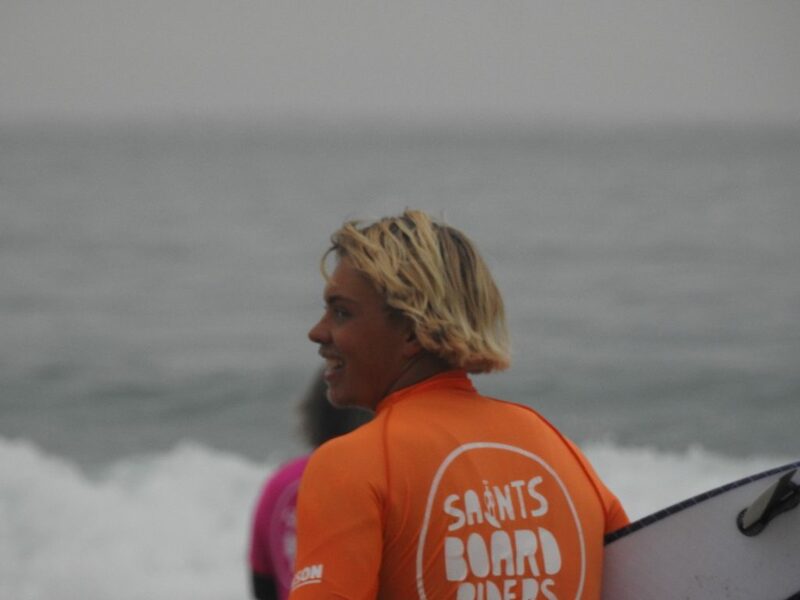 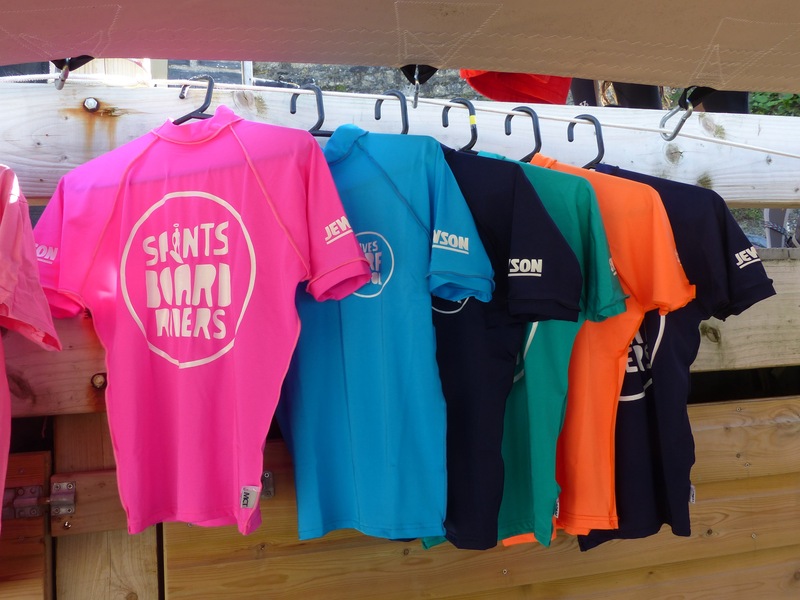 With regard to the surf school’s work in the local community, Saints Boardriders and the Wave Project are only a part of what it offers! 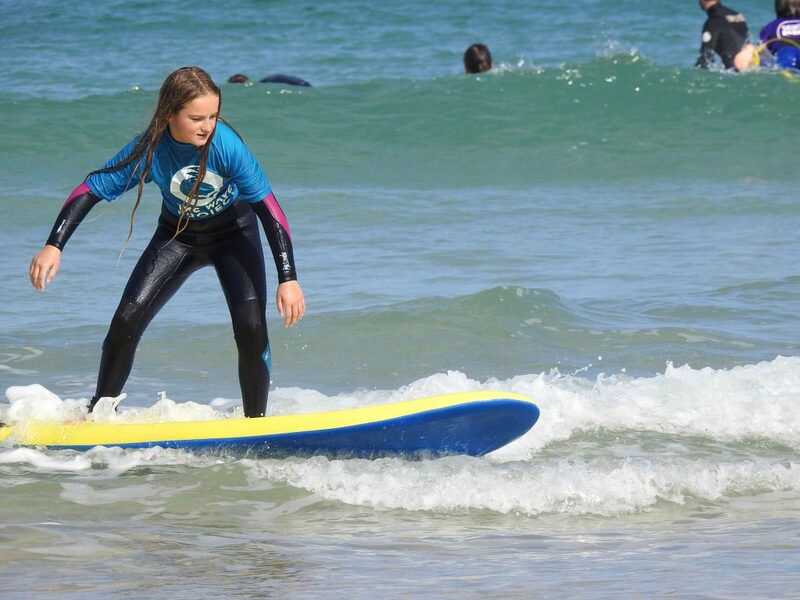 There are Ladies Nights in the early summer when the girls can share their own fun surfing sessions in the evening sunshine.The surf school has become a popular venue for kids birthday parties – a surf lesson and a picnic from the beach cafe releasing the parents from all the stress of entertaining the children! 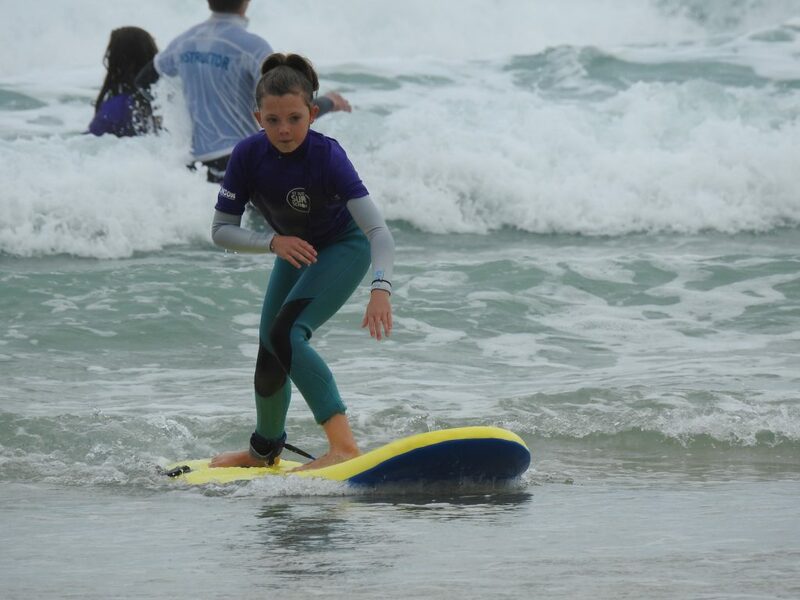 It also provides tuition to an after-school surf club from one local school, and hosts an activities week for classes from another.In a new departure, the past summer saw the school entertaining a mixed- age group from a Camborne village with an all-day beach camp encompassing surfing, bodyboarding, volleyball, sand-castle building and an evening session rock-pooling for the younger children. 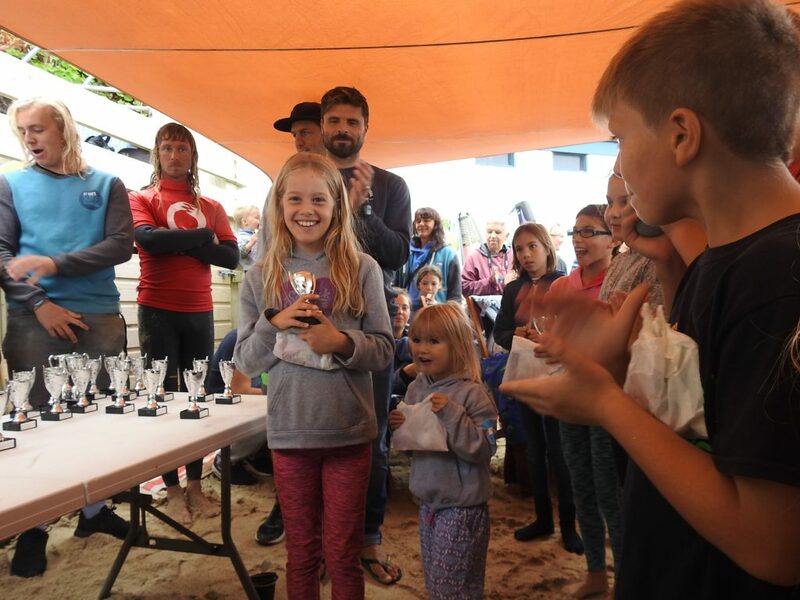 For nearly twenty years now, the school has been a much-loved activity for the Chernobyl Children who are brought to St. Ives from Belarus by a local charity each year for a holiday which also incorporates health checks, dental checks and dietary supplements to improves their life chances. 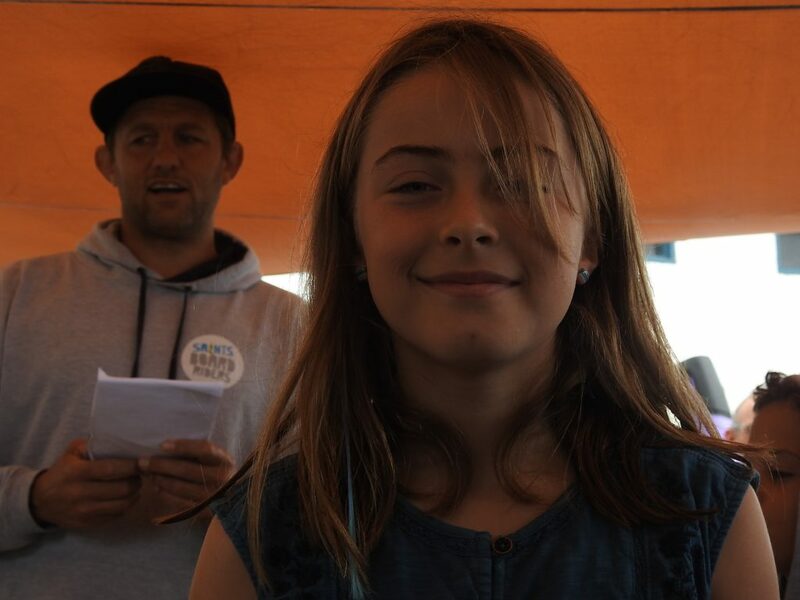 This year’s group spent two days of their visit with the school, and they improvised an impromptu song in gratitude when it was time to leave. 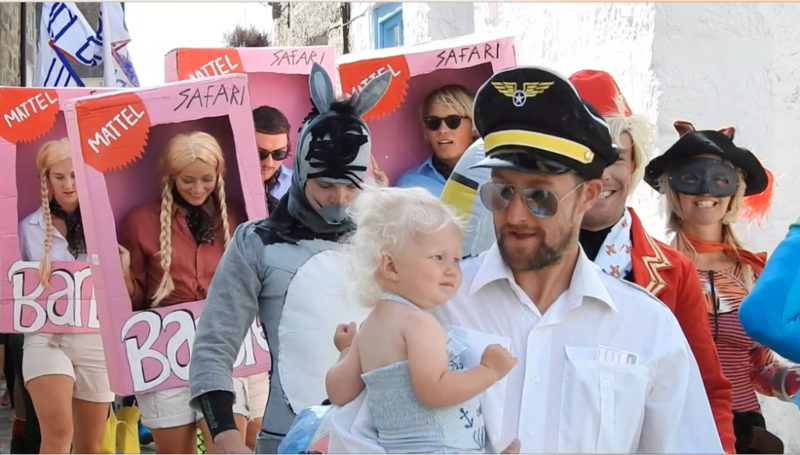 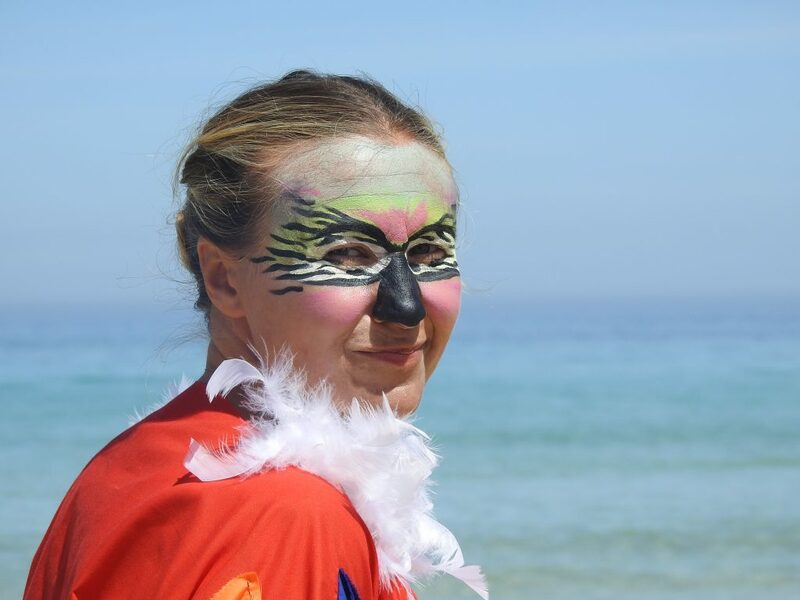 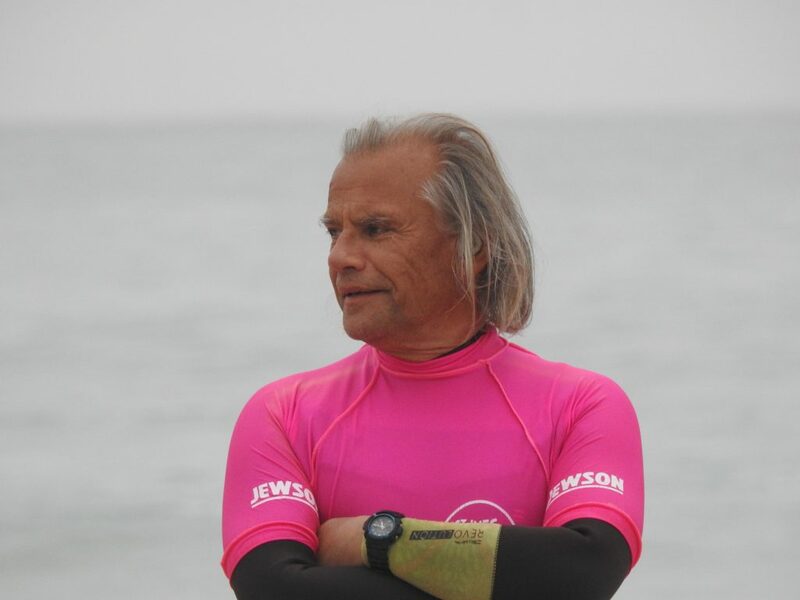 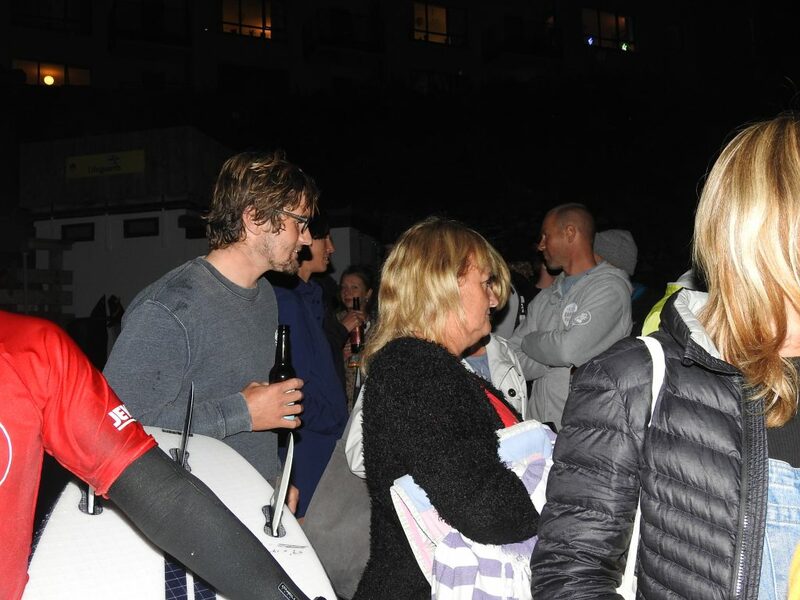 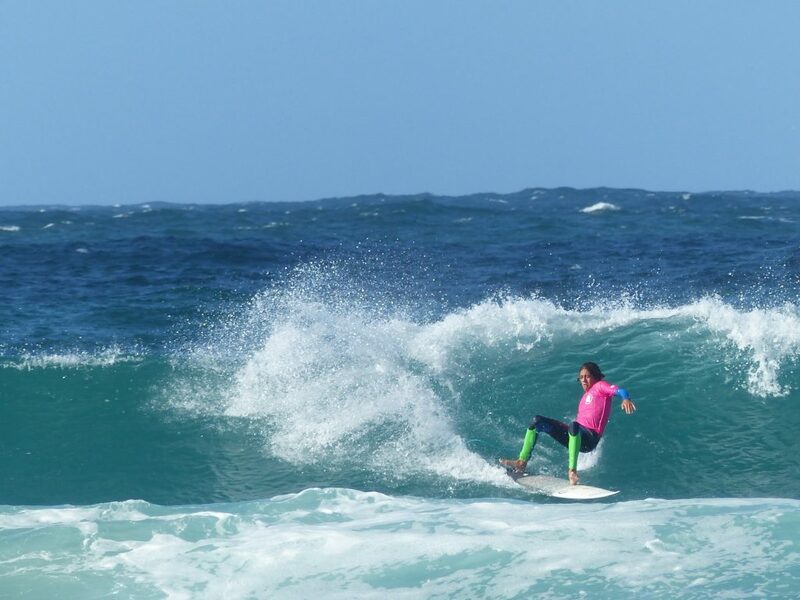 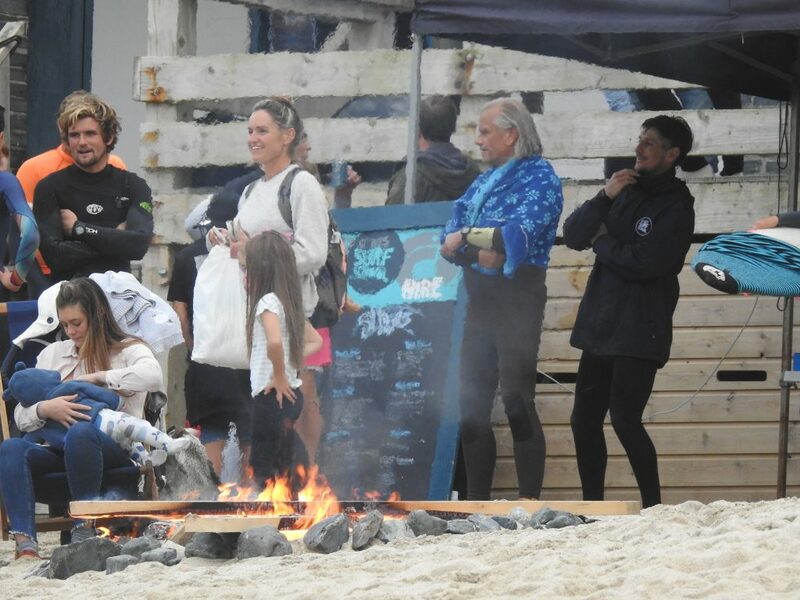 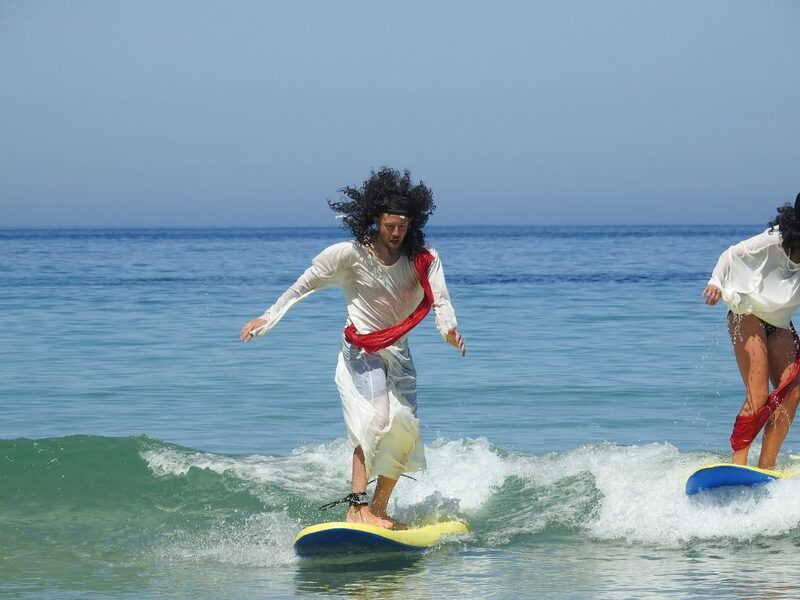 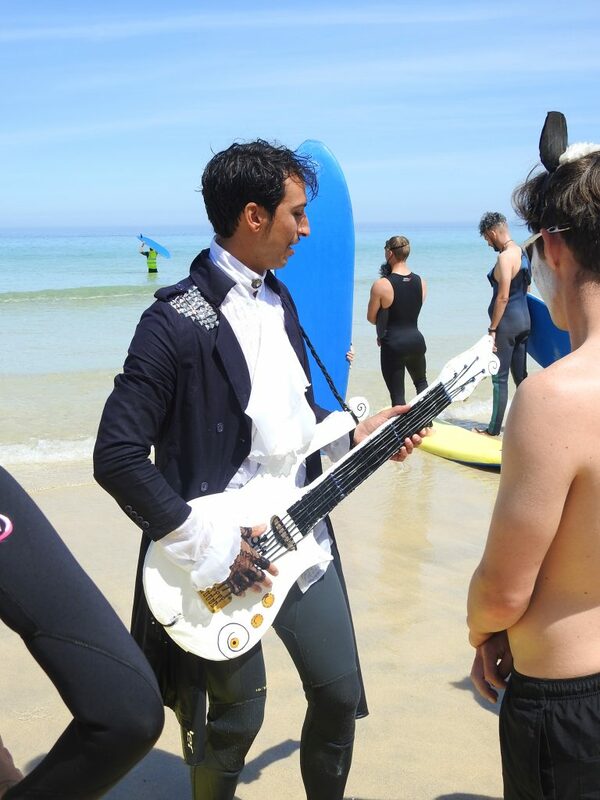 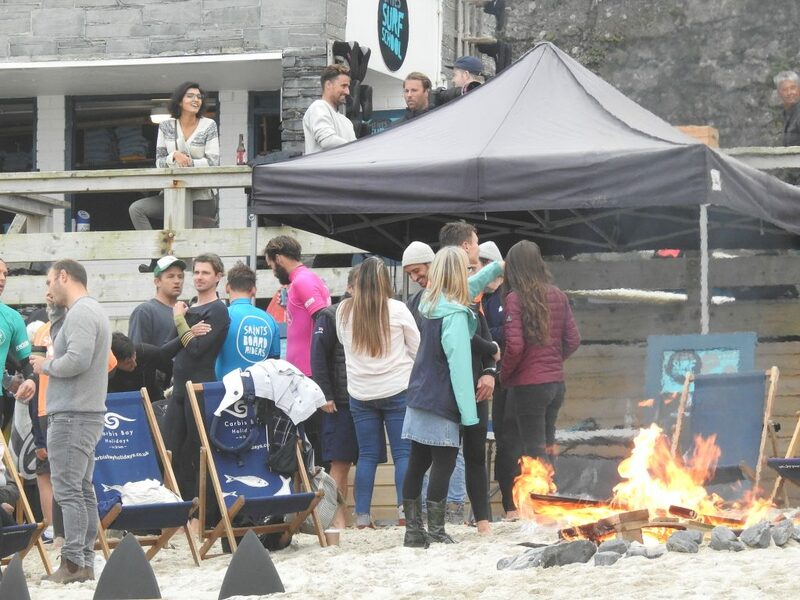 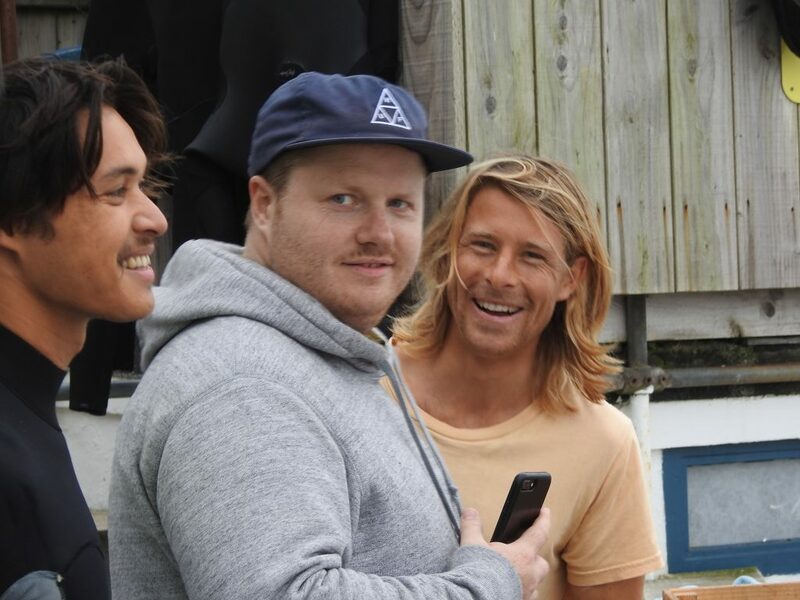 The annual Fancy Dress Swellboard Shootout that the surf school organises has become an important attraction for the surfing community and draws a full complement of teams and a bumper crowd of spectators to Porthmeor on International Surfing Day. 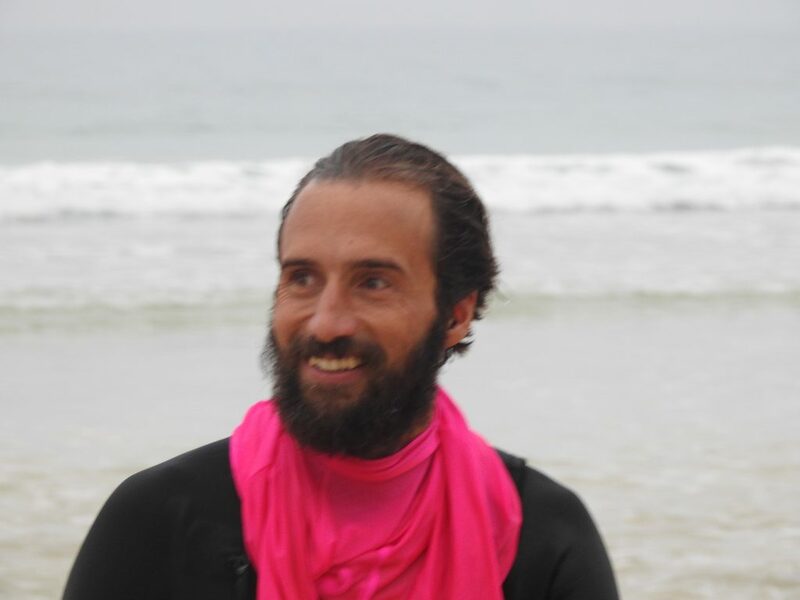 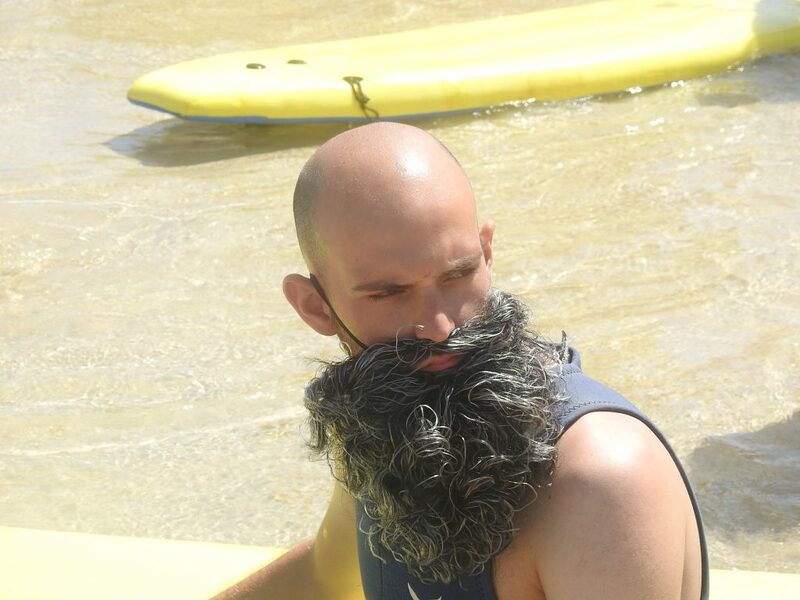 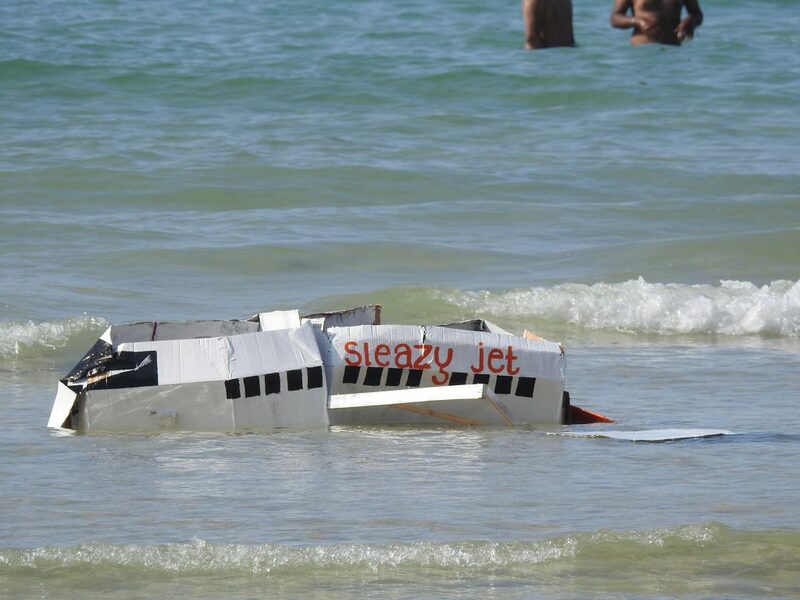 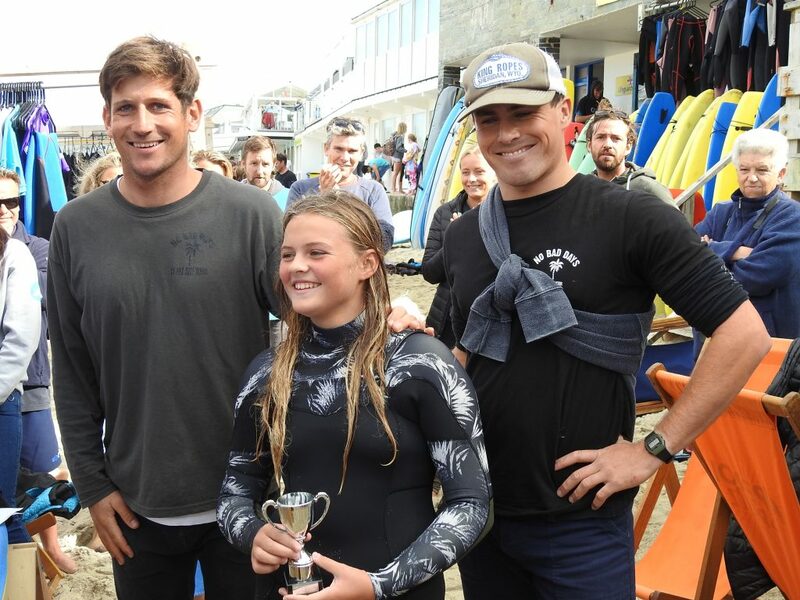 It has provided a good size annual donation to the funds of it’s regular charity Surfers Against Sewage for several years now. 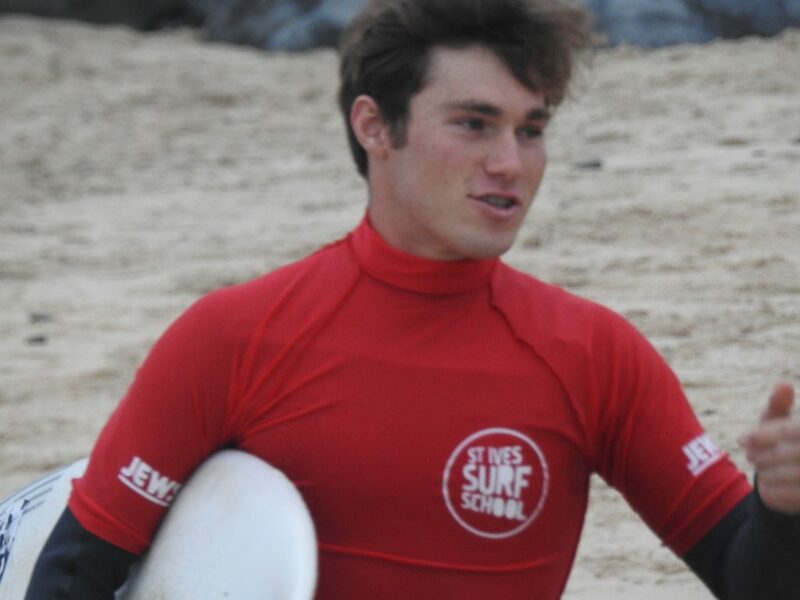 We should also remember the Beach Surf Cinema which the Surf School springs on us once a year. 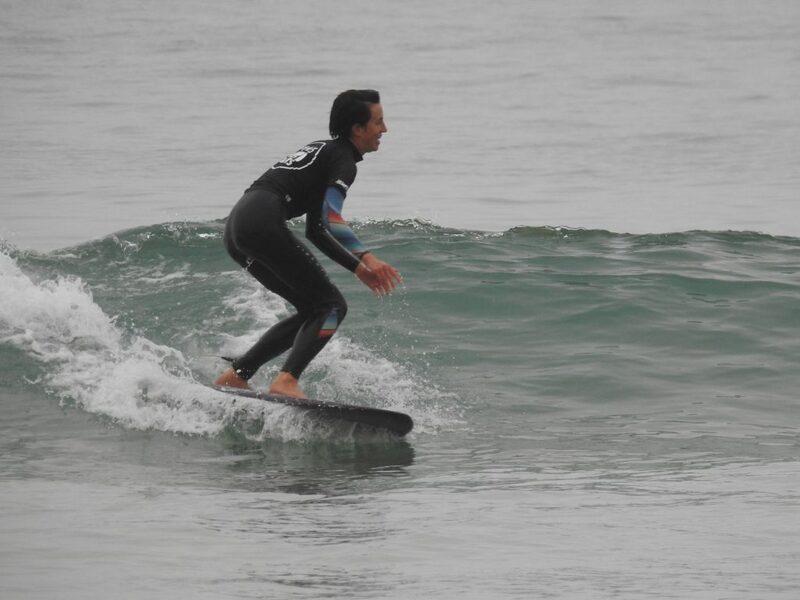 It has been a summer evening treat recently, and unfailingly blessed by perfect weather! 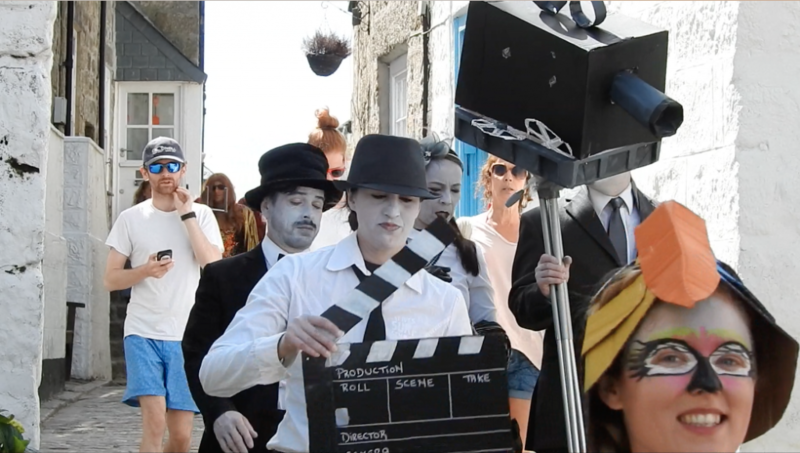 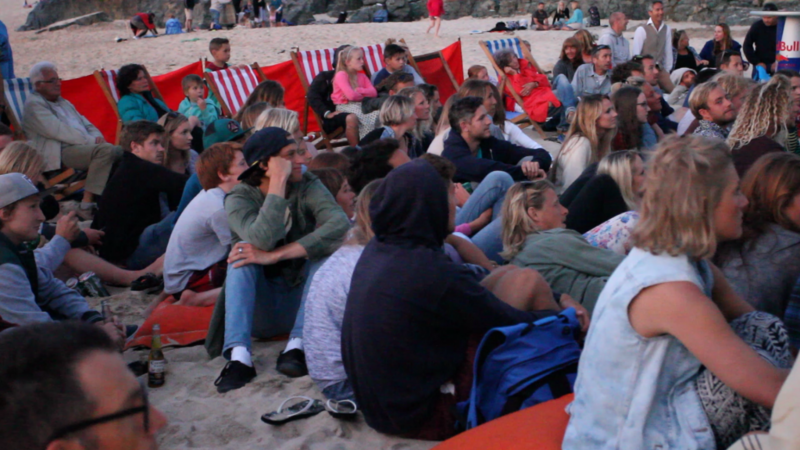 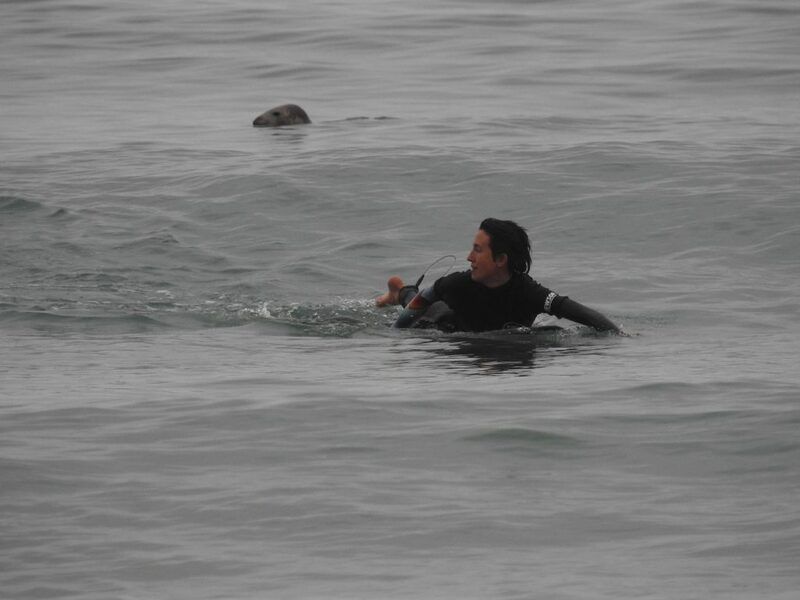 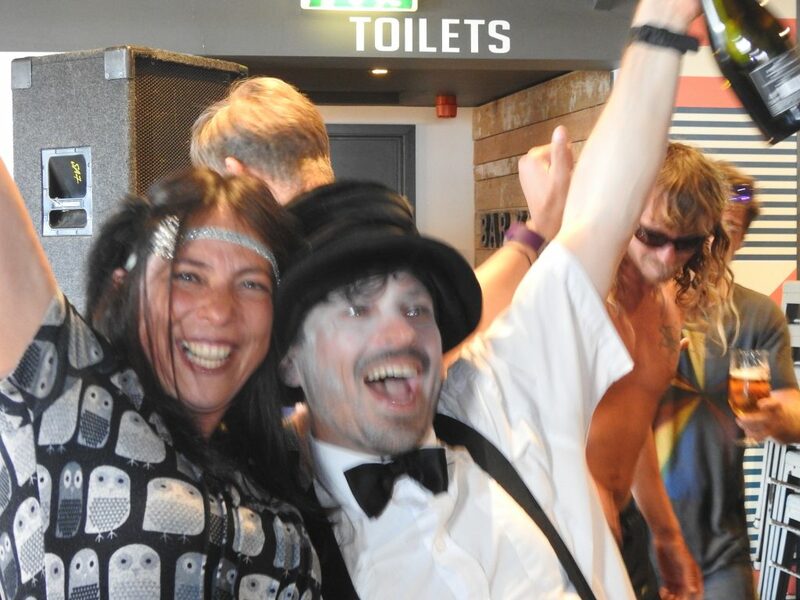 At the flicks – Porthmeor style! 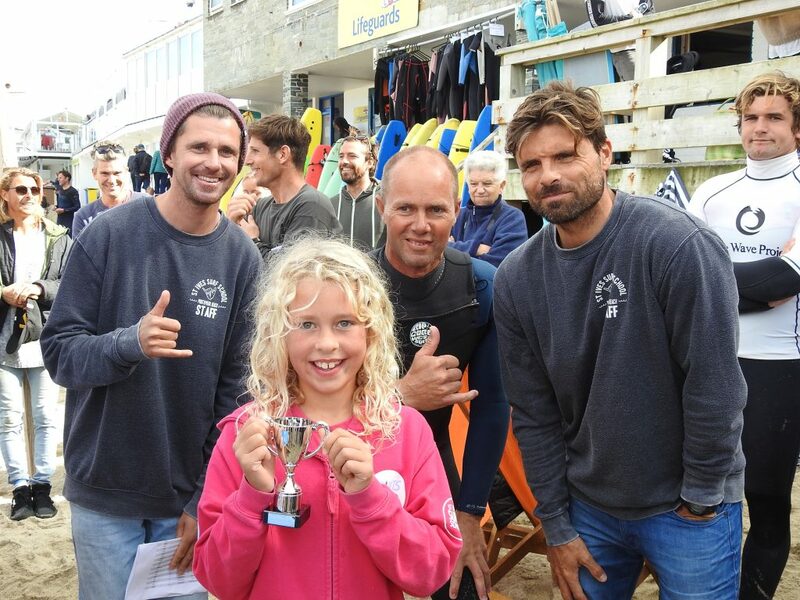 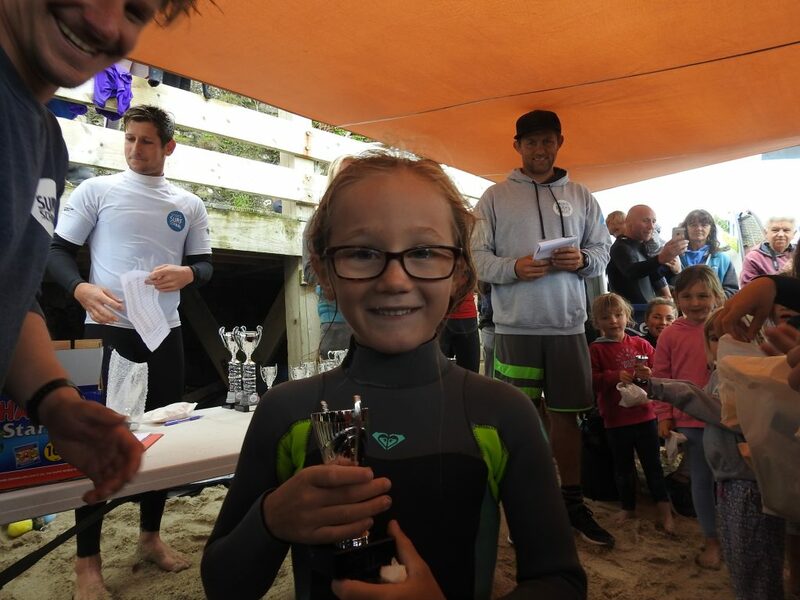 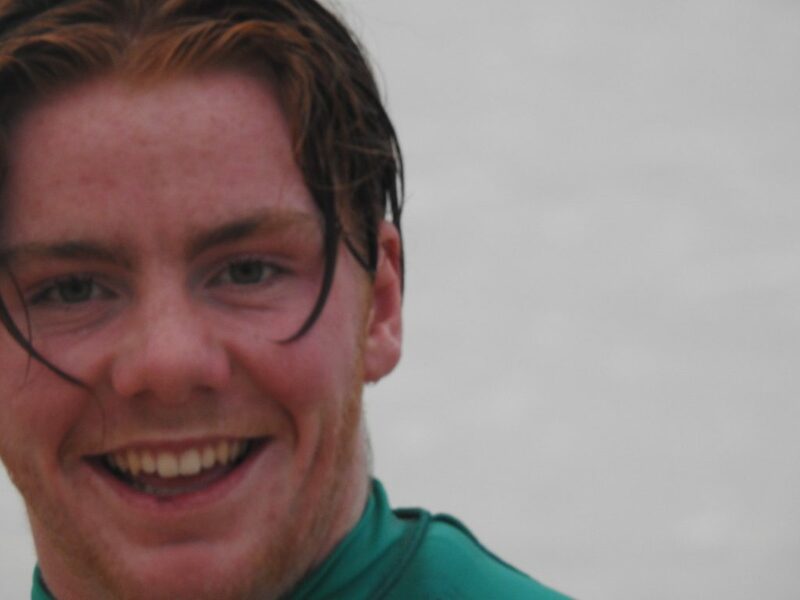 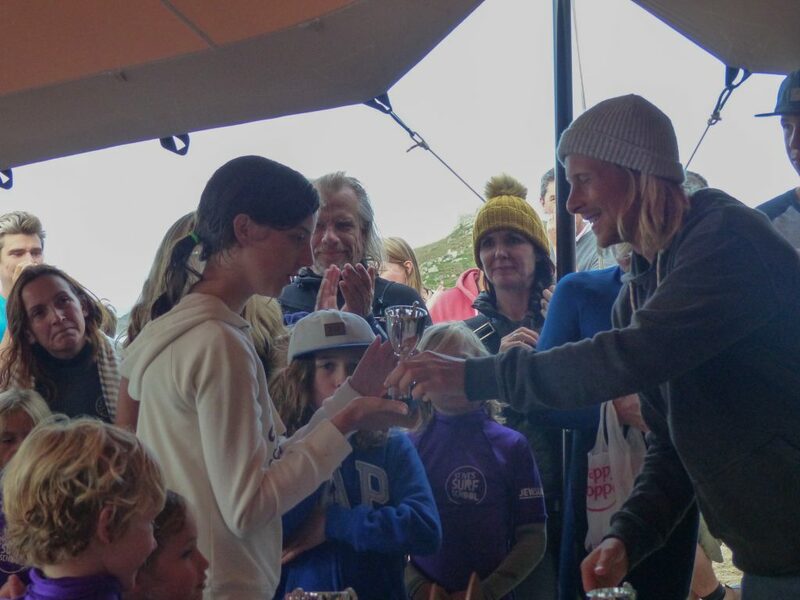 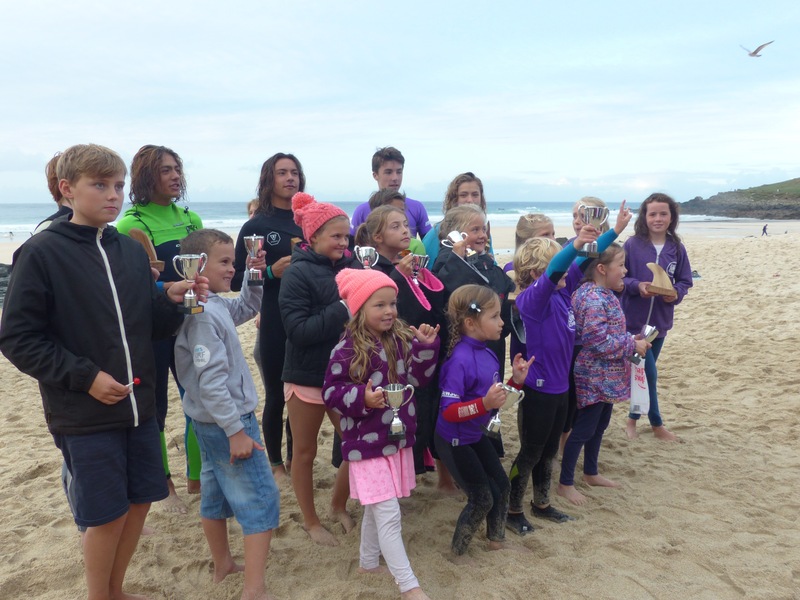 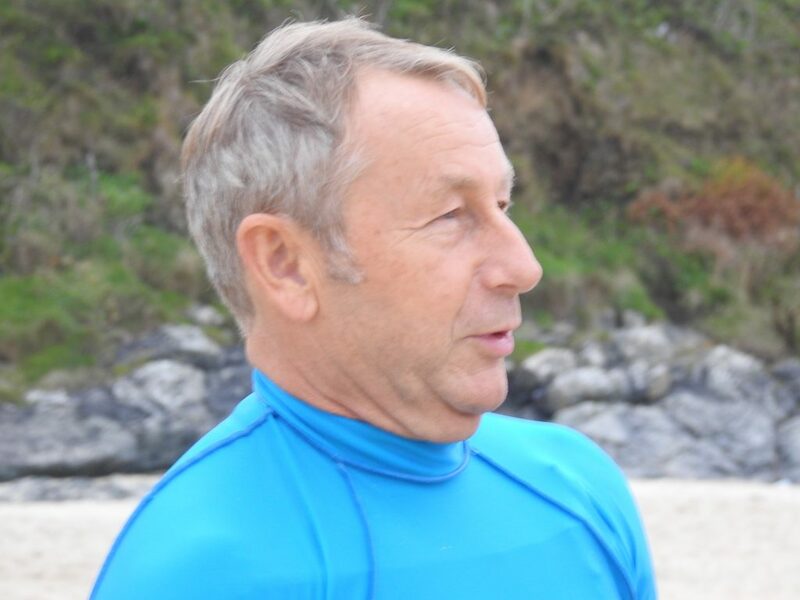 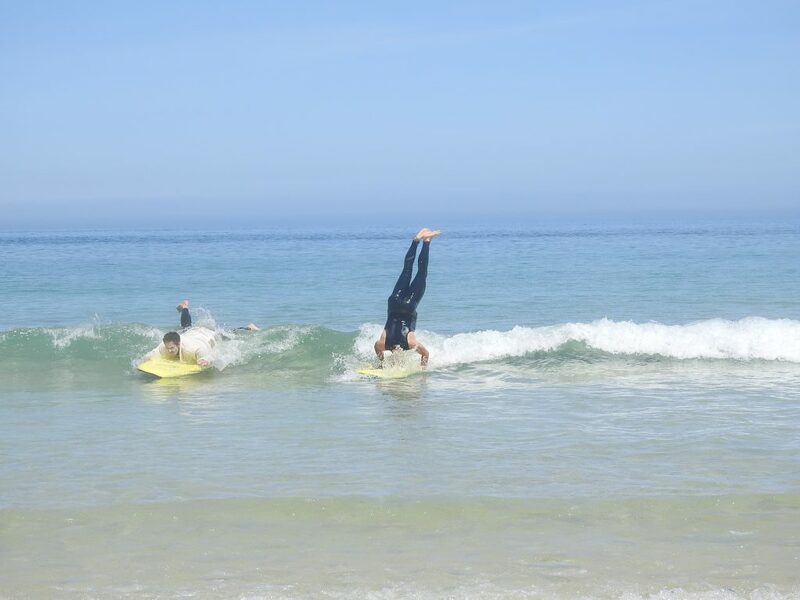 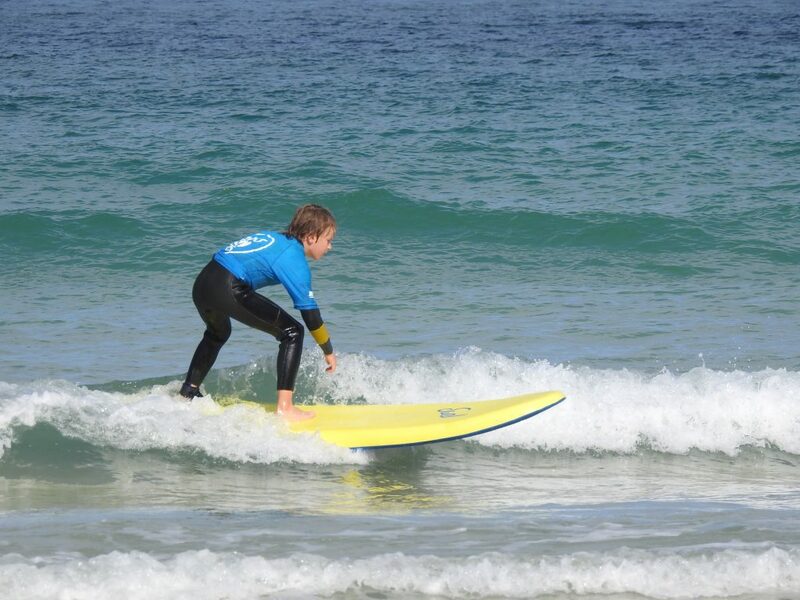 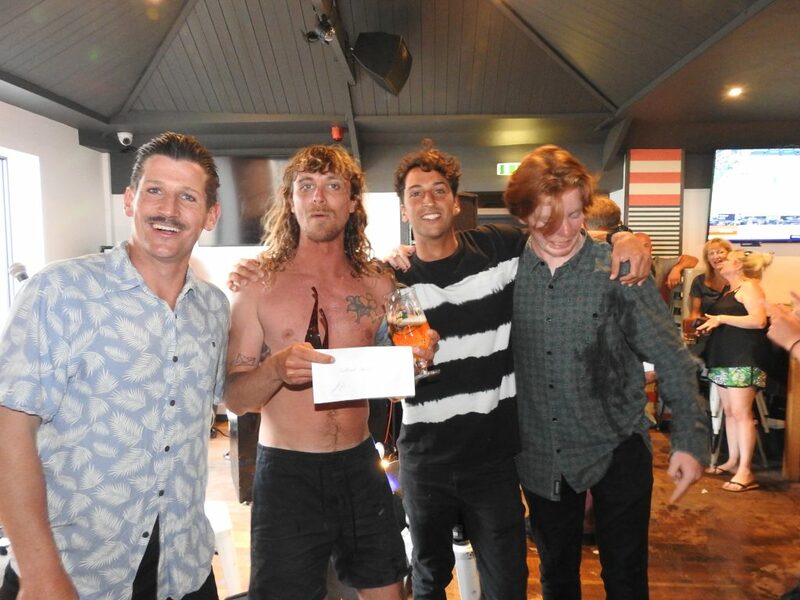 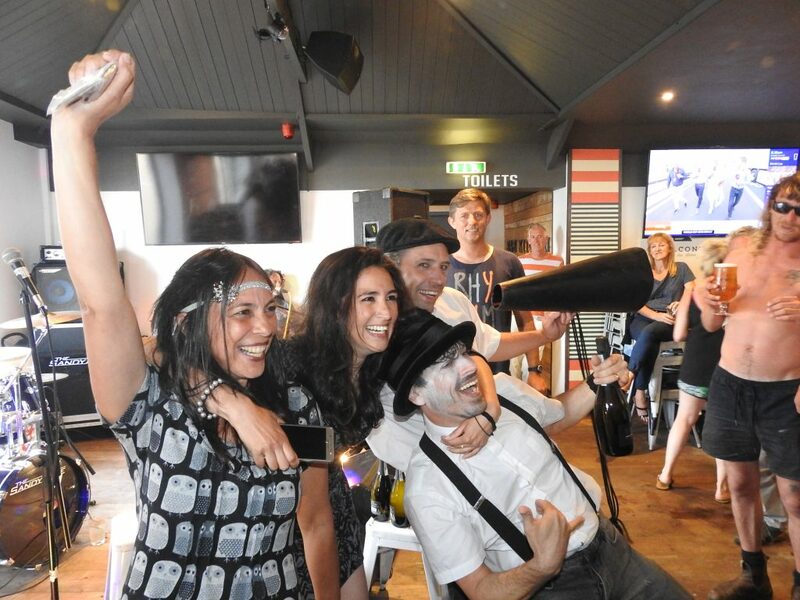 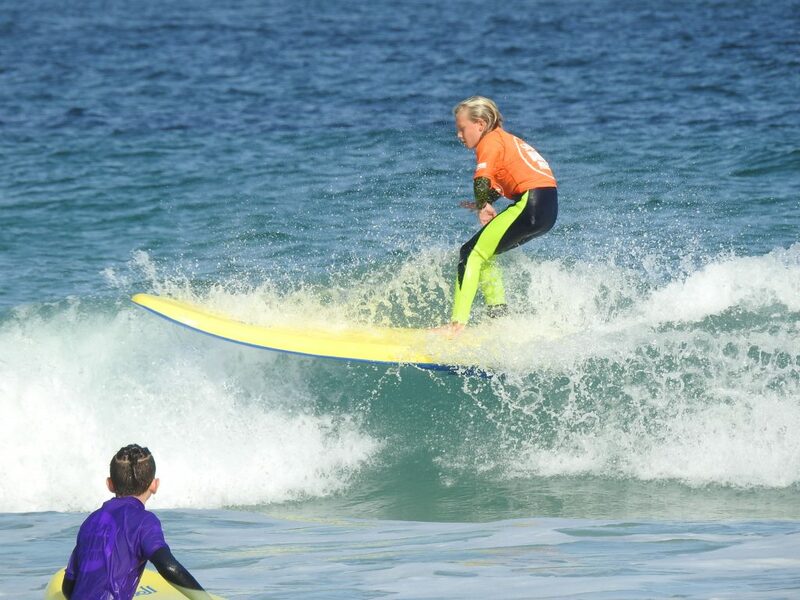 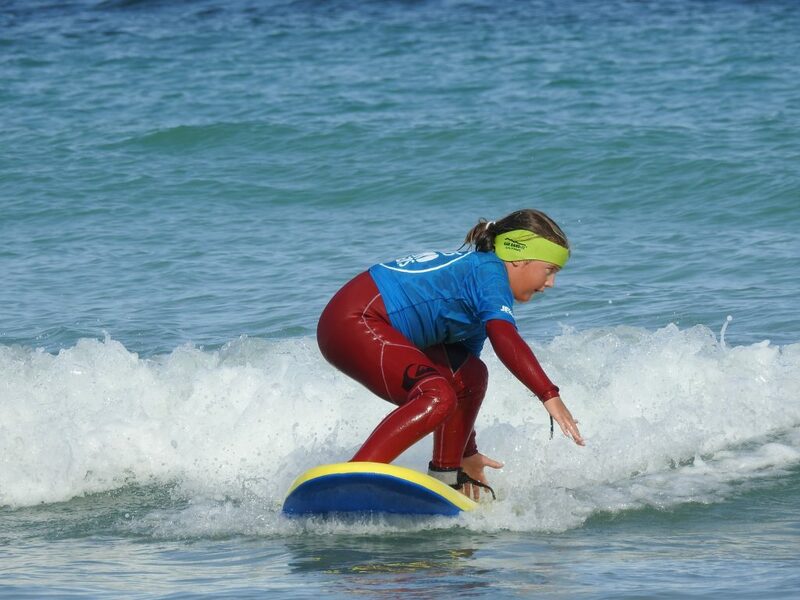 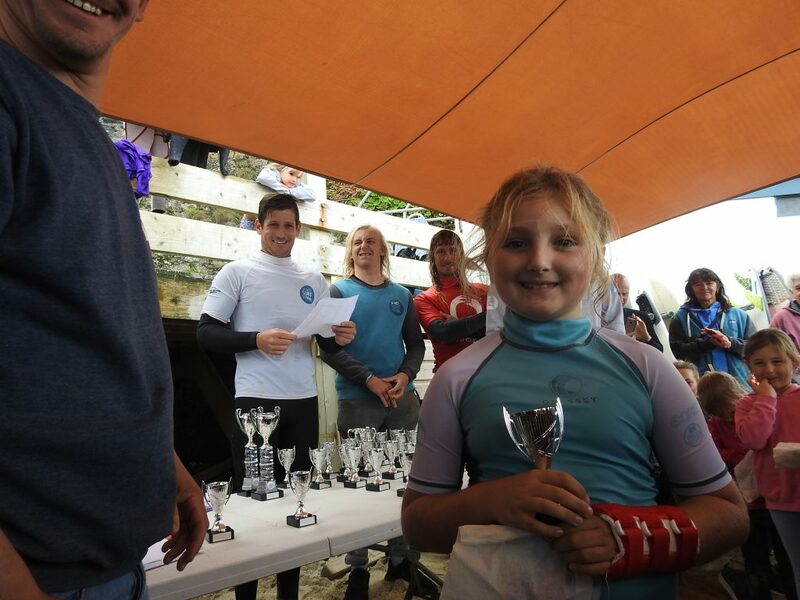 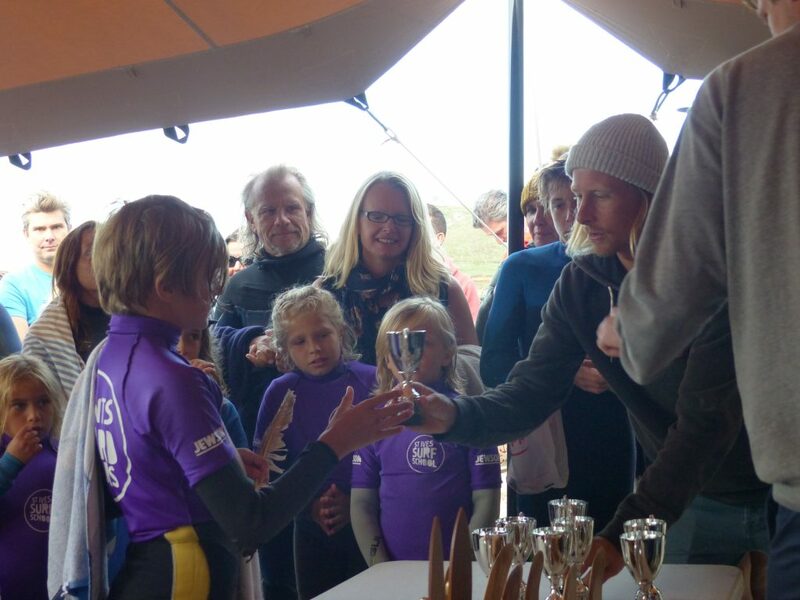 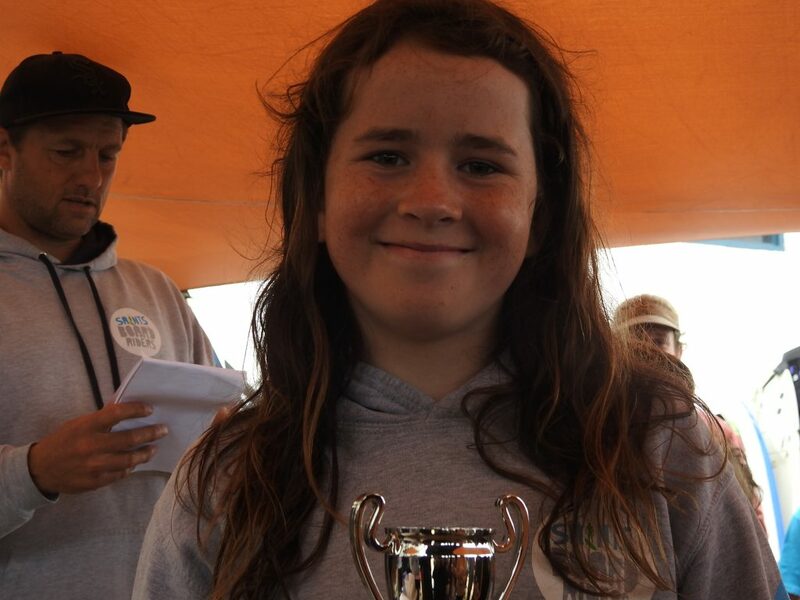 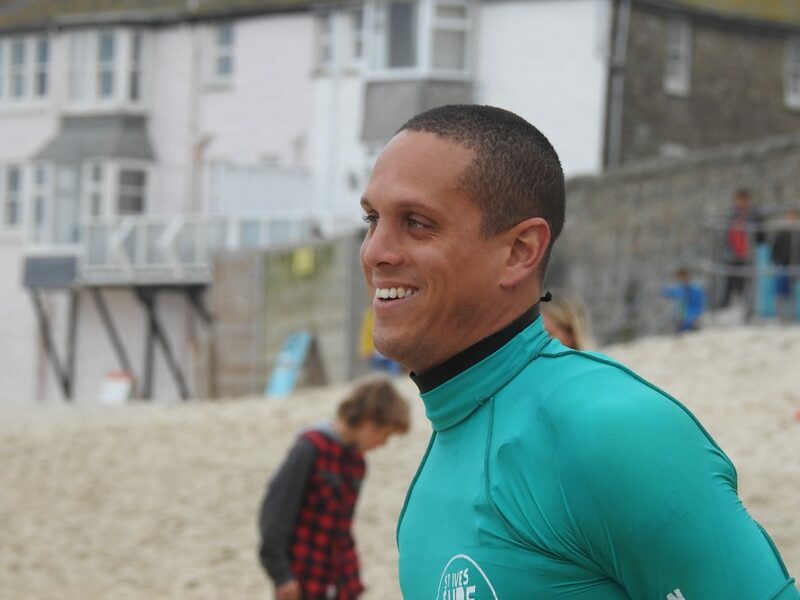 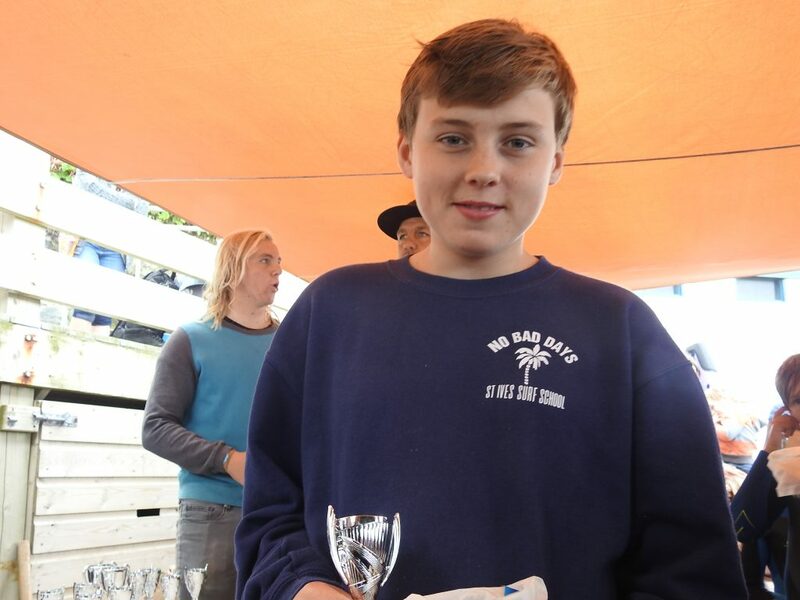 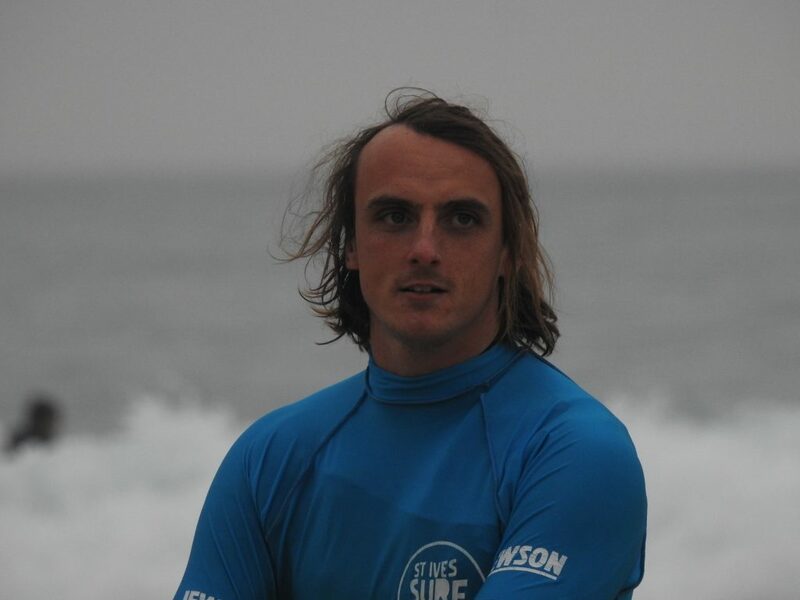 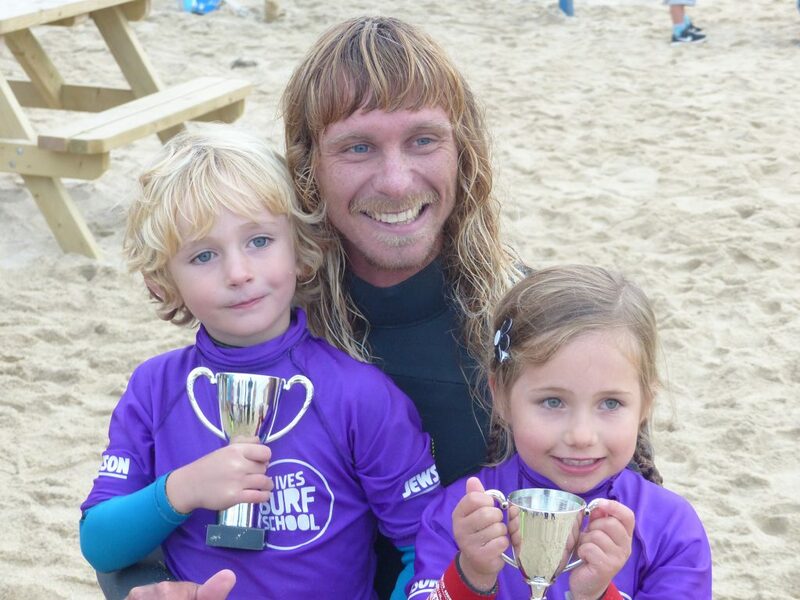 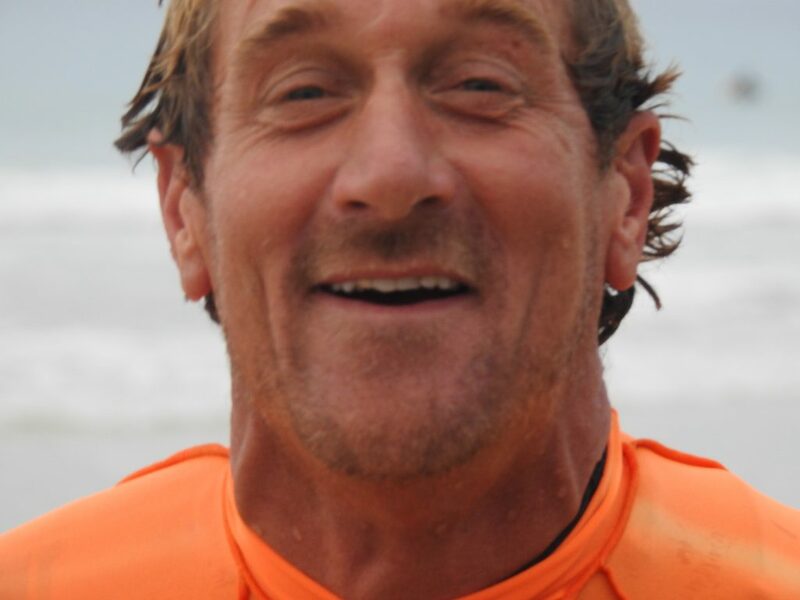 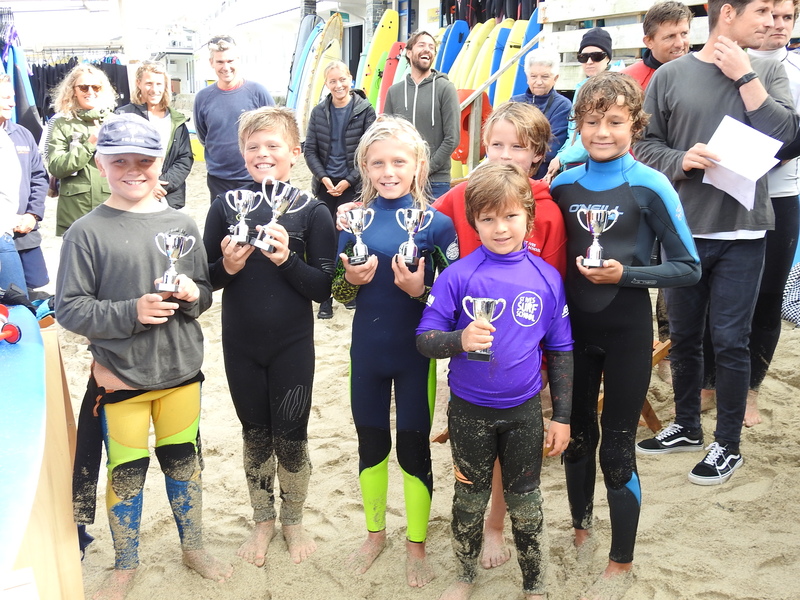 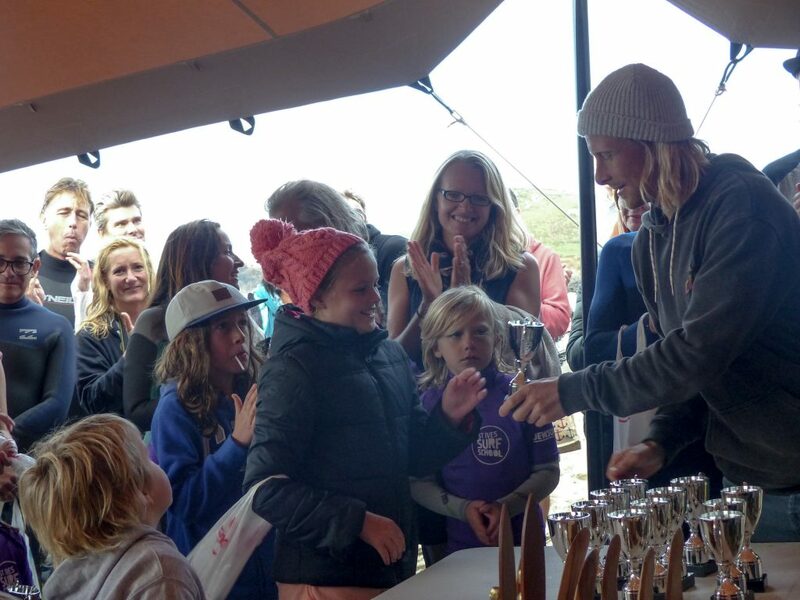 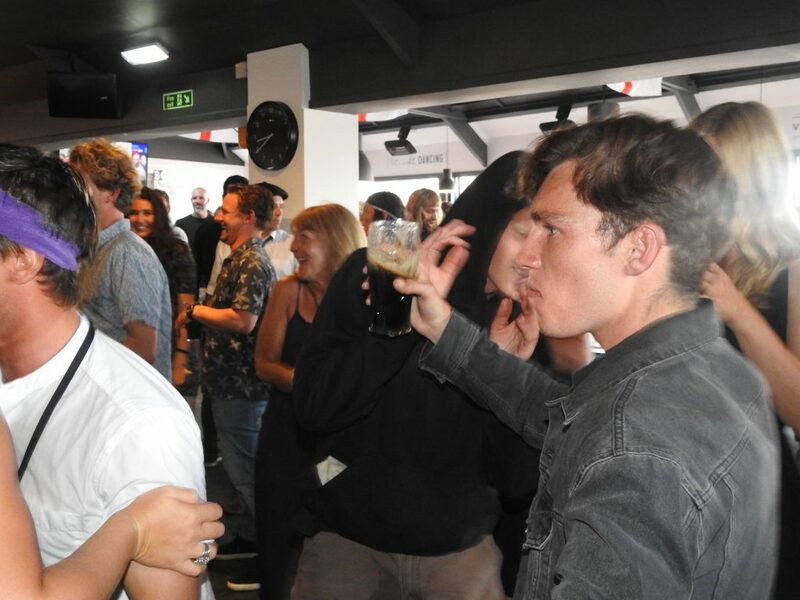 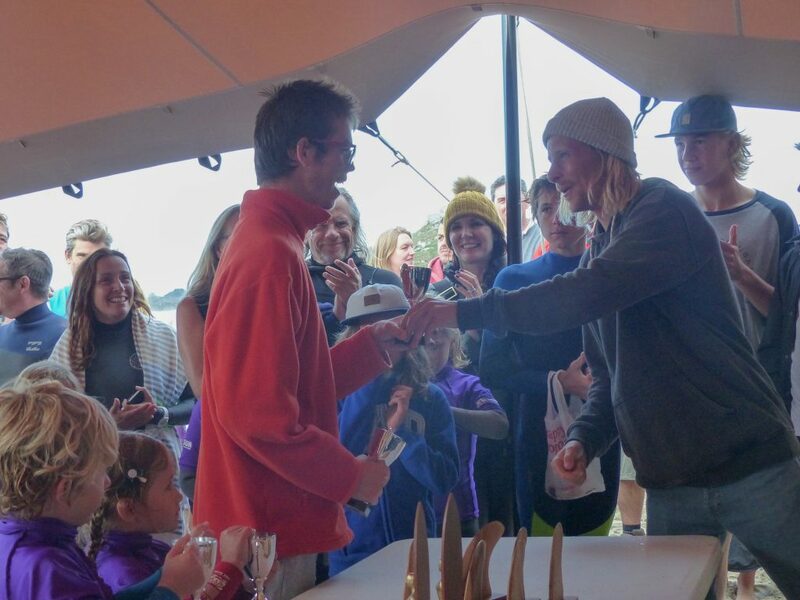 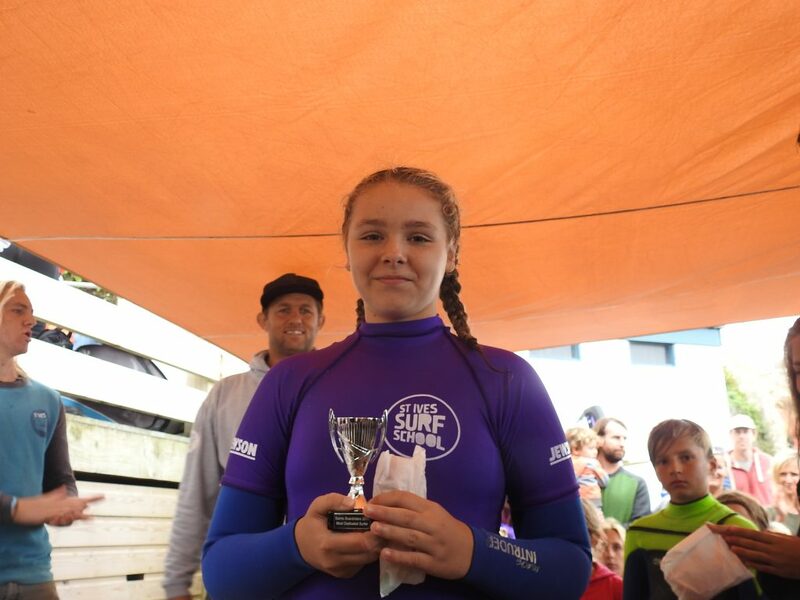 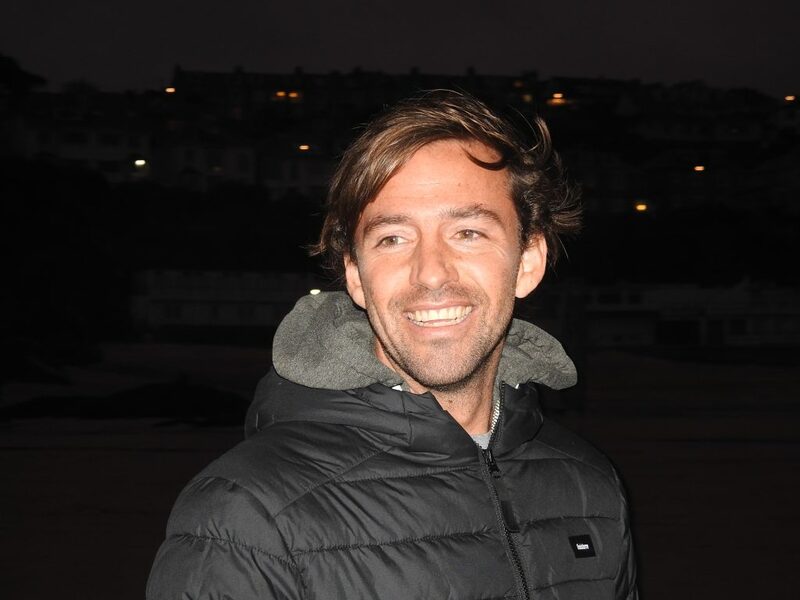 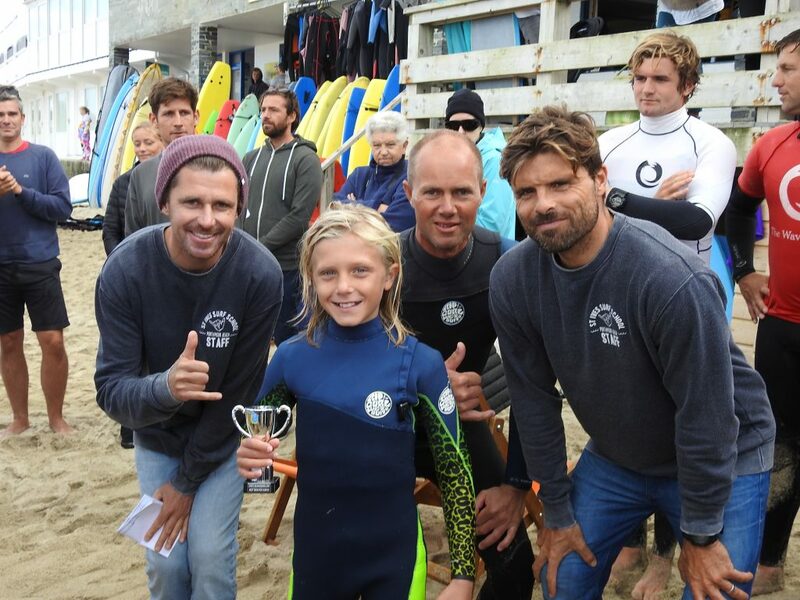 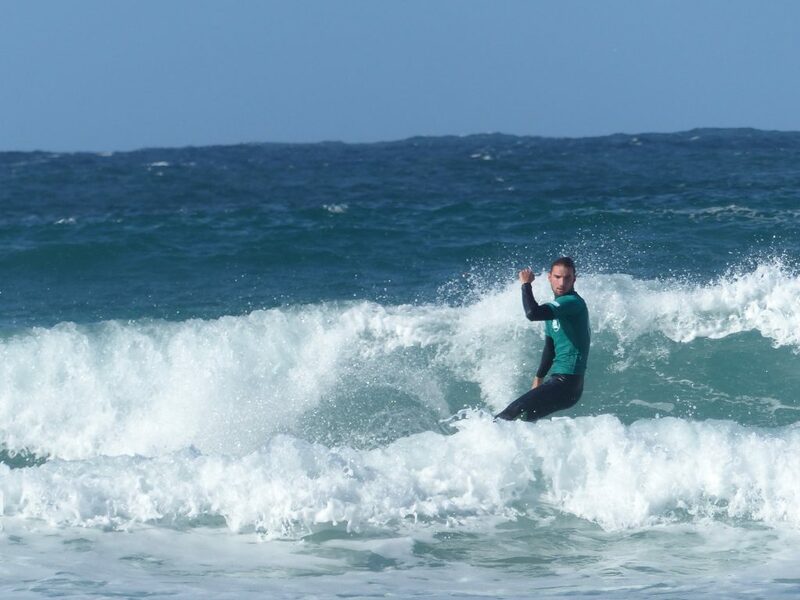 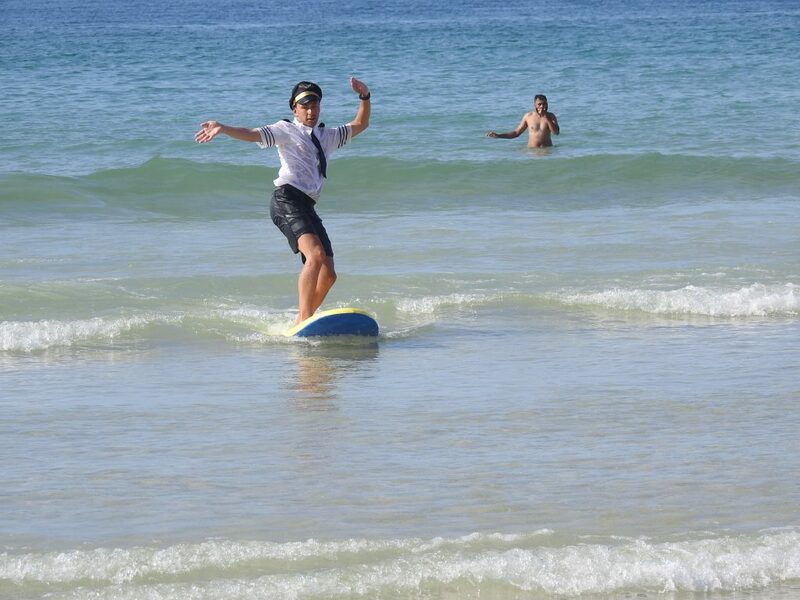 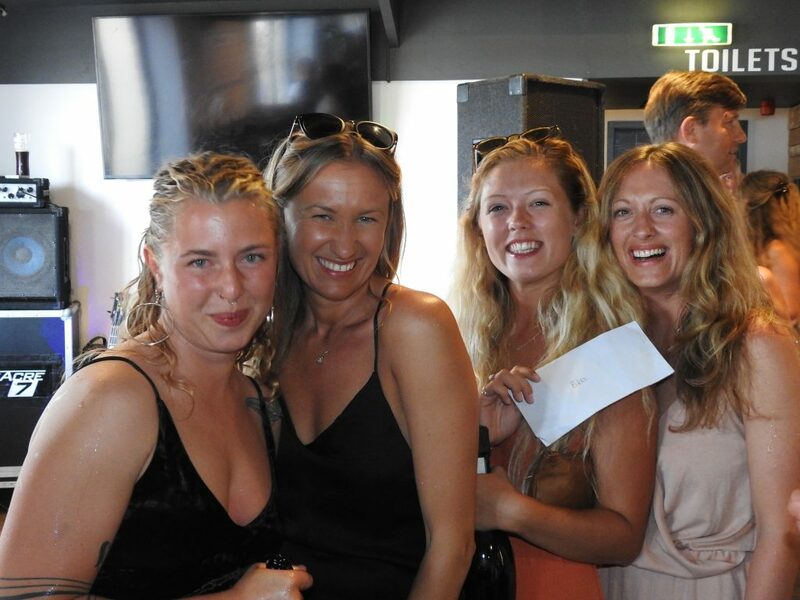 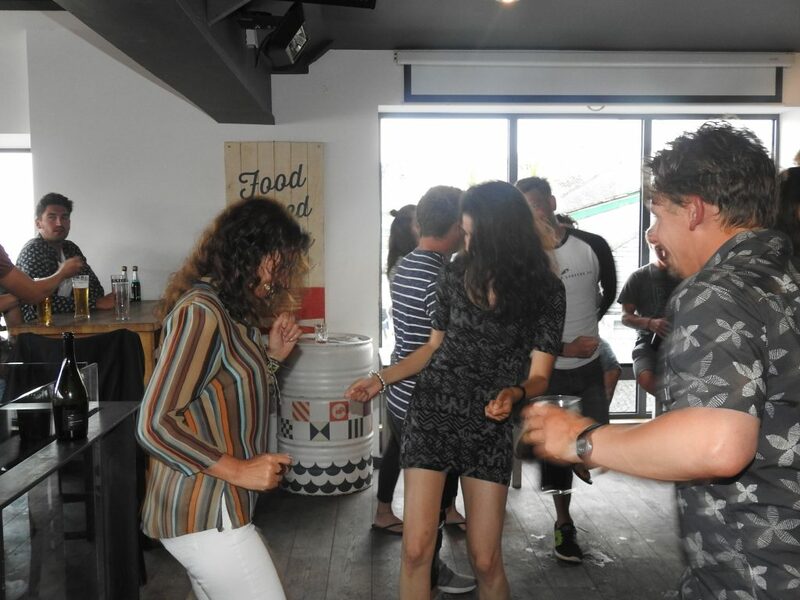 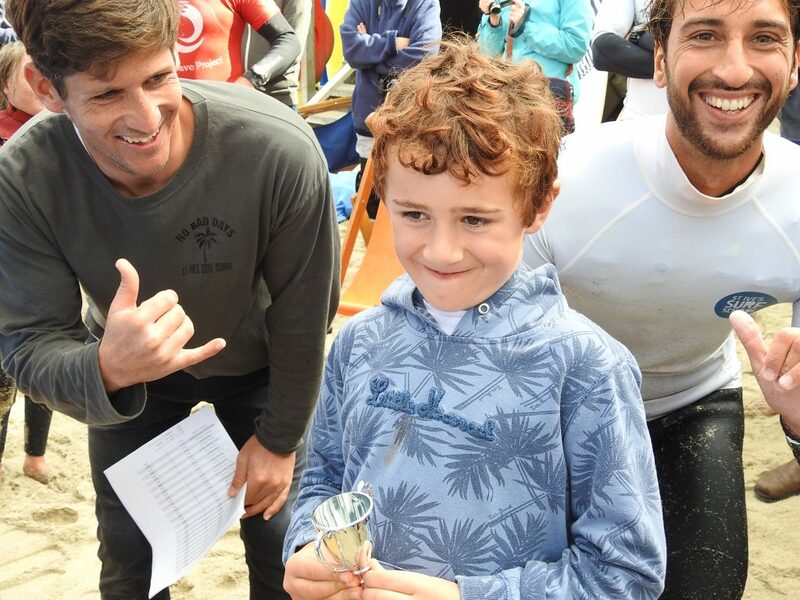 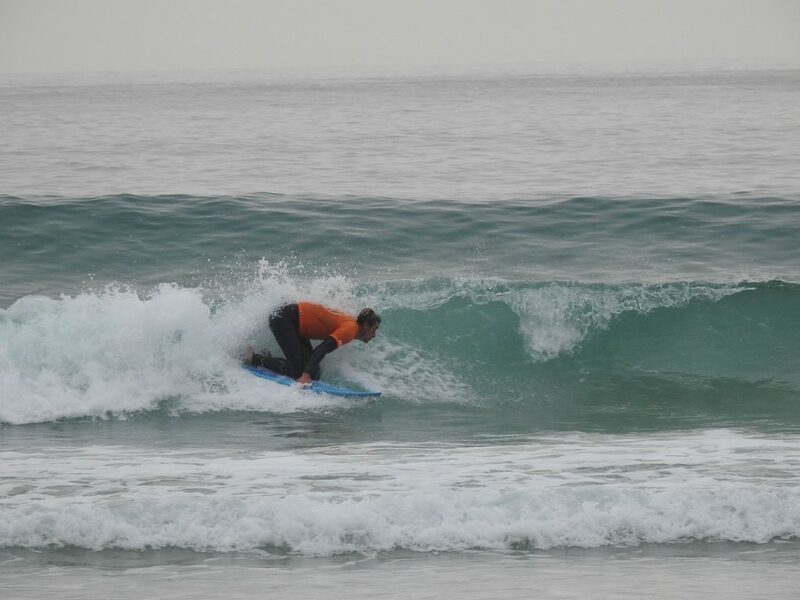 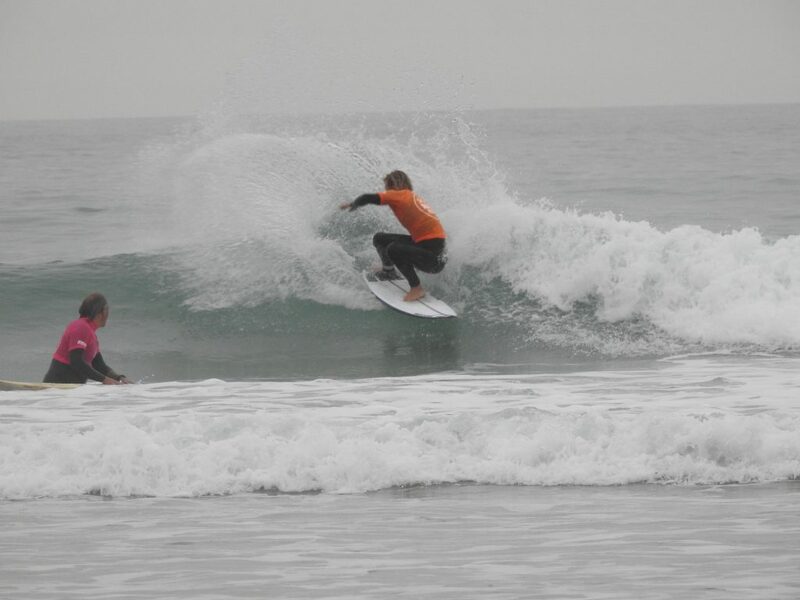 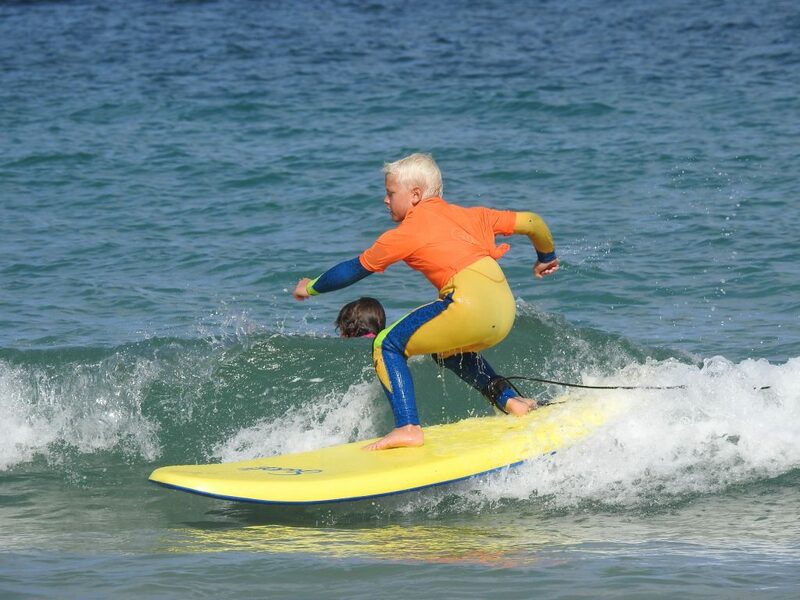 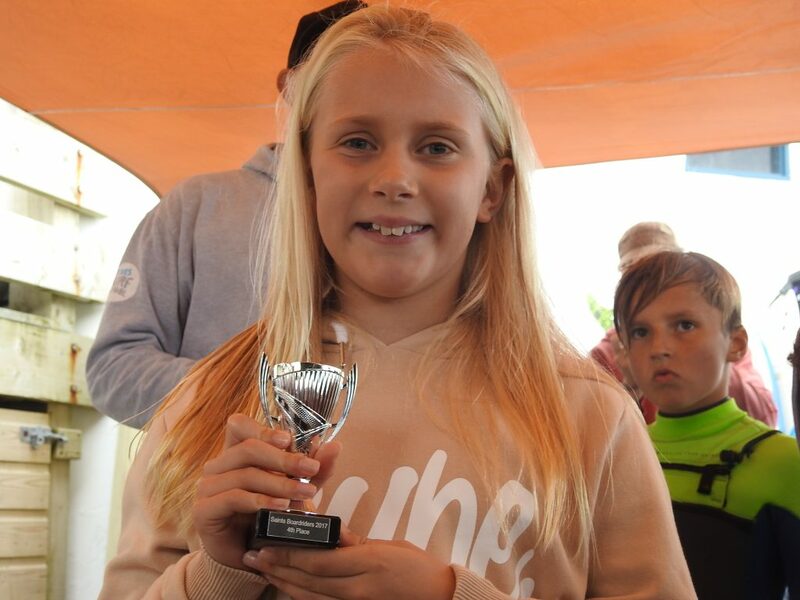 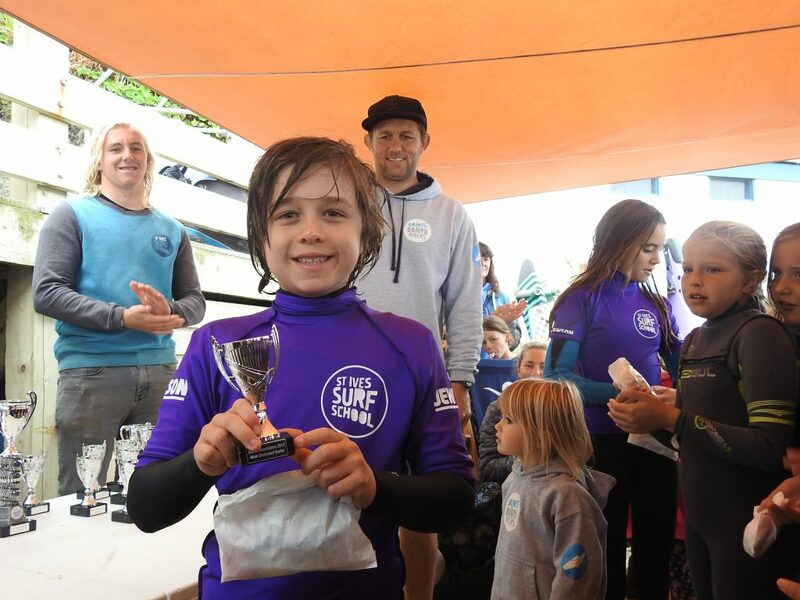 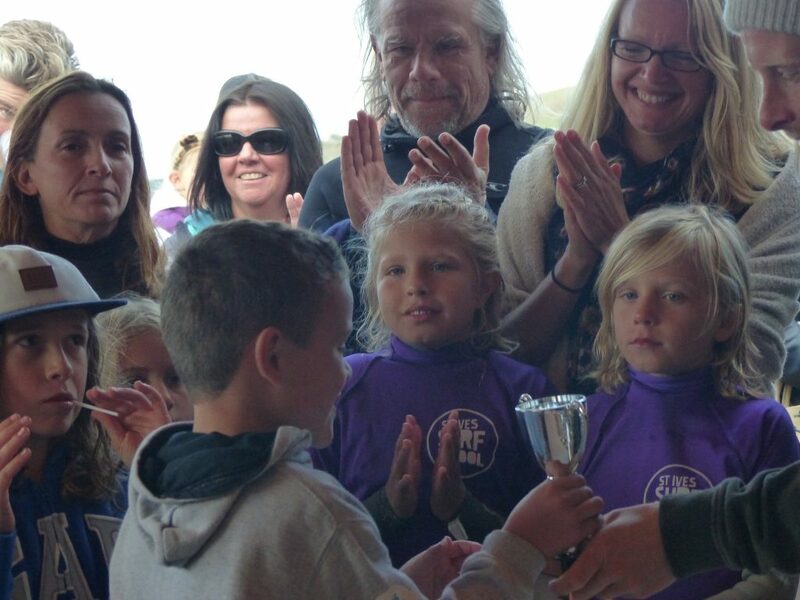 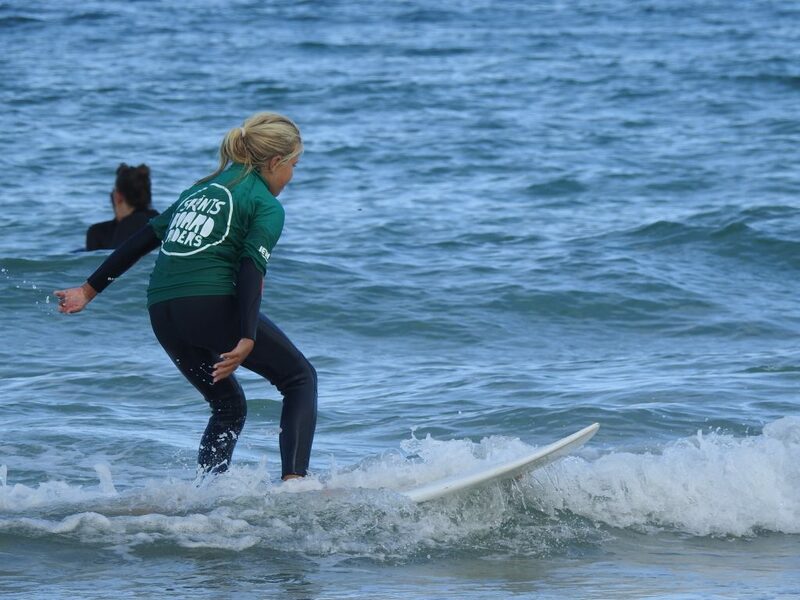 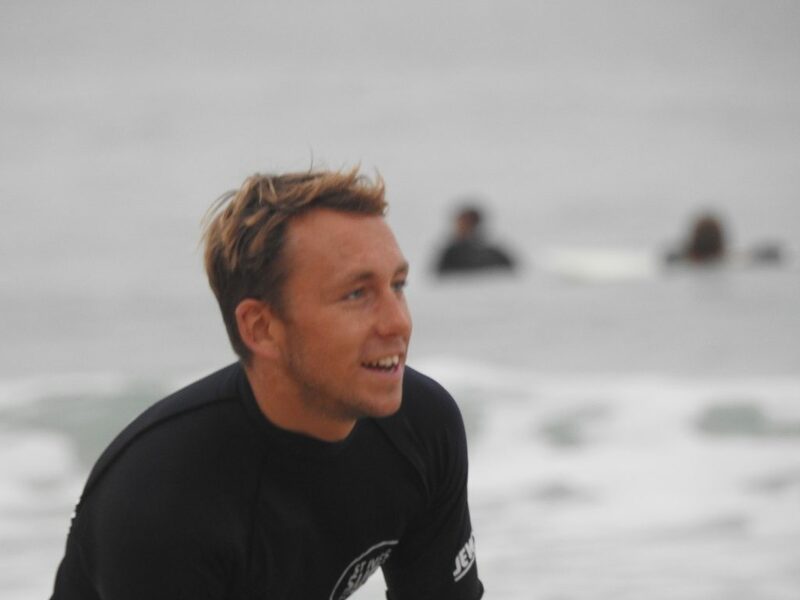 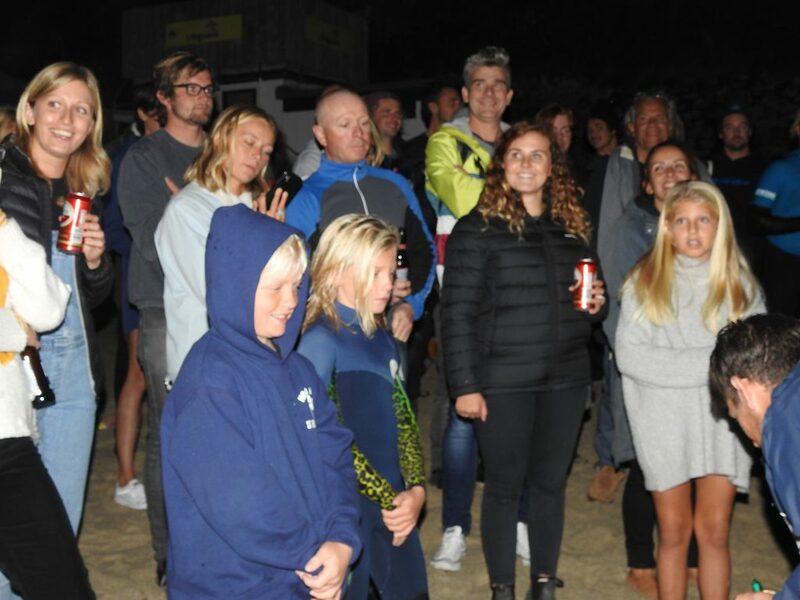 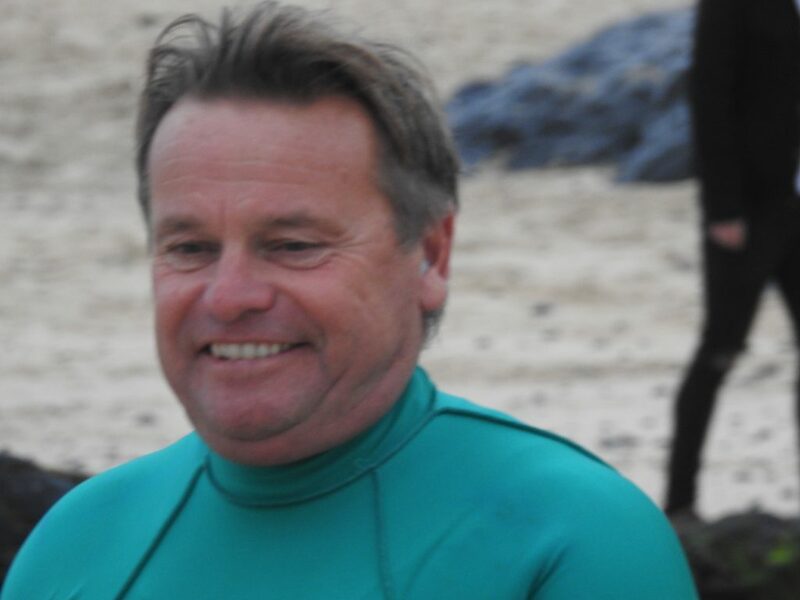 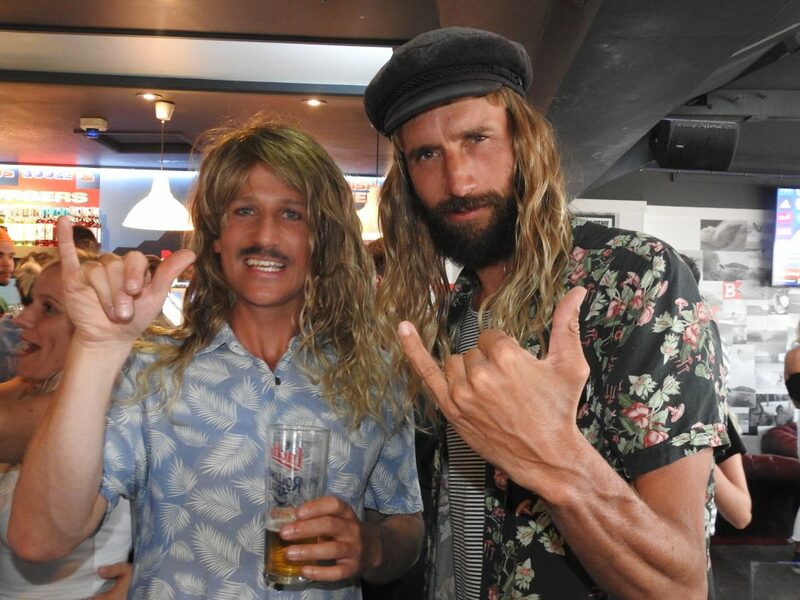 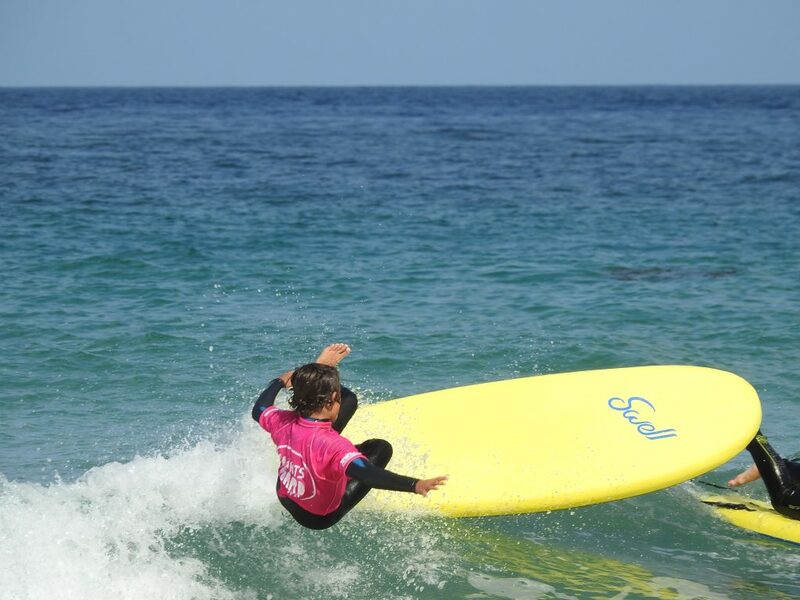 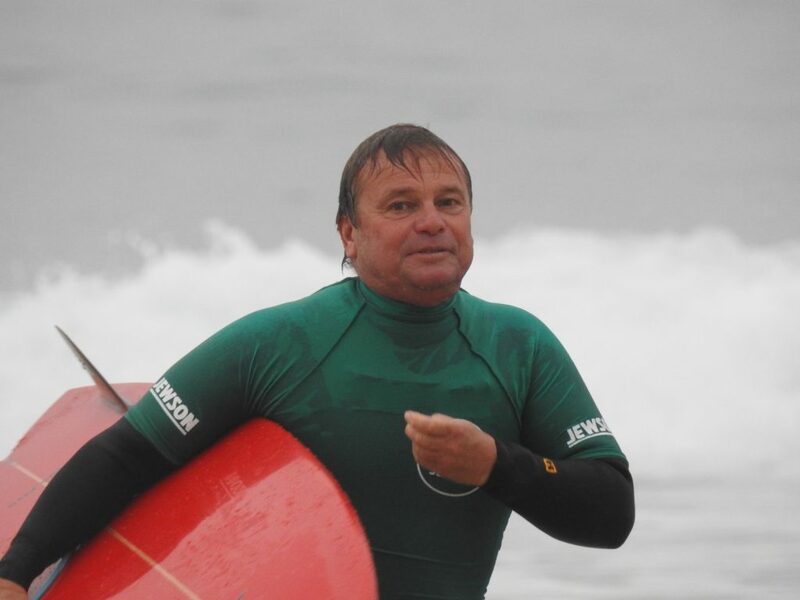 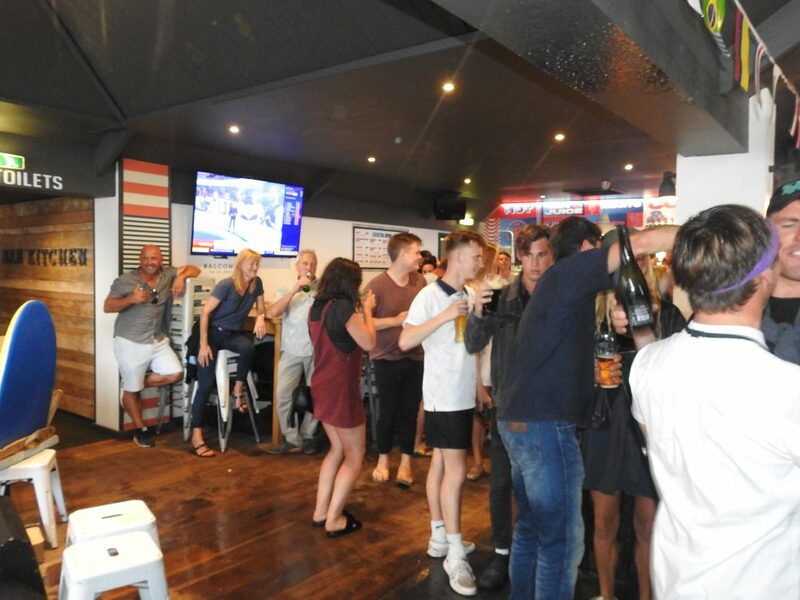 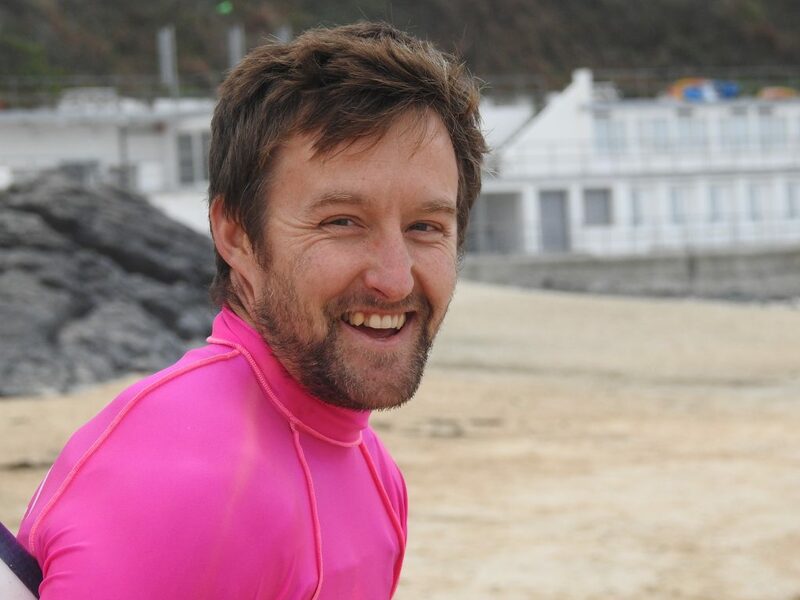 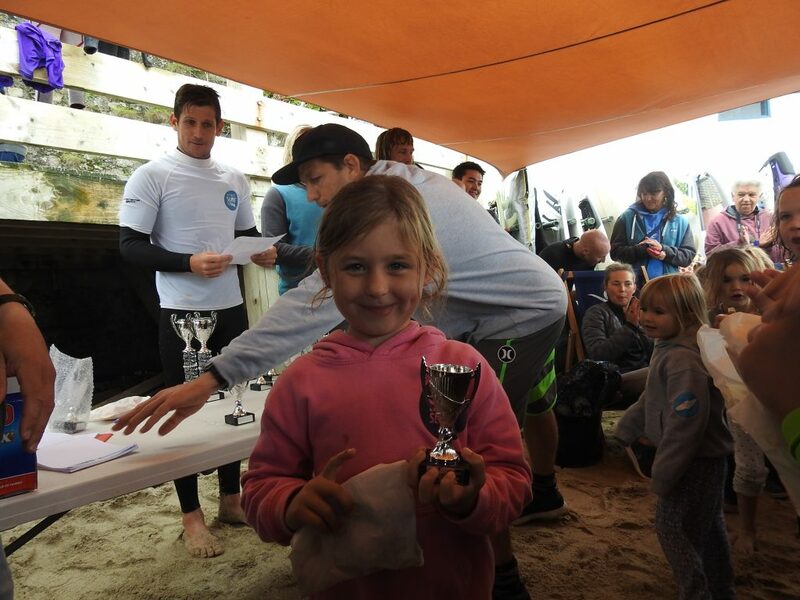 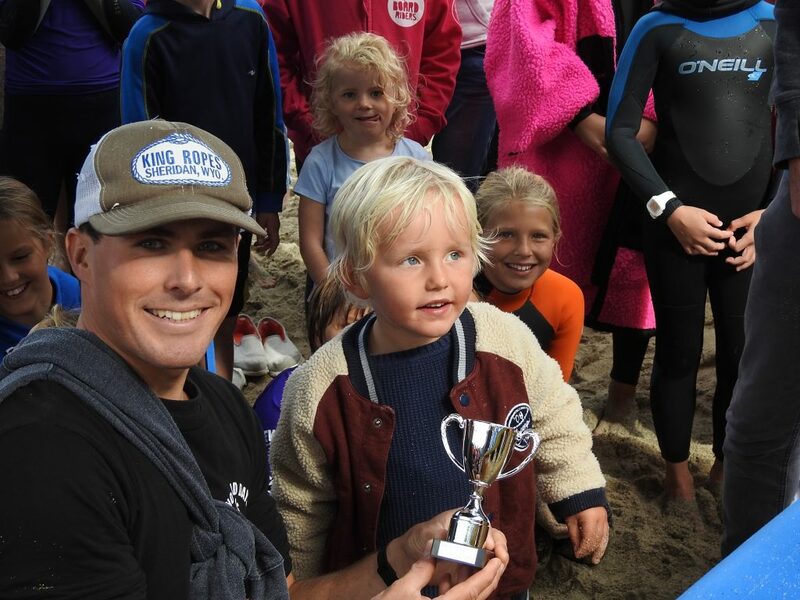 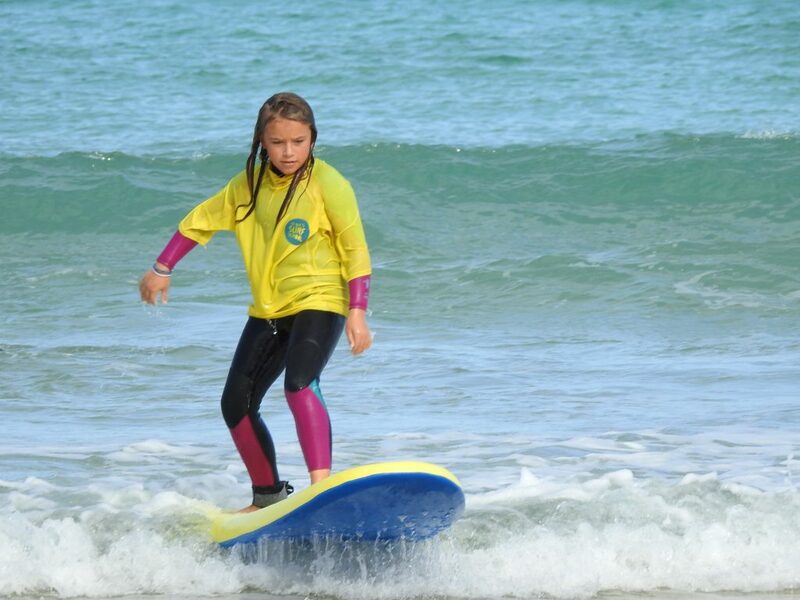 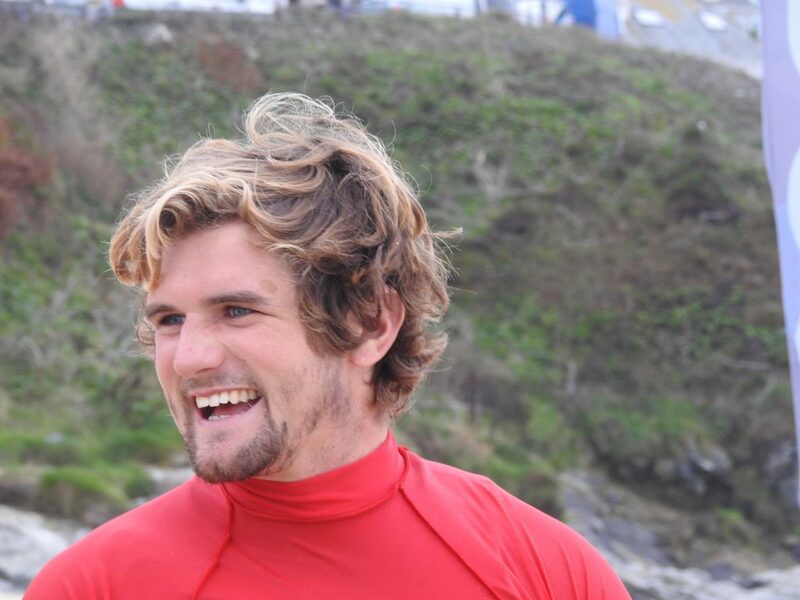 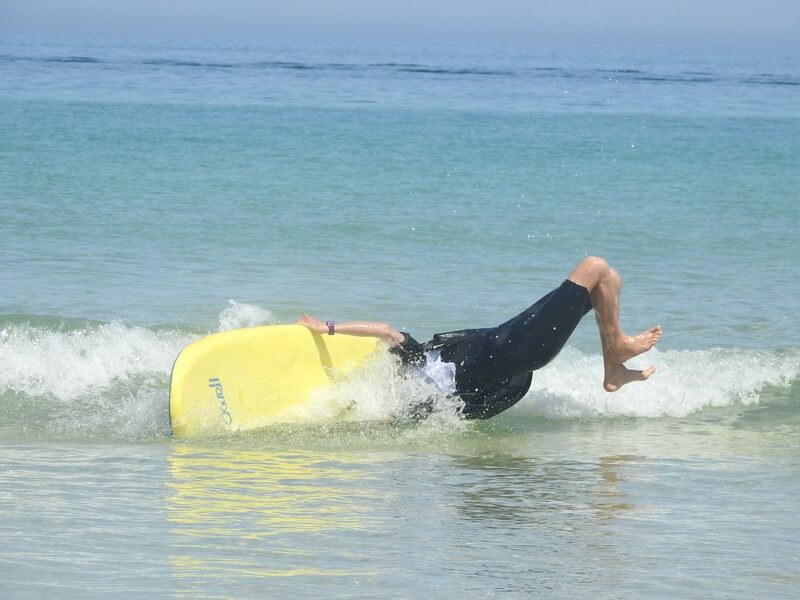 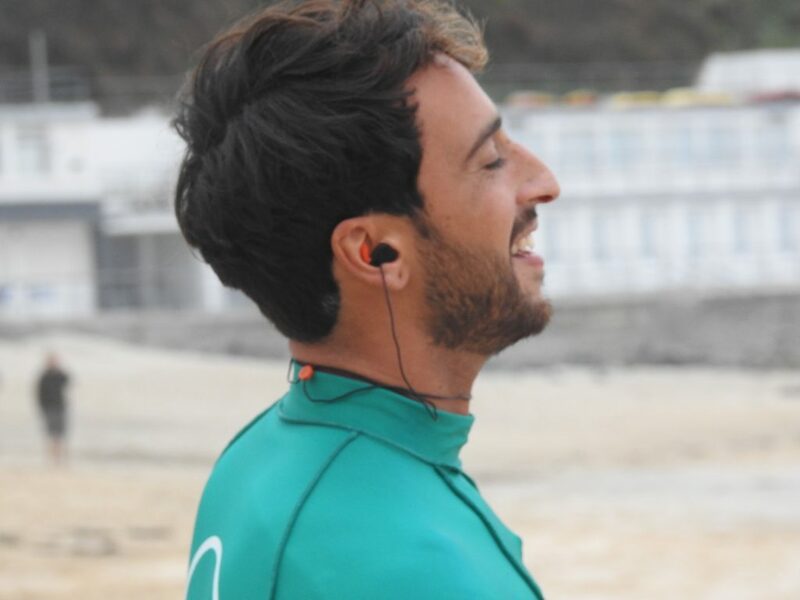 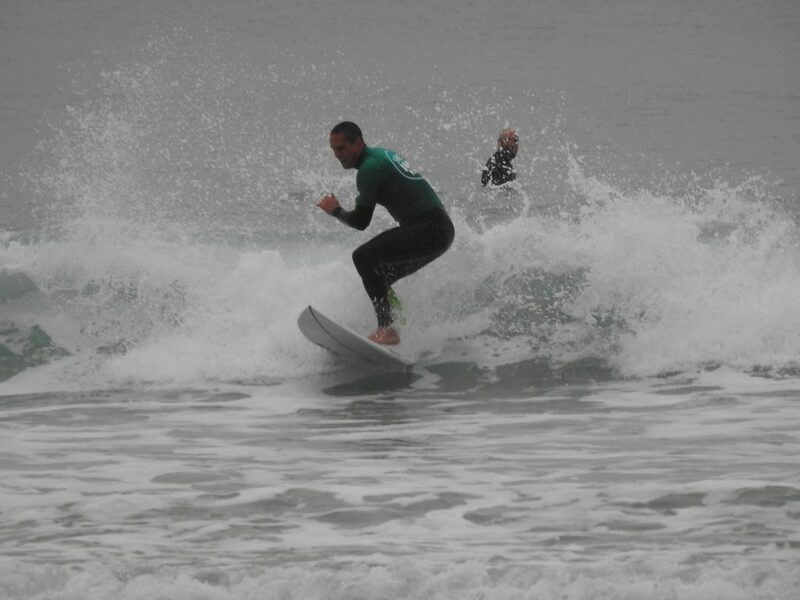 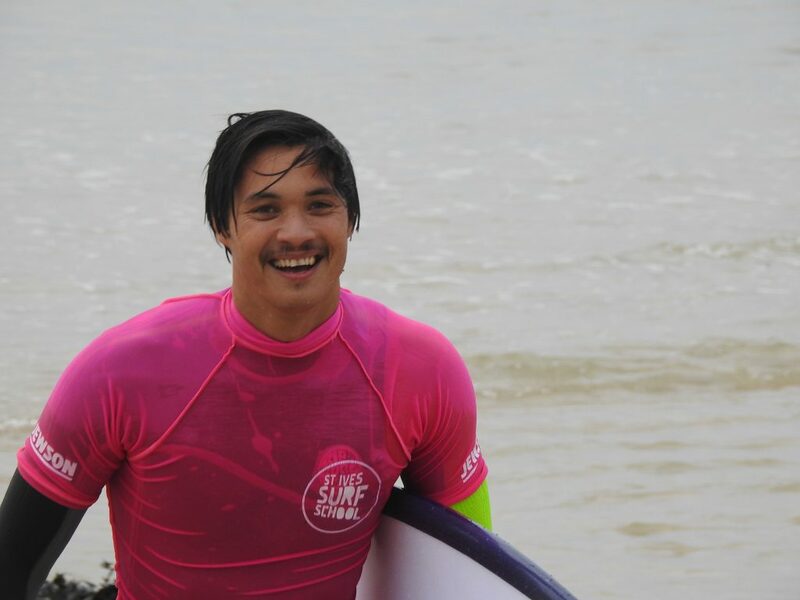 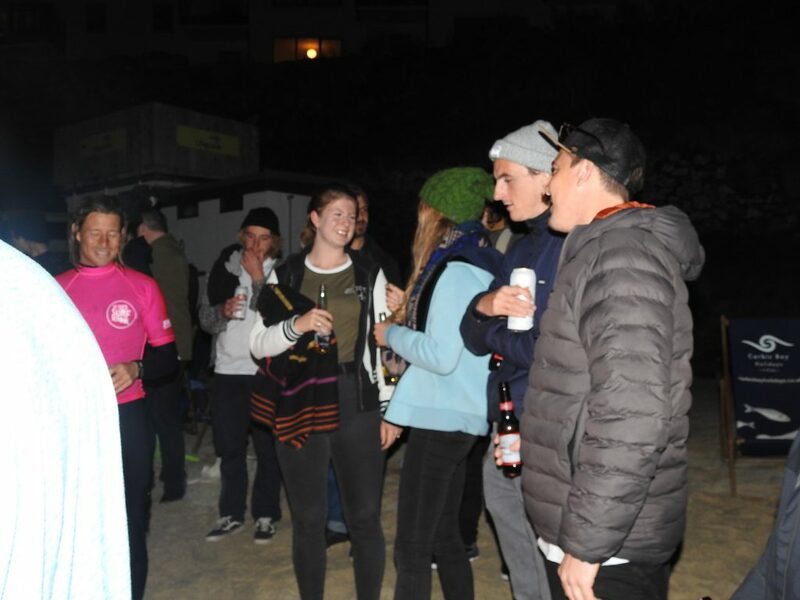 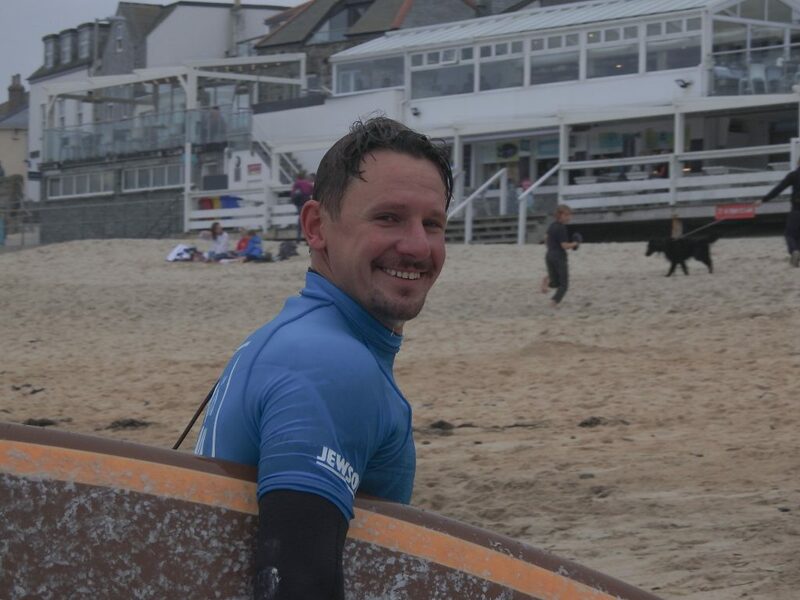 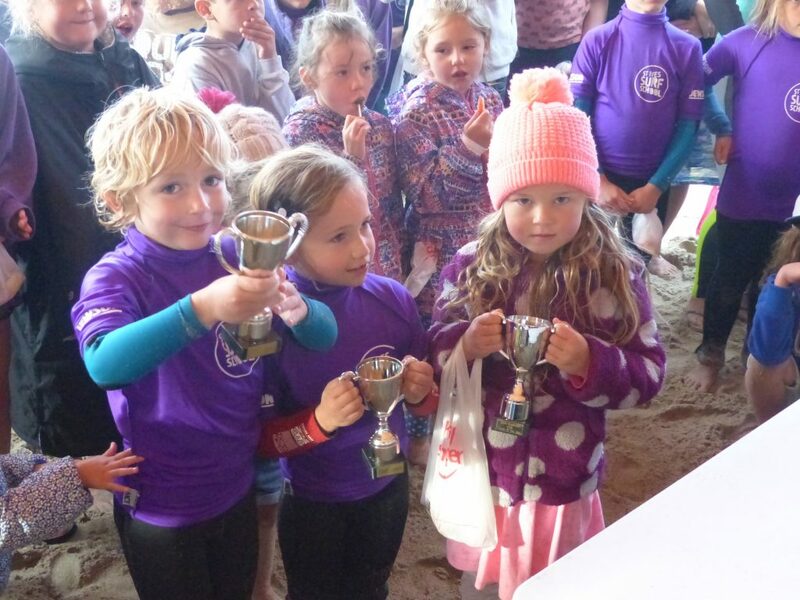 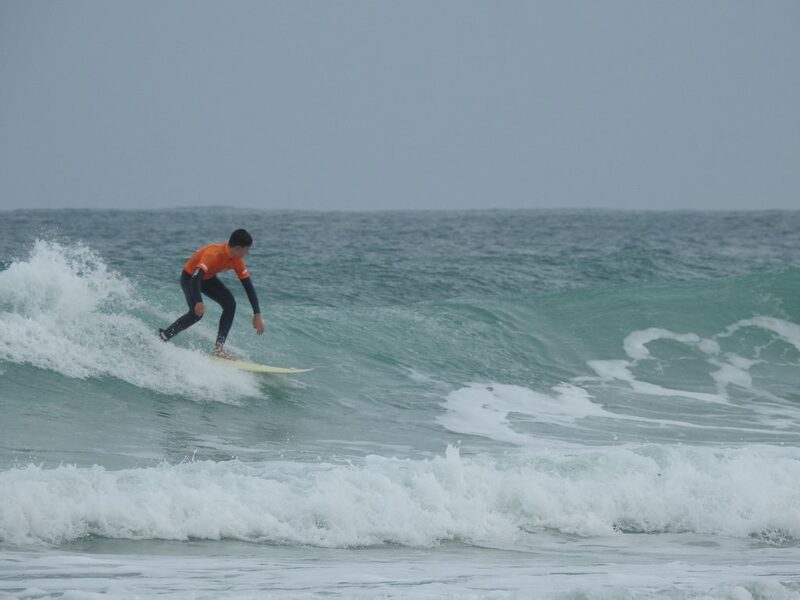 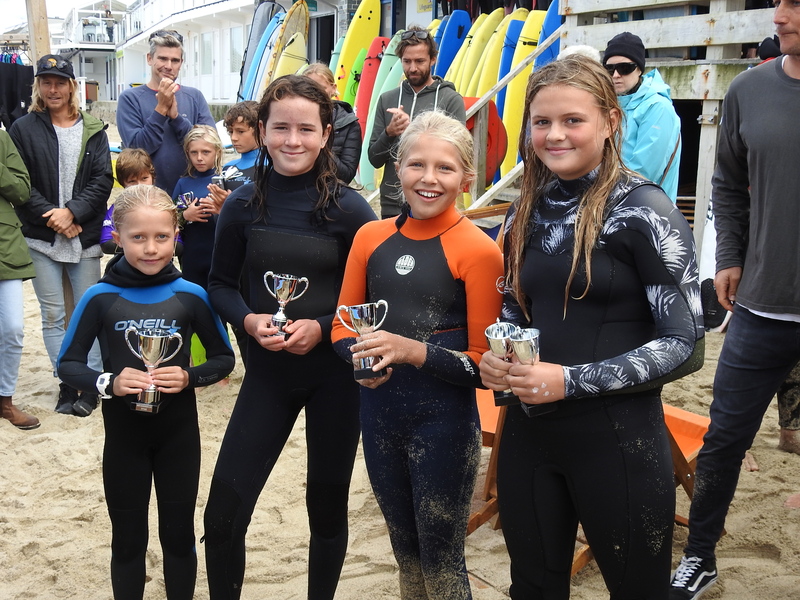 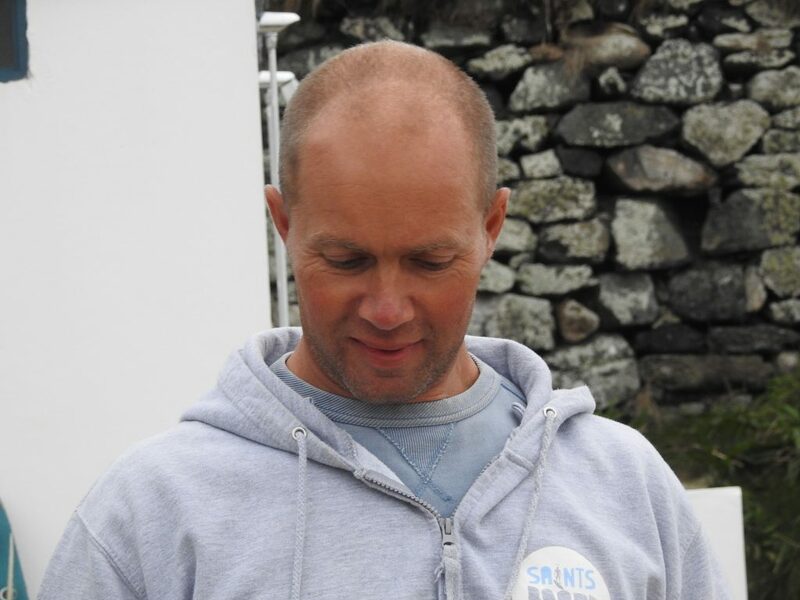 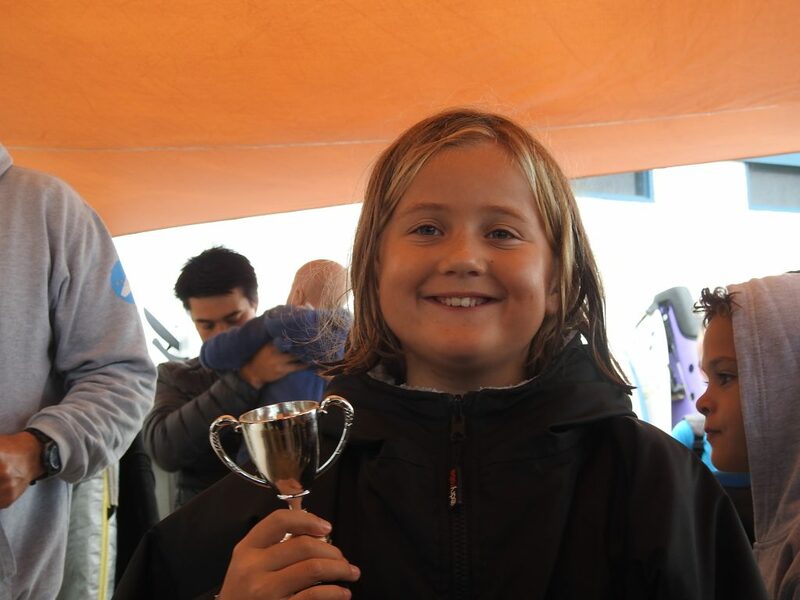 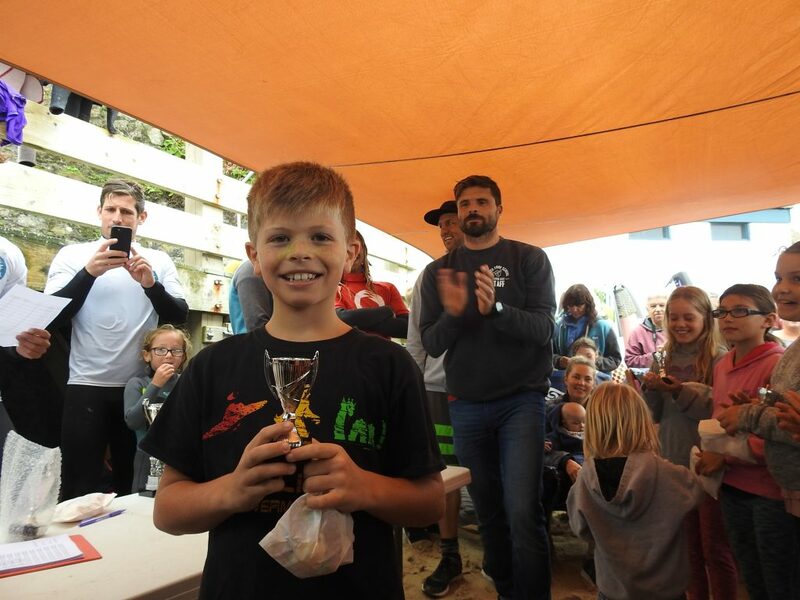 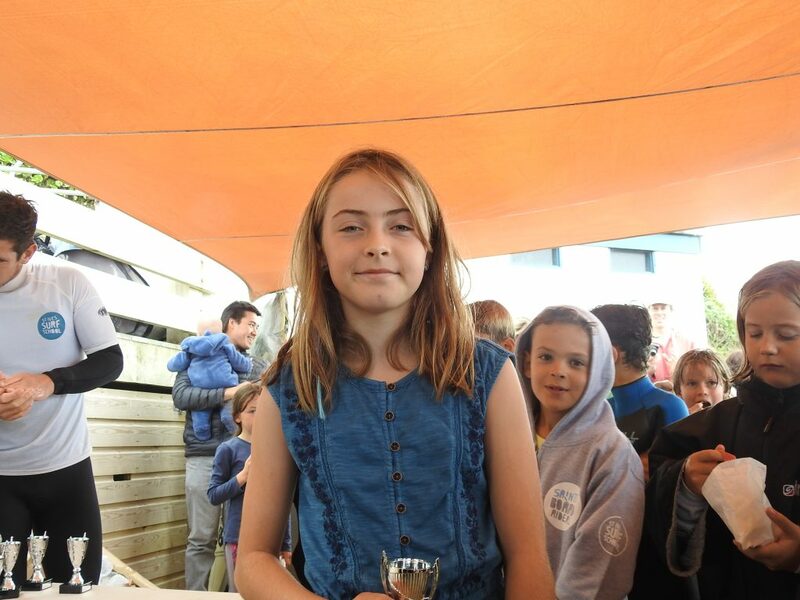 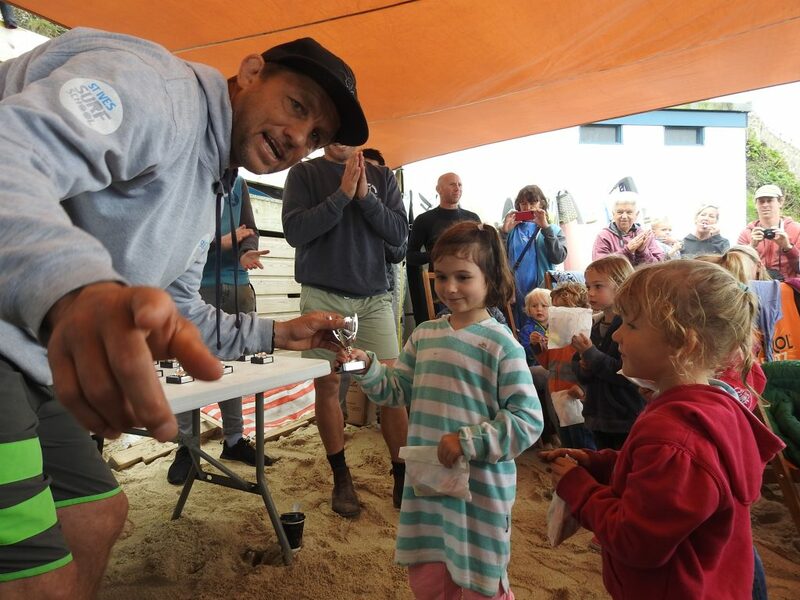 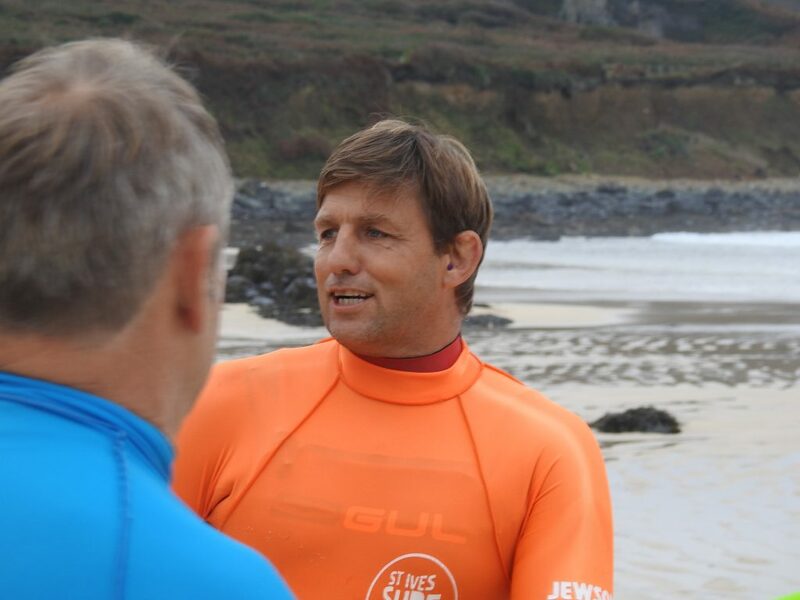 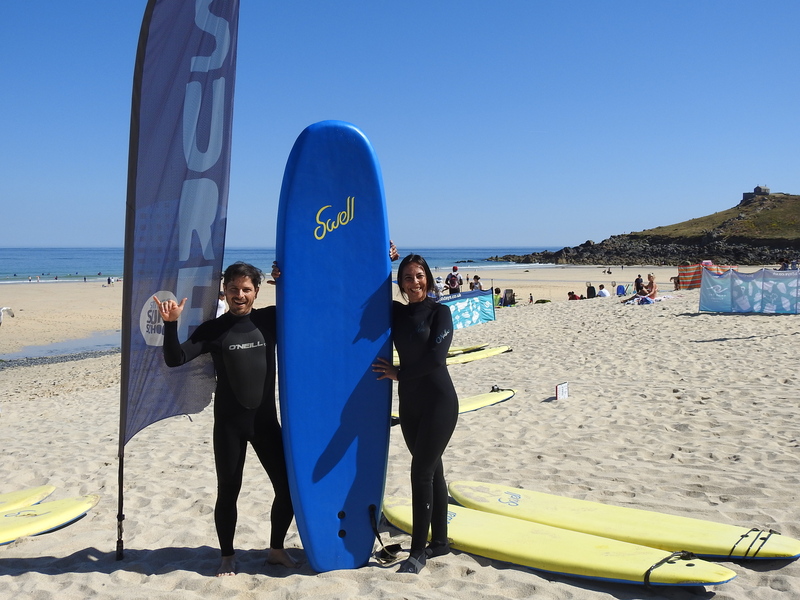 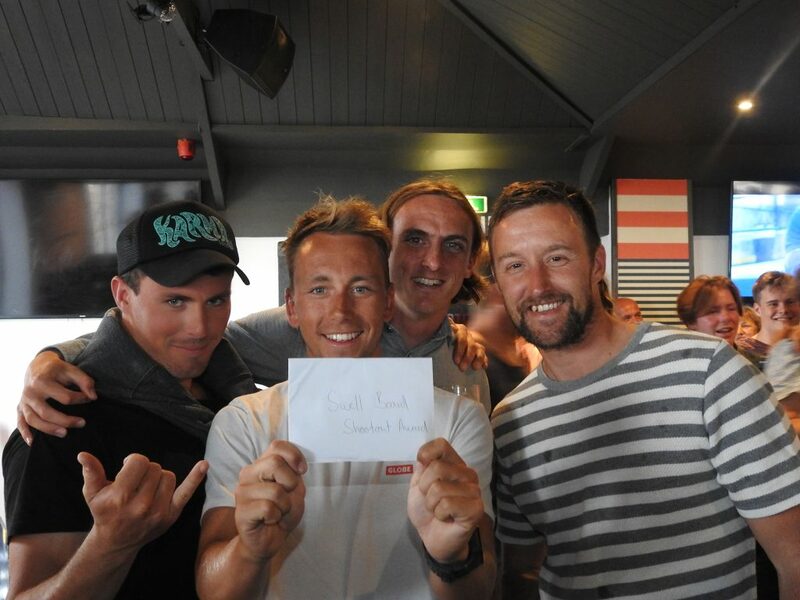 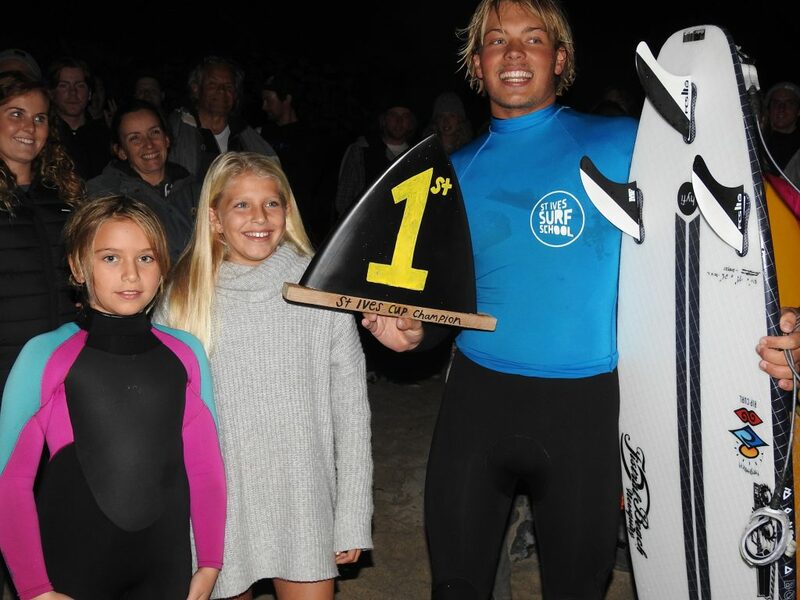 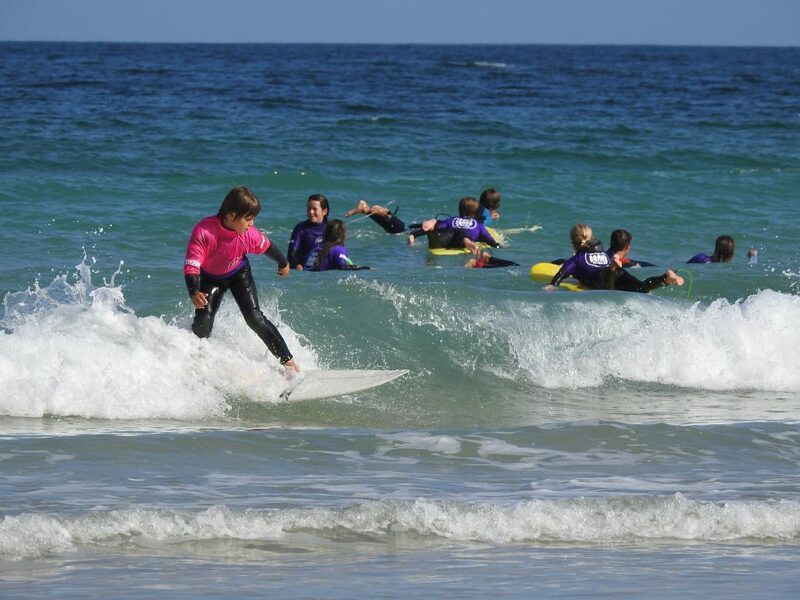 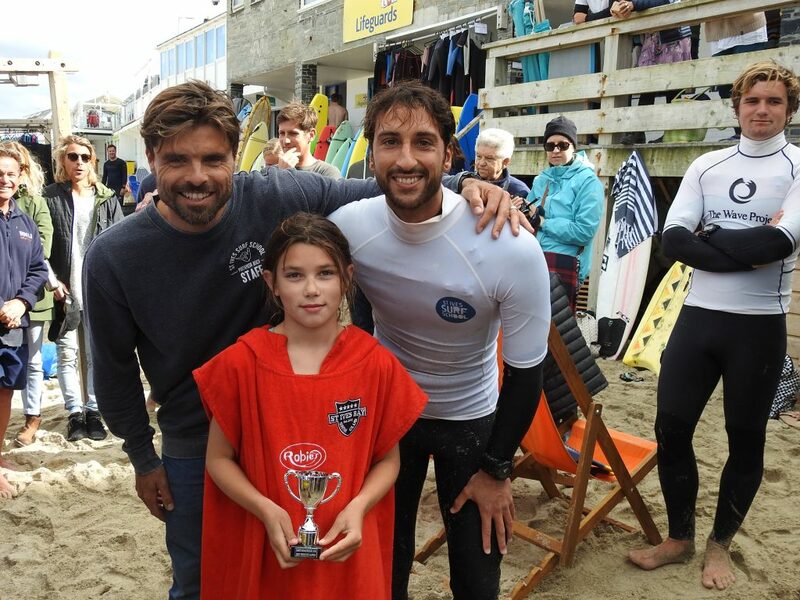 Some, or all, of the above-mentioned examples of the St. Ives Surf School’s involvement in enabling participation in the sport must have been among the reasons why it was awarded the prize of Surf School Of The Year. 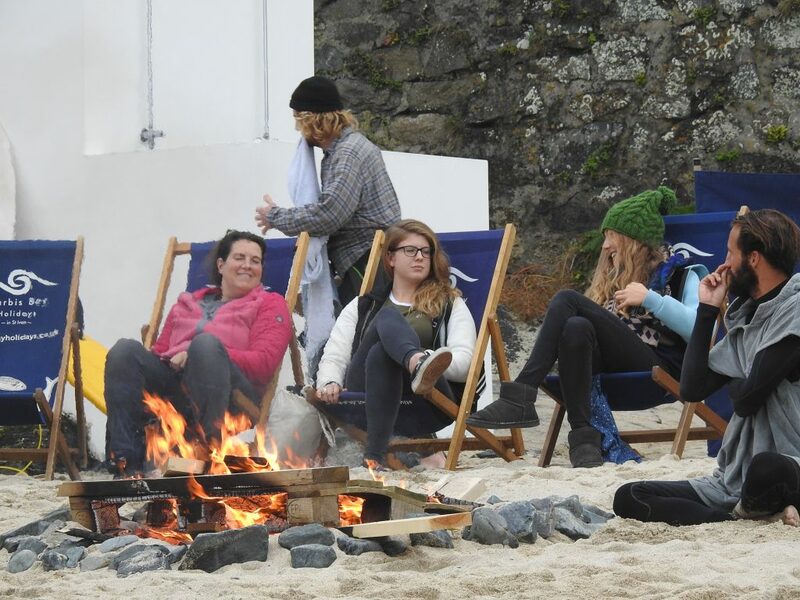 It is richly deserved, and I for one am delighted that it’s here in our town on our beach. 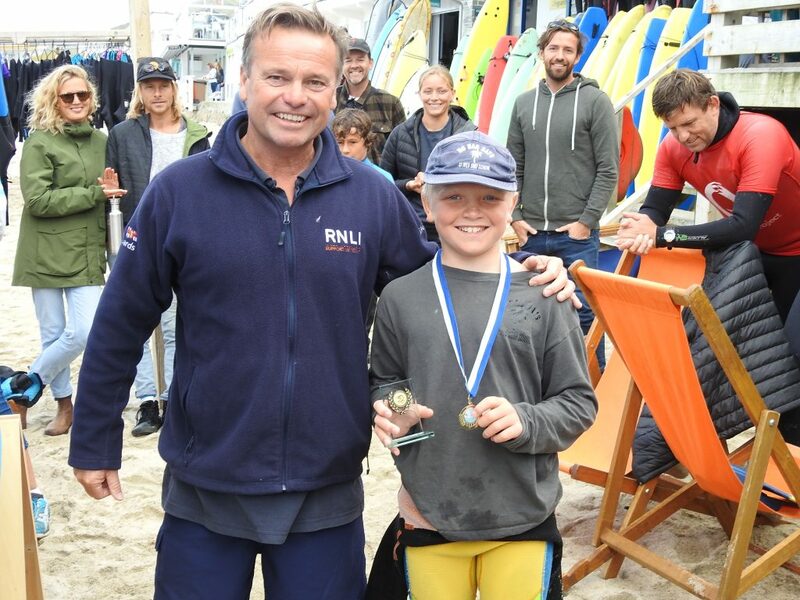 Well done Harris and his team!